I am looking back. My neighbors are still waving. Then I am out of sight and I am gone. For the tenth consecutive year in a row I am doing a medium to large cycling trip. This time I will be staying in Europe. 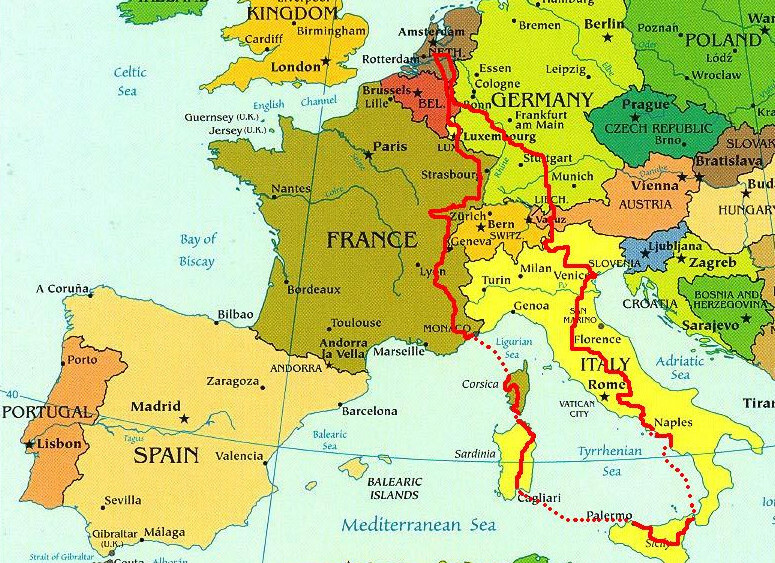 The idea is to go through Germany to southern Italy over Sicily and to cycle back home over Sardinia, Corsica, France and Belgium. An overall estimate shows me that it will be around six thousand to seven thousand kilometres to fully realise the plan. But I will not be looking forward this far. The last months have been very busy. Yesterday I have had exams, this morning I packed my things for the journey, I did not have any time at all to barely think about global route options. The beginning will be easy in any case. I agreed with Marco Duiker and Willem Hoffmans to meet in Gulpen, Southern Limburg. They will be cycling with me for three days and then they will take the train back home. It is pretty sunny and quite warm. It is 12 o'clock in the morning as I am cycling towards the Utrechtse Heuvelrug. I would like to take in as many hills as possible. 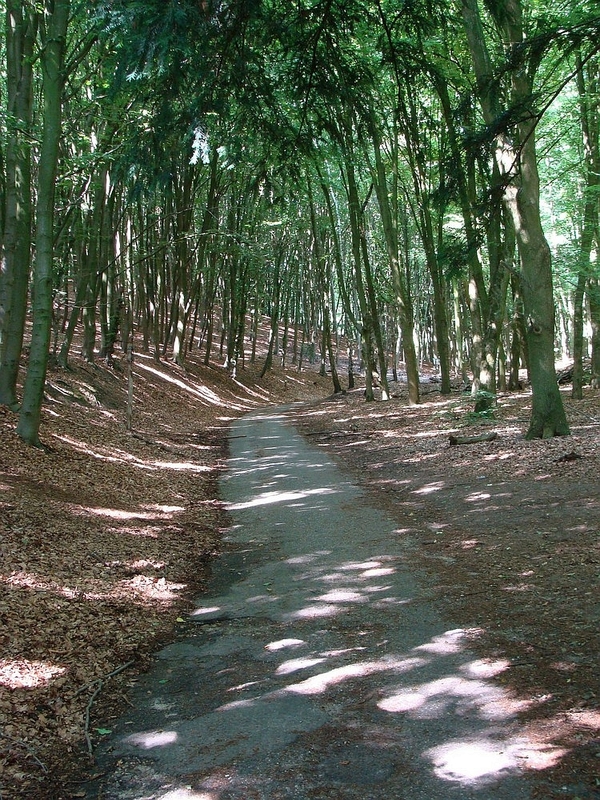 So the first option for climbing is the Heuvelrug, a little climb called the Ruiterberg. I pass this area regularly on my racing bike. Now I am cycling with a trekking bike with heavy luggage so I am proceeding almost two times as slowly as I am used to. I cross the Heuvelrug again over the Amerongse Berg and I am cycling further to Rhenen and I am crossing the Heuvelrug for the third time over the Grebbeberg. I will remain in the rhythm of climbing and descending these small hills and now I am climbing a new hill called the Wageningse Berg. After Doorwerth a last major hill in the Veluwe called the 'Italian road' I cross. I reach Oosterbeek where I take the ferry over the Rhine. I am in the Betuwe region now. There is a lot of headwind on the flat areas on the way to Nijmegen. In Nijmegen the hills return in a region valled Berg en Dal, literally 'Mountain and Valley'. As there are no real mountains in the Netherlands the Dutch have come to think these tiny hills are true mountains. After a few nice climbs in the Berg and Dal region I finish my first day in Groesbeek. I succeeded to take in as many climbs as possible in the "Dutch Mountains". Tomorrow I will be on my way to South Limburg. It is a beautiful summer morning as I start cycling at 8 hours in the morning through the last hills of Berg en Dal. The landscape is strikingly hilly, I feel like being abroad. 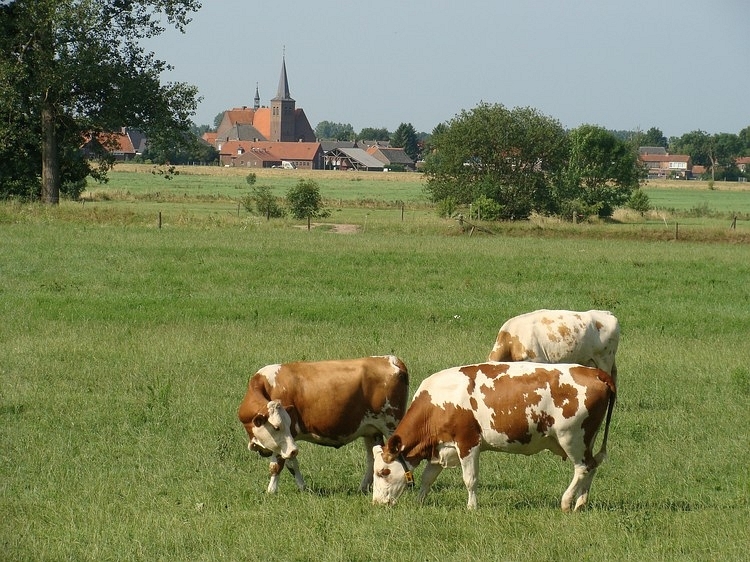 But the Berg en Dal area is only small and soon I am back in the uniform plain countryside that the Netherlands for the large part consists of. An atmospheric piece of Limburg leads me to the National Park Maasduinen. I am crossing the area over numerous small bike trails. The Maasduinen appears to be a mysterious phenomenon. You do not see them but you do feel the climbs. More specifically, the climbs are there but they do not bring me an inch higher. The wind is starting to bother me as well. After almost 3 hours I have done only 45 kilometre when I see a bicycle sign: 24 kilometre still to go to Venlo. I am looking desperately at my map: is it still that far? I had agreed with my friends to meet in Gulpen tonight so I do have a bit to go. At least a 100 kilometres. How could I misjudge the distance? The next time I will study maps before I go away. The smooth blue sky has been replaced by a uniformly gray sky. But the air is still warm and humid after the weather change. It is sodamp that the air around me itself seems to sweat. Along the beautiful small town Arcen I cycle to Venlo, where I followthe River Maas towards Roermond. Not a nice route but I must make haste. 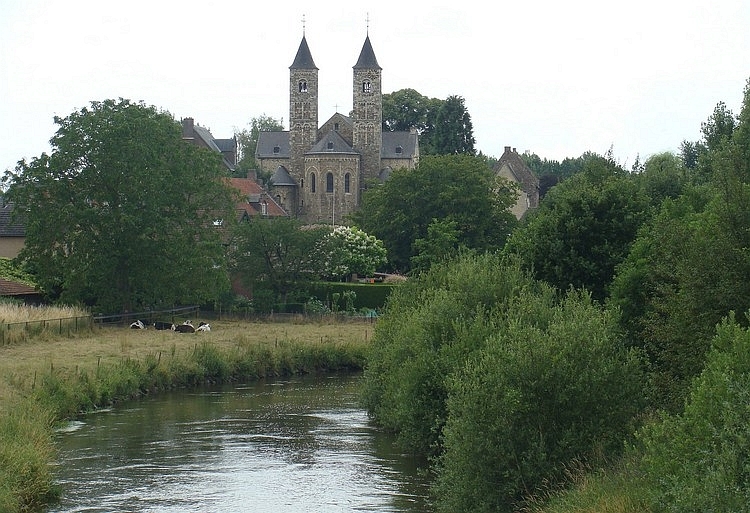 The highlight of the day is a bike path from Merlich to the beautiful village of St. Odiliënberg. A threatening black sky hangs above the river Roer. Finally the rain comes and so the desired coolness. The wind turns to the west, so that the headwind is gradually tirning into a backwind. I am gaining distance significantly better now. I manage to avoid getting lost in the industrial ares between and Sittard to Geleen and I reach Schinnen at the foot of the hills of South Limburg. A beautiful, steep ravine brings me to a plateau but an unfortunate choice of route brings me on a road that leads me back again to Schinnen. I try one road further, which leaves from Spaubeek. This time I am more successful and after the climb to the plateau I descend into Valkenburg. On the way from Valkenburg to Gulpen I see the Keutenberg. The Keutenberg is a famous climb of the Amstel Gold Race. 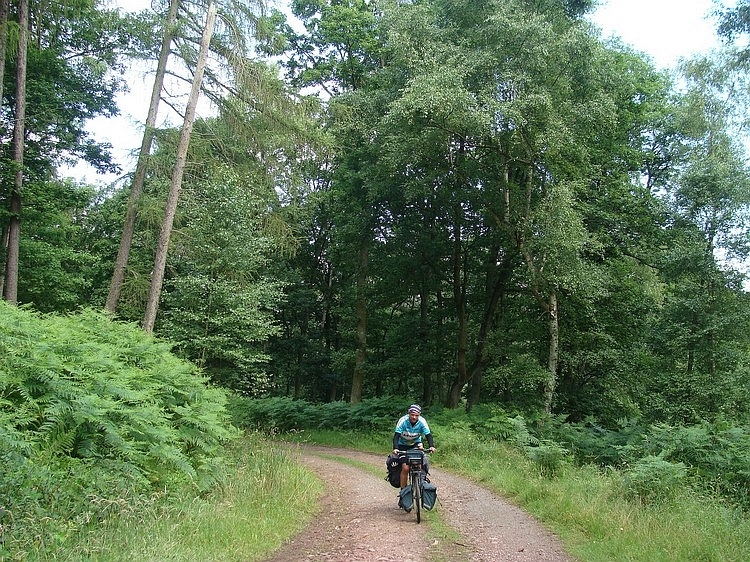 The climb has remarkably steep sections (21%) and is thus unsuitable for a fully loaded bike. But it is a nice climb and I think that it is a nice test. So I pull my bike up the steep slope. As I reach the top, I am immediately punished with a hellish Thunderstorm because of this idle vanity. The storm comes my way. As fast as I can I cross the plateau and descend to Gulpen. I climb to the campsite and I am just in time at the camping before the storm breaks loose. Just as the storm is over, Willem and Marco appear. We are all ready for the journey. To my surprise the weather is good when we get up. We pack our luggage and now we are cycling over Epen to Eperheide. In a cafe at the foot of the Camerig hill we are having breakfast and enjoy the beautiful weather. After our breakfast we climb the Camerig and follow atiny road to the Belgian border. Over Gemmenich and Kelmis we proceed and a few hills further we are in Germany. The weather has deteriorated and it is raing now and then. The last miles we follow a dirt road along a lake in the River Rur. After the continuous climbs and descents through the Ardennes and the Eifel regions and after the 166 kilometres yesterday I am glad as we arrive at the camping of Heimbach. Our second day in the Eifel region. After the forested landscapes of yesterday, today sees more open landscapes with grain and corn fields on the plateaus. The gray, windy weather remains but sometimes there are bright moments as well. The occasional spooky circumstances adds a special atmosphere to the day. After 83 kilometre we find a campsite at to the Nürburgring racetrack. The circuit is located at 600 meter altitude close to the higher peaks of the Eifel. The camping is an experience in itself. We find ourselves between car and motorcycle freaks. The site is very large but nevertheless quite full. Before each tent there are towers of beer crates. Everybody plays music and plays it awfully hard. It appears that AC/DC is still extremely popular but also inferior German hard rock bands blast with full volume through the speakers. The dress regulations are clear: as much leather as possible. We seem to be quite out of tune with our cycling clothes and fleece pullovers. All in all I still quite like it here. Oddly enough the campsite is very decent and clean. The bathroom is spick and span. Along the edges of the camp are restaurants that offer excellent quality. The camp store is run by a delicate old lady, who apparently has no fear of the rough-looking men. Between eleven and twelve hours, everywhere the music is turned down and I have a very good nights sleep. We are crossing the last hills of the Eifel. 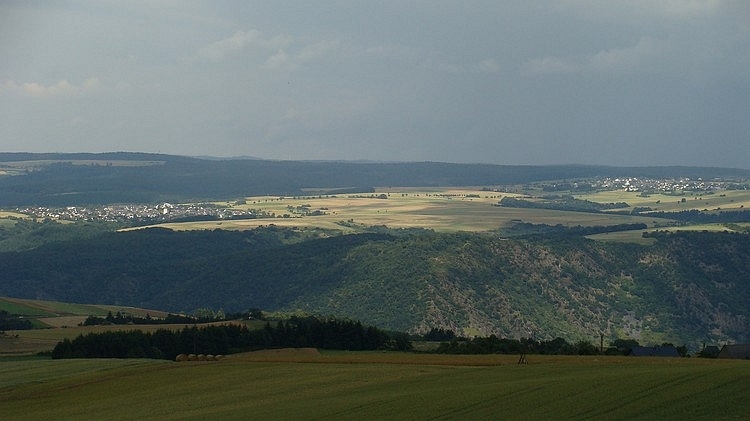 This part of the Eifel has volcanic origins and sometimes there are faint crater shapes visible in the landscape. The weather is still unstable. Bright spells and jet-black clouds play a game of light and shadow. Marco does not feel well today. But he wants to continue, so we keep going. 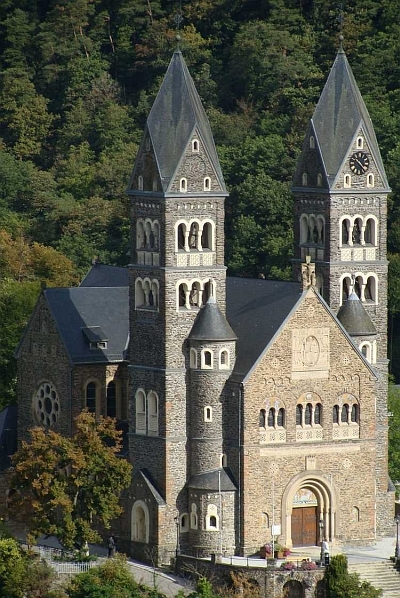 We go down to the river Mosel and steeply up again to the plateau between the river Mosel and the river Rhine. This is the area where the two rivers cut deeply inside the landscape. The slopes along the Moselle are pretty steep. No vertical cliffs though, but impressive enough. New showers and a cracking thunderstorm try to hit us but they miss and in an agitated hurry the black clouds roll over the fields, away from us, contrasting wildly against the brightly lit grain fields. The last kilometres to the Rhine Valley we cycle on a dirt road and escend into Oberwesel, a medieval town full of atmosphere and stuffed with mediaevil towers. We have made it, despite Marco's physical discomfort. This is the last day together. We celebrate our last evening in town, wining and dining. Tomorrow Marco and Willem will return back to Holland by train and I shall be on my own again, cycling further towards the sun. We say goodbye at station Oberwesel. I am alone again. I pick up the thread and along the river Rhine I bike to the south. There is a bike path along the Rhine. I can dream away on my bike unimpeded by cars. Again, it is gray but dry weather. 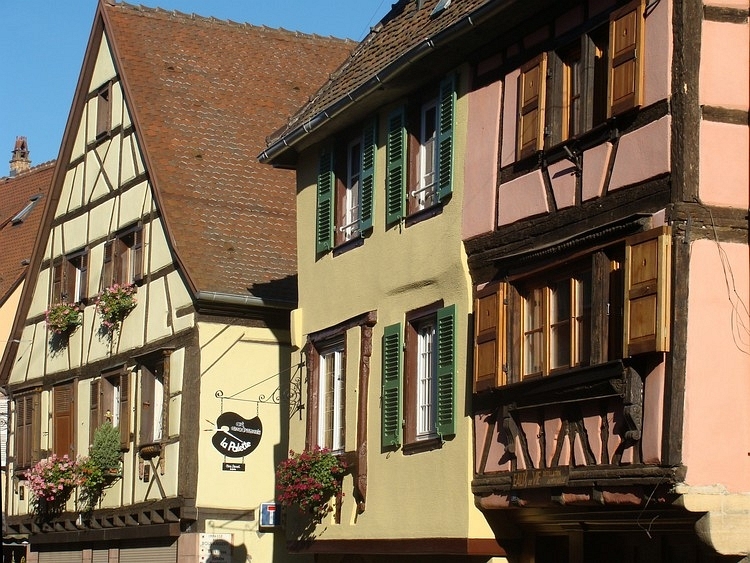 The road leads through beautiful towns with an abundance of timbered houses and steep vineyards. 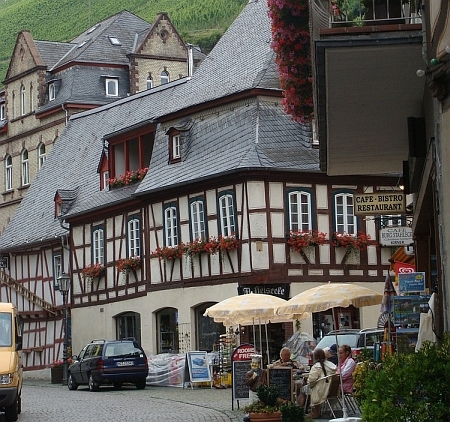 Bacharach is very nice, and so is the view to Kaub at the other side of the River. 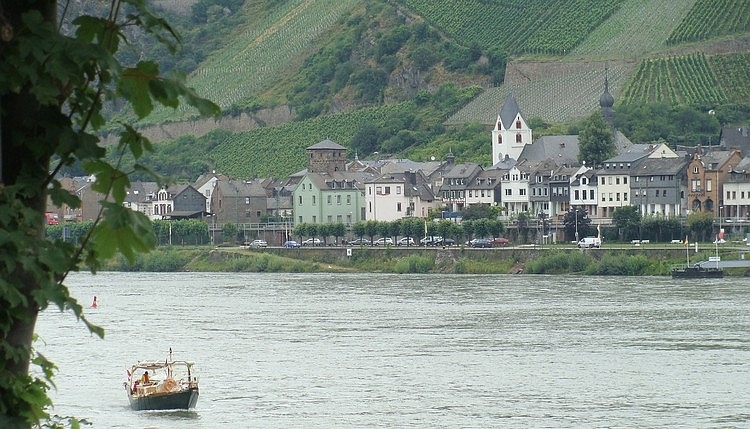 Between Koblenz and the small town of Bingen the river Rhine snakes through the hills of Central Germany. South of Bingen the valley widens and the beautiful landscapes are more or less gone. This is the place where I leave here the Rhine Valley and I climb up to the plateau south of Bingen, also to avoid th congested areas around Mainz. 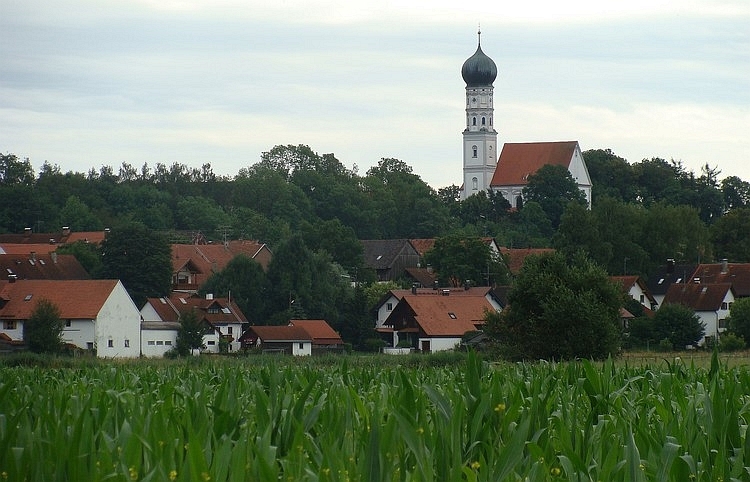 I cycle over Wörrstadt to Worms, a surprisingly nice open route with panoramic landscapes with waving corn fields. In Worms I reach the Rhine Valley once again. And what a difference with the Rhine Valley at Oberwesel and Bacharach! 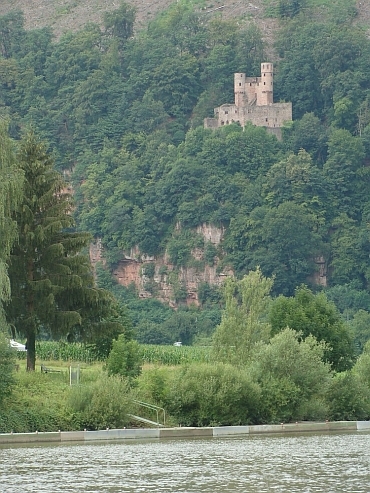 Here the Rhine lies in a broad valley with many industries. I need to cross the Rhine Valley here in order to reach more beautiful hill landscapes to come. Two problems arise: there is a strong headwind and the distance that is indicated on the signs to the nearest hillside village is much longer than I had expected. I have no accurate map of the area covered but I decide that I 'feel' that I can find a faster route. That decision raises a third, fairly predictable, problem. I get hopelessly lost. The hills are visible, so I know what direction I should continue but all the roads in that direction eventually bend towards the huge industrial areas and urban ugliness of Mannheim. It is like an evil curse is working against me, everything turns up messy. Whatever I do, like a magnet I am being drawn to Mannheim. In a final attempt to avoid the big city, I cycle into a forest on a dirt road without indications. There is still nothing indicated and I get lost more and more hopelessly. Overall I have cycled for fifty kilometres in a completely unfocused way yet, it is 8 o'clock in the evening and I have to ride at least twenty kilometres still. At random I find my way through the woods and half an hour later I have finally found a way out of the woods, in the civilized world. Civilized... That means I am finally in Mannheim in the end, despite my frantic efforts to avoid Mannheim. Shows the meaningless of fighting against fate. And now I have to try to leave Mannheim as soon as possible. But also that project does not run smoothly. I try and try to find a way but I am stuck in residential neighborhoods. Eventually I decide to leave Mannheim over avery busy road, unsuitable for cyclists, in the hope that I can find a quiet side street soon. This time luck is finally on my side, as there appear to be bicycle paths towards the hills. After one hour cycling I reach the first camping in the hills. In the end everything is okay. Today I want to reach the heart of Schwaben. I want to visit a friend of mine in Künzelsau. 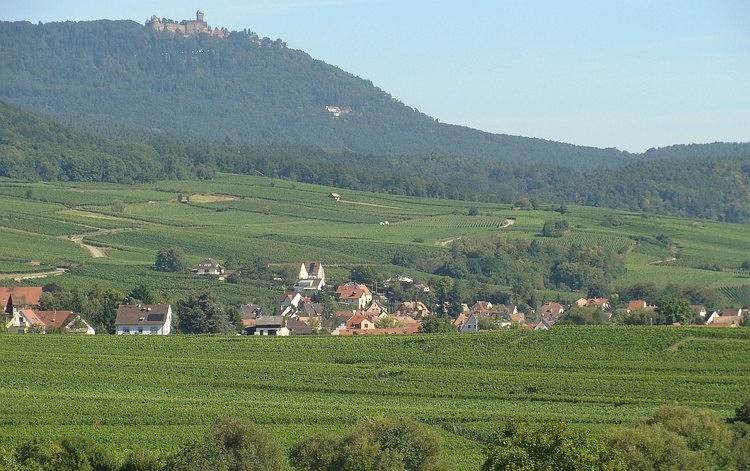 Along the edge of the hills of the Rhine valley, I cycle to the south. 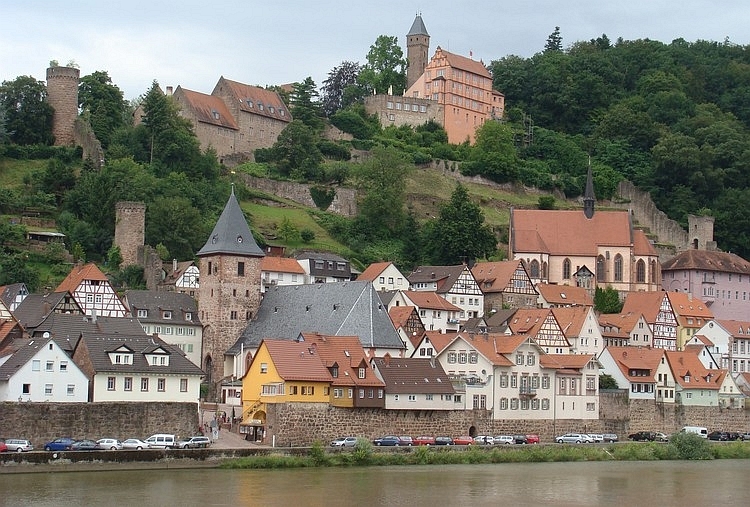 It does not take a long time before I reach Heidelberg, the oldest university town in Germany. The center of Heidelberg indeed breathes the atmosphere of a university town. 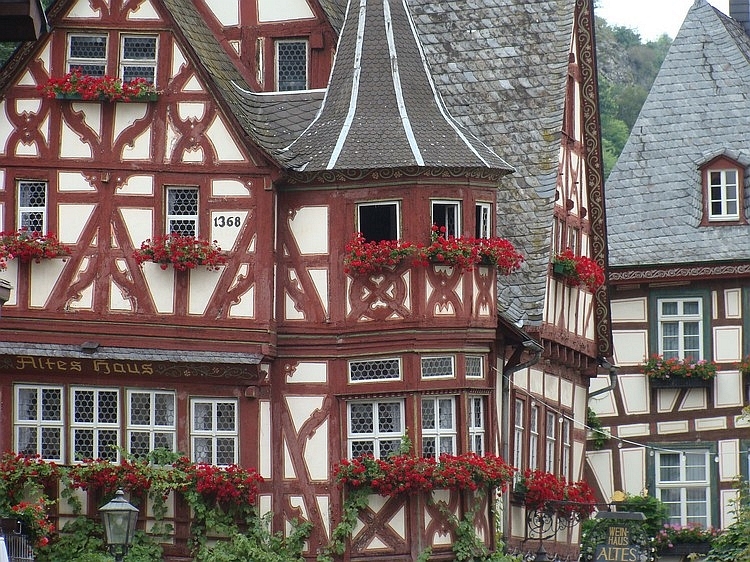 Unlike most large German cities, the old town has been preserved during the Second World War. 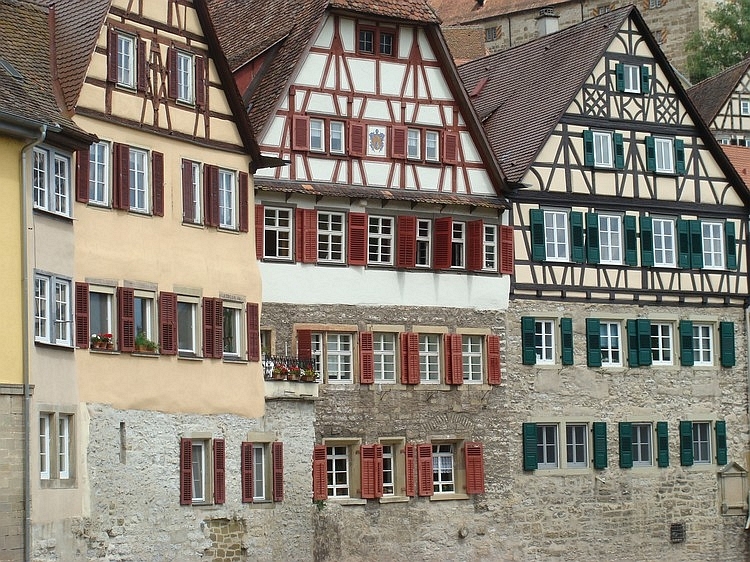 The city lies on both sides of the river Neckar, one of the main tributaries of the Rhine. After a brief visit to the old town of Heidelberg, I follow the course of the river Neckar. 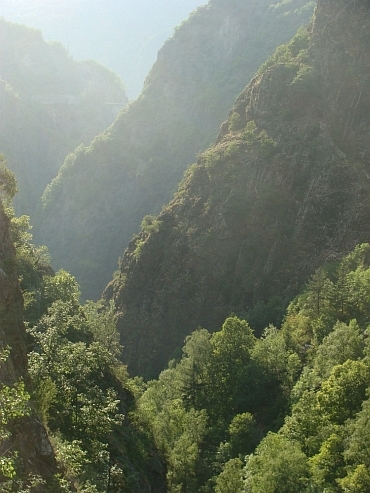 On both sides of the river there are forested slopes of three hundred meters high. The river winds its way through the landscape in wide arcs. As along the rivers Mosel and Rhine there are bike paths along the river which attract many cyclists. After a weekend with a social program, now I am alone on the bike. I have got rhythm from the first minute and I am feeling much more equipped for things to come than during the first week and I am really having fun now. I am cycling through rolling hills along the Kocher tot BraunsBach. Here start a series of partially unpaved roads towards Vellberg. 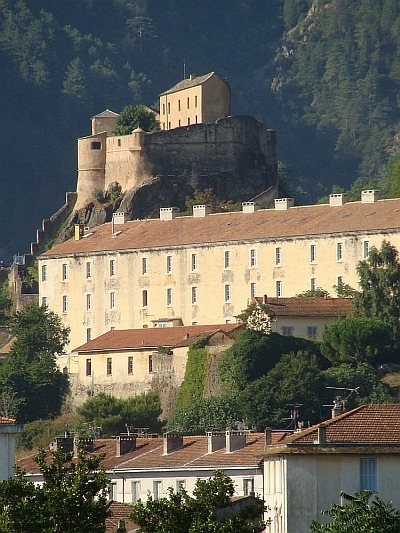 A nice ride through the hills and valleys brings me to the small fortified town of Vellberg. There are beautiful views over the valley of the Bühler. Germany appears remarkably bicycle friendly. Most of the time it is possible to cycle over well-built bike paths. Except for the area around Mannheim, where I actually got lost myself by constantly ignoring the road signs, I have had good experiences: quiet bike paths, patient behaviour of the car drivers, good and relatively inexpensive facilities. I am cycling dozens of miles through pleasant hill landscapes. At the end of the afternoon dark clouds roll in from the west. This time there seems no possibility to escape the rains. 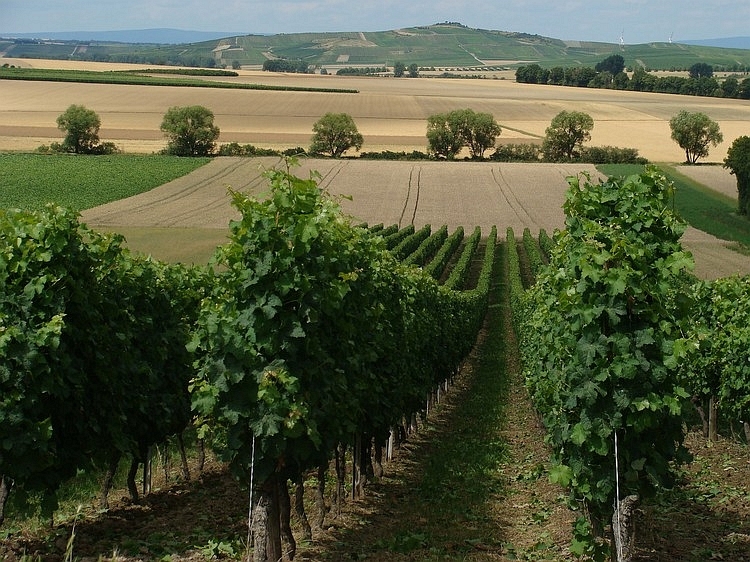 It is completely cloudy when I reach Neeresheim, a village that lies between the beautiful green hills of the Danube region. 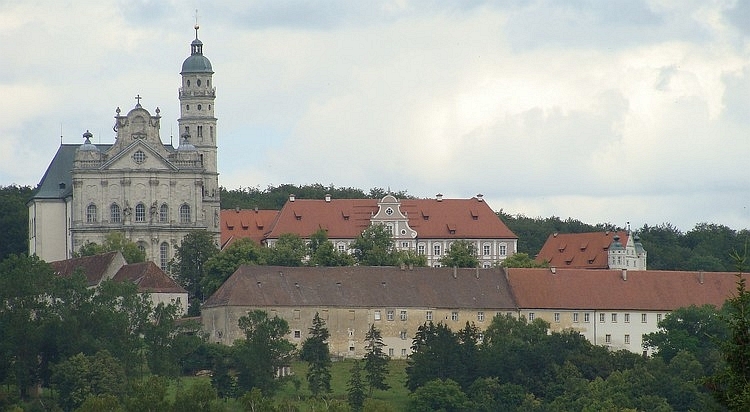 A huge monastery with many elegant, baroque ornamentation dominates the view. The dark weather adds to the atmosphere. I am climbing over the hills and descend into the valley of the Danube. It is still raining when I descend to the wide plains of the Danube. In Mörslach I reach the campsite where I will spend the night. I meet Andre and his wife and son. Andre and I are having interesting scientific and philosophical discussions. 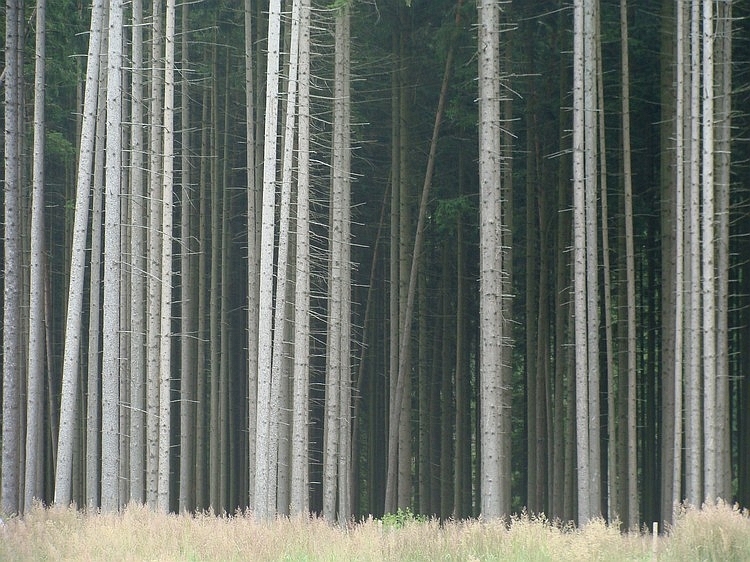 Do trees really live inside or do not they? Is life animate or do we only respond to chemical or physical laws or does something or someone else as pull the strings like a puppeteer on the strings? Is there a cause for life on Earth or is life a cosmic aberration? What do we really understand of the essence of life? I am awakened by a thunderstorm. A moment later Sebastian and I are having breakfast together. It is only half past six now, Sebastian has to work the whole day and for me it is okay to get up early and I will have a long drive ahead. I could be able to reach the foot of the Alps today. At half past eight we say goodbye and I continue my journey. The storm is over now but heavy clouds are still hanging around and heavy showers still reign over the surrounding hills. In one or another way I am lucky to cycle between all the showers to Landsberg am Lech. I am at the 'Romantische Straße' now. 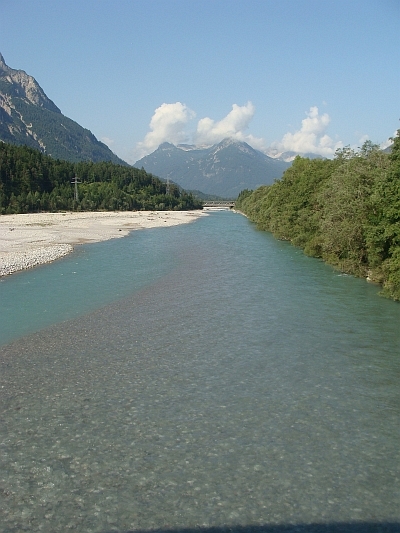 This famous route roughly follows the course of the river Lech in the direction of the Alps but sometimes the route meanders through the surrounding hills. 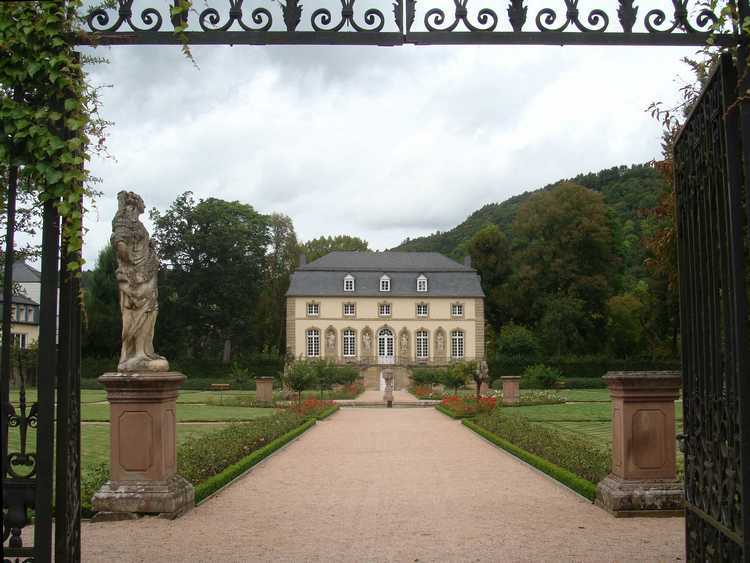 There are beautiful towns, impressive castles and baroque churches along the Romantische Straße. Dozens of kilometres in the distance I can already see a part of the broad wall of the Alps between the clouds and the rain showers. But now I am in the hills and I reach the village of Vilgertshofen. 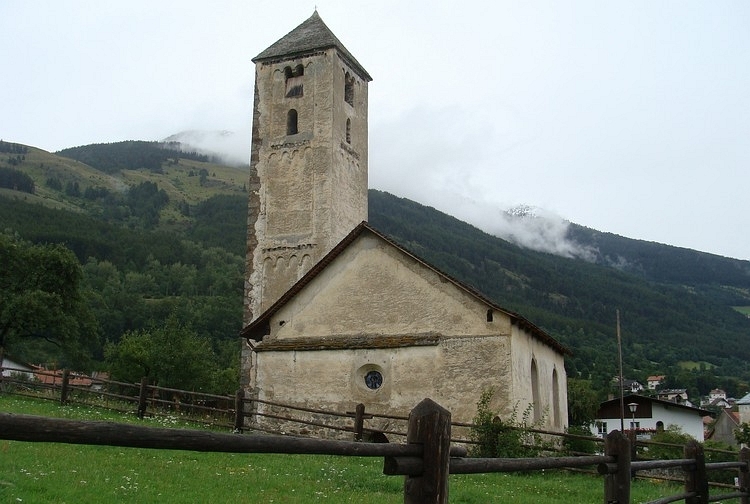 The village is known for its baroque Wallfahrtskirche which is beautifully situated between the hills. When I arrive, I see a young man walking around the church, the first person that I see outside since a long time. Twenty kilometres later I meet the same young man again. Elmar also appears to be cycling; he is doing a pilgrimage to Rome. 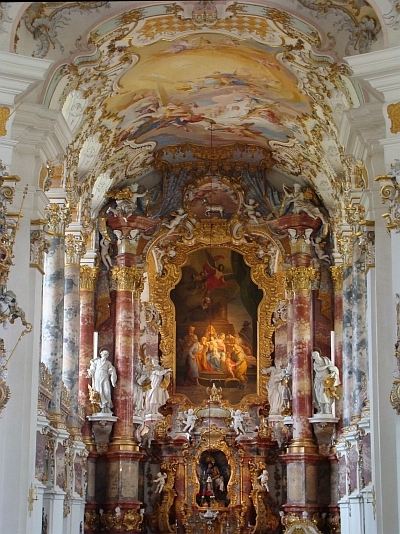 We both want to see the famous baroque Wieskirche in the foothills of the Alps and we are continuing together now. 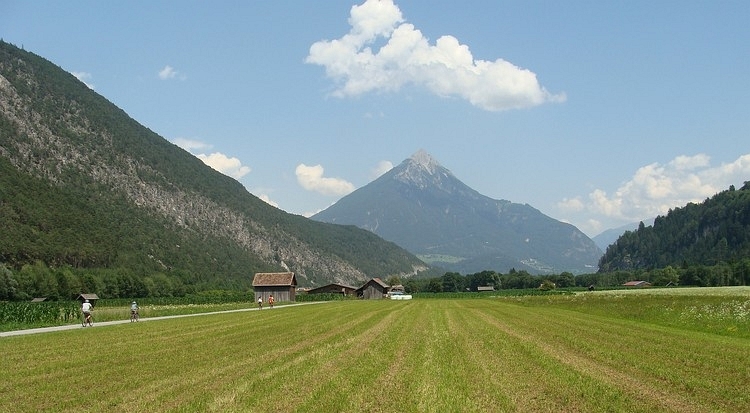 After climbing out of Schongau we start to climb the first foothills of the Alps. The mountains themselves cannot be seen. It has started to rain and it is really pouring now. It does not make the increasingly hilly landscape less atmospheric. Numerous small, winding bike paths lead us through pine forests and alpine meadows. 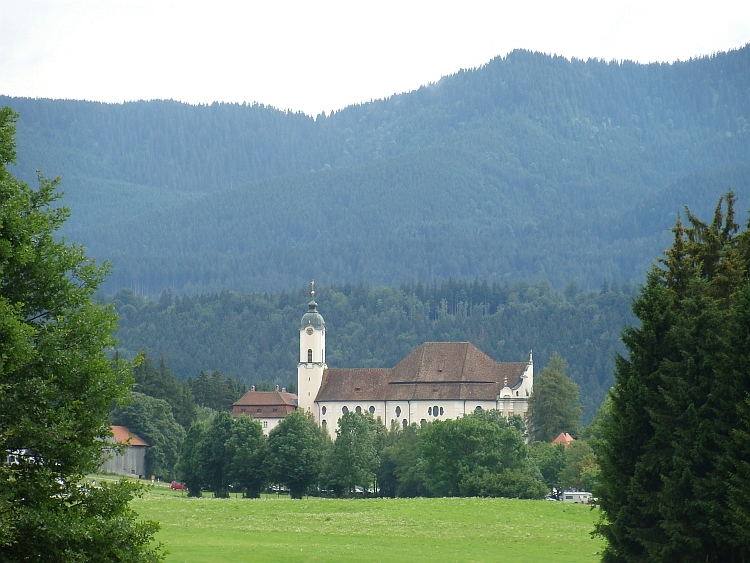 After one hour or two we reach the Wieskirche, which lies in a beautiful alpine meadow against the backdrop of a high mound with dark green conifers. After a visit to the lavish, high baroque church, Elmar and I say goodbye. Elmar follows the Claudia Augusta route to Rome over the busy Fern Pass, while I want to cross the much more alpine Hahntenjoch tomorrow. The dark clouds have gone now. The sky is cleared from the clouds completely and for the first time since the Netherlands the landscape around me is bathing in sunlight. When I reach a little pass, the Alps are suddenly at my feet. The rain has flooded all the dust out of the air, the views are razor sharp now. The sun is already low and lovely lights patterns provide a fascinating game of light and shadow. Below me lies a broad grassy plain with large lakes and many small villages. I descend to the plains and set course towards the Alps. 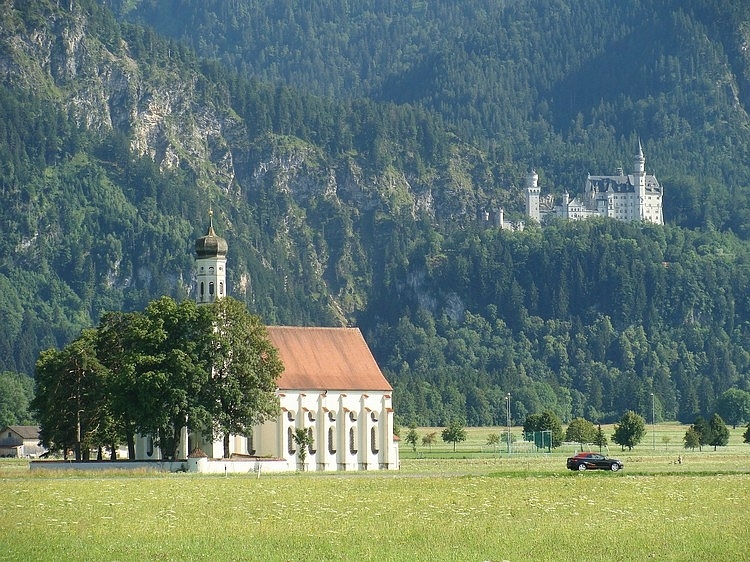 I am cycling along the foot of the mountains and the dazzling Schloß Neuschwanstein, famous of its presence in numerous jigsaw puzzles, towers on a rocky point above the valley. 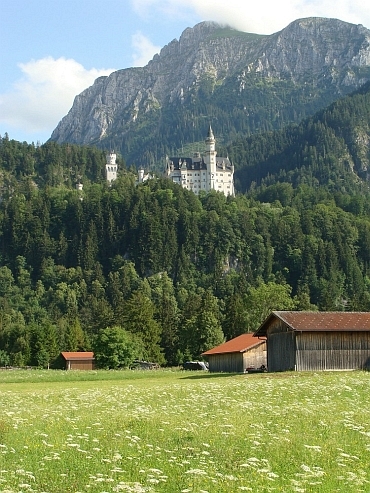 I leave my bike and now I am climbing to the snow-white fairy tale castle. The castle rises slender and straight towards the skies and out of the immense bastion numerous towers emerge, all seeking their own way up into the air. High Romanticism meets pure megalomania but the result is certainly impressive. 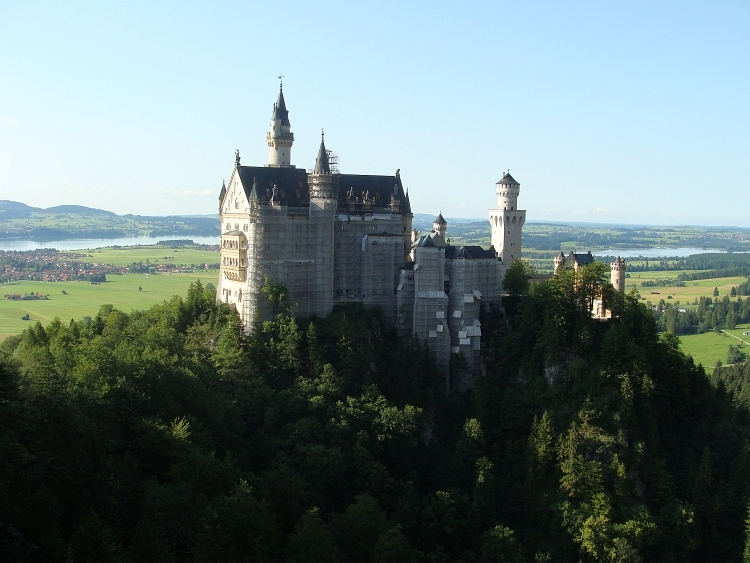 After my visit to the castle I continue my route to Füssen and late in the evening I reach the Austrian border. The weather is so beautiful that I want to take advantage of the circumstances as long as possible to enjoy the beautiful surroundings. Eventually I find a campsite in Reutte. I am cycling through the lovely valley of the deeply azure River Lech. 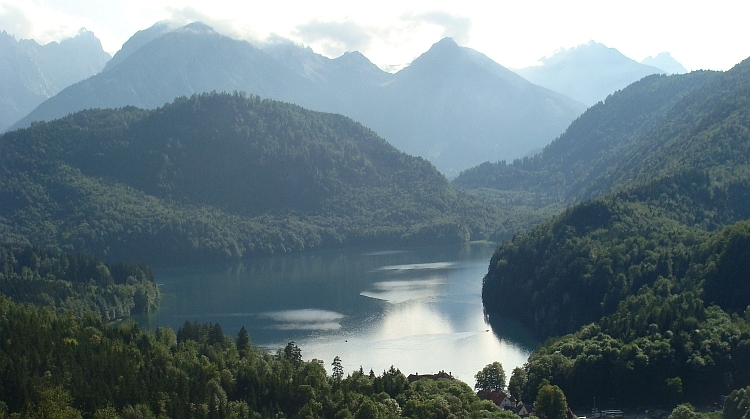 The mountains of the Allgaüer and Lechtaler Alps on both sides of the river with their gray rock walls and dark green pine forests are a dramatic counterpart to the lovely river valley. The area is sparsely populated and whole passages I am cycling through vast valley forests. 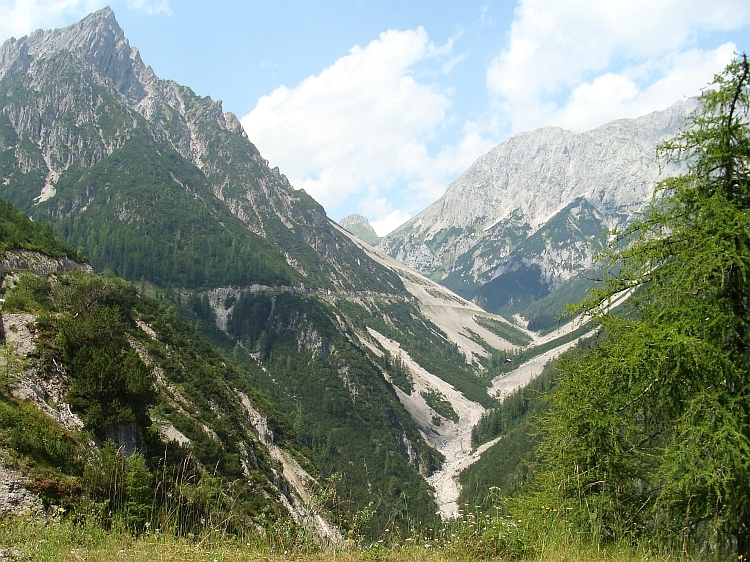 It is an unusual experience in Europe to be in a broad valley that is still a natural area. 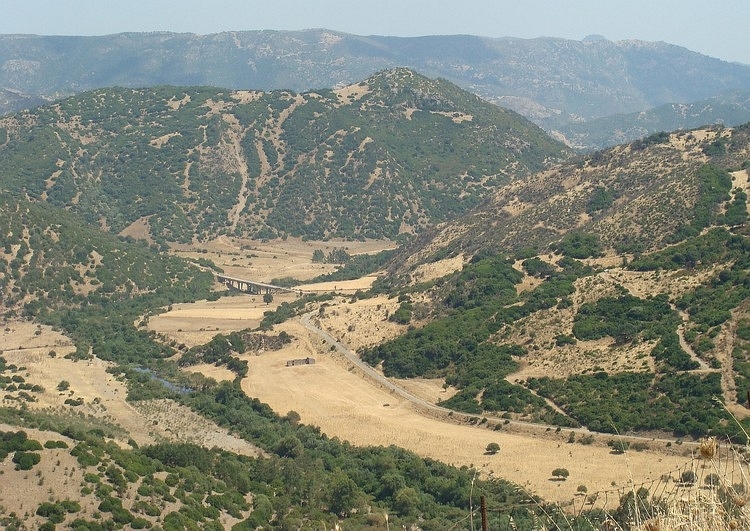 Usually valleys are used for agriculture or habitation. In the village Stanzach I take a rest and I start talking to a 90 year old woman. Her eyes are still full of life and she wants to know exactly what I intend to do. As we say goodbye, I have to promise that I will be careful. Not long after this little interlude the ascent to the Hahntenjoch begins and the climb immediately proves to ruthless. The road lies parallel to the valley and soon I have climbed high above the valley floor. The first real climb of the trip is really something. After one kilometre the road turns and goes up in a side valley of the Lech valley. 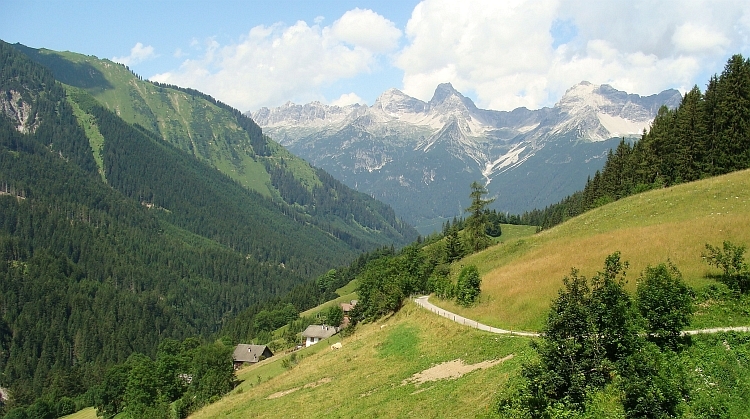 The road is less steep now and leads through alpine villages and green meadows. The last five kilometres to the pass are on average ten per cent steep. I am having a difficult time. The Hahntenjoch appears to be a very ambitious start in the Alps. But I reach the pass. At the top I am enjoying the views. The landscape on the southwest side of the pass is even rougher than the east side. Large walls of gray limestone dominate the scene. The road goes down right under these huge limestone walls over big slopes of scree. I am going down between the large rocks and in a short time I descend into the Inn valley in Imst. I find out that it is very hot in the Inn valley now and I limit myself to an afternoon ride along the river Inn to Landeck. The first Alpine crossing has been done. Today I will cycle with Dietmar. At least the first kilometres through the valley of the Inn towards Italy. Two days ago, I met Dietmar at the campsite of Reutte. 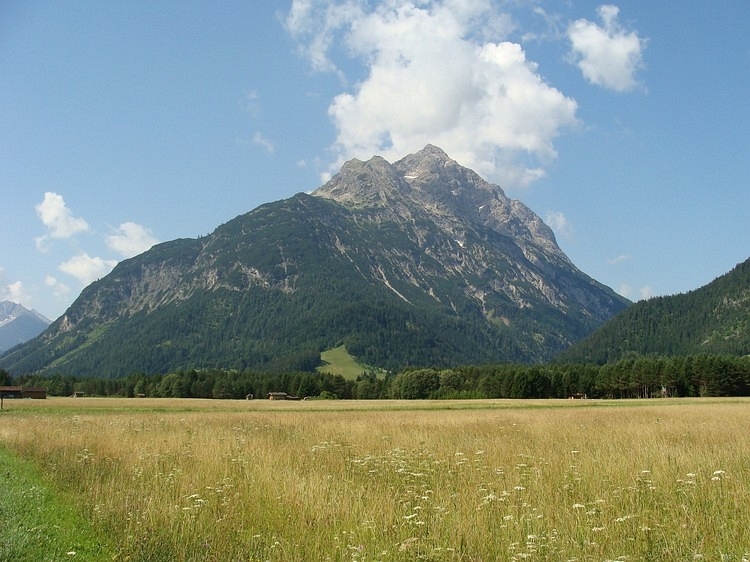 Since then he cycled across the Fern Pass to Landeck and I took the Hahntenjoch route. Dietmar has got an injury on his knee today and he will not be cycling any further than Pfunders, just before the climb to the Reschen Pass. 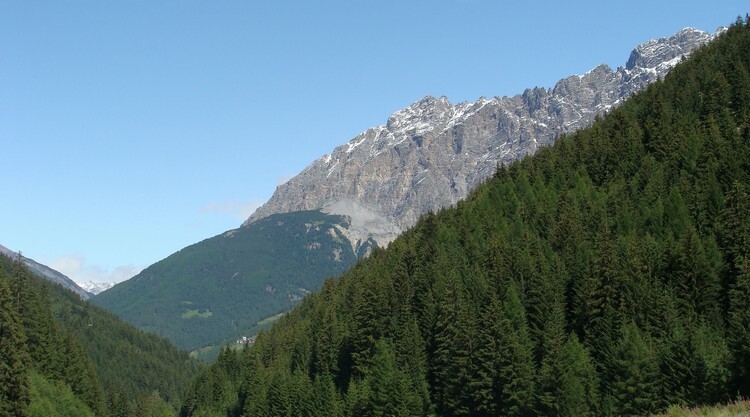 I will continue to cross the Reschen Pass, the border with Italy. After breakfast it starts to rain; the mountains are hanging in the clouds completely. The view is restricted to the valley of the Inn. It is not cold though, the circumstances are by no means burdensome. Nevertheless, we take more coffee stops than I would have done otherwise. After one stop Elmar takes us over, the German man with whom I cycled to the Wieskirche. With three men we will proceed in the direction of Pfunders. Elmar and Dietmar both follow the Claudia Augusta Road, Elmar through Verona to Rome, Dietmar to Verona. Both men have beautifully designed books with him. Getting lost is something of the past. If we approach Pfunders, the rain stops unexpectedly and the sun breaks through the cloud cover. In Pfunders Elmar and I say goodbye to Dietmar. It is around noon now and Dietmar has got the whole afternoon and evening time to reflect on the things of life. There is not much else to do; the village is very nice but also very quiet. We exchange addresses and Dietmar promises to let us as know whenever there are major philosophical or spiritual insights to be reported. 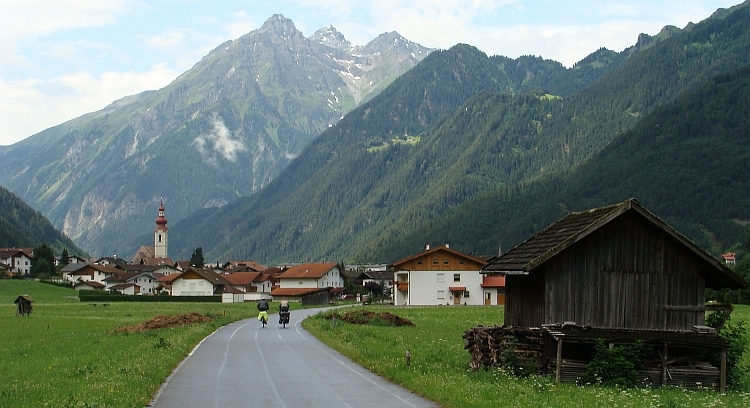 After pfunders we cycle along the Inn through the border area between Austria and Switzerland. At the Swiss border the climb to Nauders and the Reschen Pass begins. The climb is not steep and also the altitude difference is not impressive. After a few kilomters of climbing we reach a small pass and downhill we go to Nauders, it is not so far anymore to the Reschen Pass. 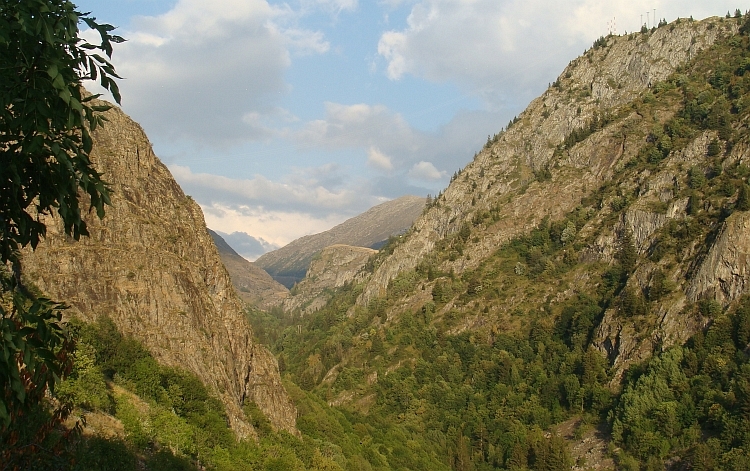 The combination of the Fern Pass and Reschenpass is probably the easiest way to cross the Alps. In Nauders Elmar and I have one more coffee break. As we wait for the order, we see two cyclists. One of the cyclists looks incredibly much like the famous Dutch world cyclist Frank van Rijn, I seriously suspect him to actually be Frank van Rijn. I decide to simply ask and it shows that we are indeed dealing with the now 61-year-old man who has dedicated almost a whole human life to cycling across all the continents and to writing some great books about his adventures. Within a short time the stories come loose and we forget about time. The partner of Frank is called Hans; he is a veteran of 66 Swiss years old. His dry, earthy humor is a great asset to our company. With the four of us we are heading for the Reschen Pass. From Nauders we hardly need to climb. But there are still some kilometres up with a significant headwind. We reach the pass and hence the border with Italy. We see that black clouds are rolling in from Italy. We will not be able to avoid the bad weather. Directly beyond the pass is the Reschen See. A dam was built under Mussolini and since then the whole reservoir is under water. Without taking into account the Sudtiroler population, whole villages were put under water, including the village of Graun. 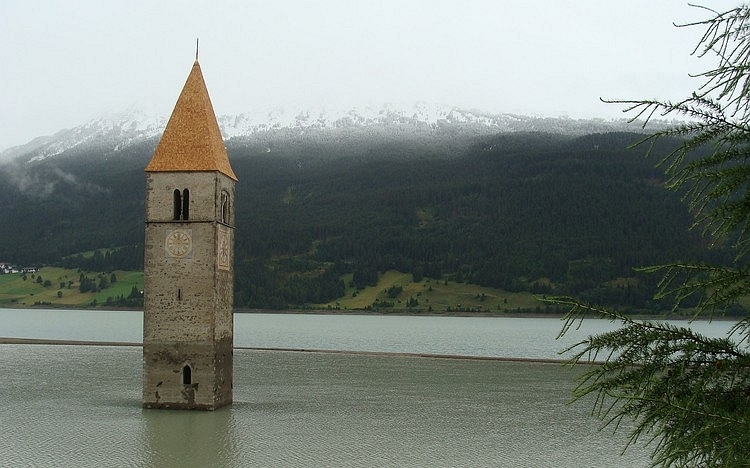 The villagers of Graun have moved the church to the edge of the lake, so that the church is half under water since the commissioning of the dam; only the spire soars above the water. Precisely at this special place the storm breaks loose. Thunder and lightning, fiery winds and torrential rain. We hurry to the village where we take a small hotel. After a nice shower, we go out for dinner. Frank van Rijn proves to play chess (ex-champion from a smalltown of 40.000 residents). The discussion concentrates on the national German search for the greatest man of all time. That proves to be Adenauer, Beckenbauer and Mozart (who actually was an Austrian man). Subsequently, the discussion moves to the greatest Dutch man; William of Orange and Pim Fortuijn were chosen. I argue that Frank perhaps also deserves his place in this illustrious list of names. Frank suggests that not he but his family member Rembrandt deserves that high position. And that Mozart deserves the first place in Austria (and not in Germany). I respond that a the best music ever was recently chosen in Austria; although not a movement of Mozart was chosen, he was nevertheless in the spotlights as "Rock Me Amadeus" by Falco was voted by the Austrians as the best song ever. Unfortunately Frank has missed this quintessential work that had put Austria back to the internation hit parades in the middle eighties. I try to imitate the stuttering ADHD performance of Falco, including the mimics and gestures. Frank nods his head with a bewildered face. It is still raining when we wake up, but not in the huge quantities of yesterday evening. But rain is rain and it makes you wet whatsoever. And if there is something that Frank does not like - besides spicy food - is rain and cold weather. As it is both wet and cold now, Frank and Hans decide to remain in the hotel. Elmar and I decide to continue. I will go in an opposite direction than the other men whatsoever. They will head for Bolzano as I want to cross the Stelvio. The weather has been quite extreme tonight. The snow line is extremely low, at only 1700 meters altitude, only slightly higher than where we find ourselves now. We descend to Prato, at the foot of the Stelvio or Stilfserjoch, 2757 meters high and one of the highest cols in the Alps. 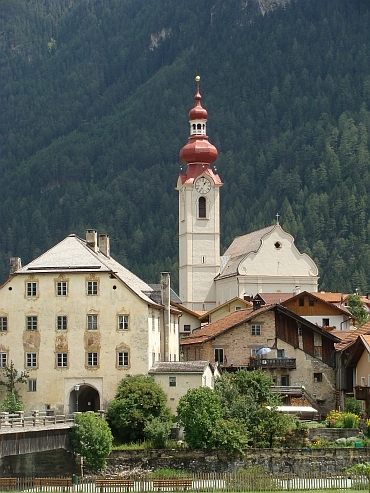 The descent leads through many beautiful villages of Sudtirol like Burgeis, Mals in Vinschgau and Glurns. The atmosphere is in fact more Austrian than Austria itself. Elmar and I say goodbye in Prato. 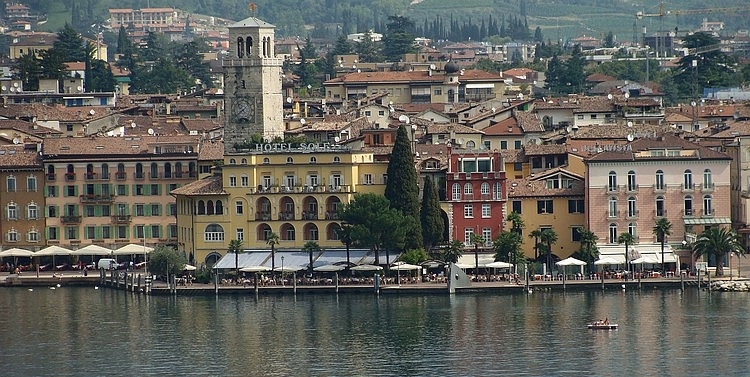 Elmar will continue to follow the Adige down to Verona, I will cycle up the Stelvio. 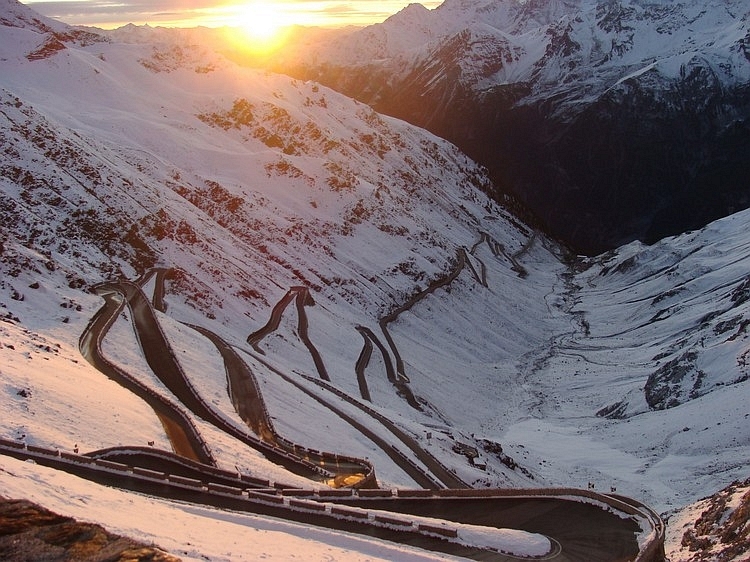 The Stelvio is one of the largest and longest climbs of Italy and Europe. From the foot of the climb in Prato at 949 meter altitude to the col at 2757 meters elevation, nearly 2000 meter altitude difference has to be overcome. It is 2 o'clock in the afternoon now and it is still drizzling. I do not feel like spending the rest of the day at the campsite of Prato so I decide to cycle up to one third of the climb to Pradoi, where another campsite can be found. But as I reacht the place, I find it half deserted and the cold, rainy conditions will not make a long stay a pleasant experience. The road has been closed all day because of the snow but the road has just been opened. There is no traffic however. I decide to continue. I am all alone in the landscape, now that I have passed the last village before the pass. From Pradoi I cycle a little bit further up to one of the mountain refuges. Soon I am in the middle of a snow-covered landscape but the road itself is snow free. The first mountain refuge appears to be only a restaurant, so I have to continue. I climb above the tree line and a little bit later I reach the Franzenshöhe, at the foot of the dramatic final climb. I take a short rest here with a hot chocolate before I return to the snow and wind conditions of the final ascent. The Franzenshöhe lies at the foot of a huge white arena. The road winds itself up over the snow-covered scree slope that lies between impressive snow-covered rock walls. 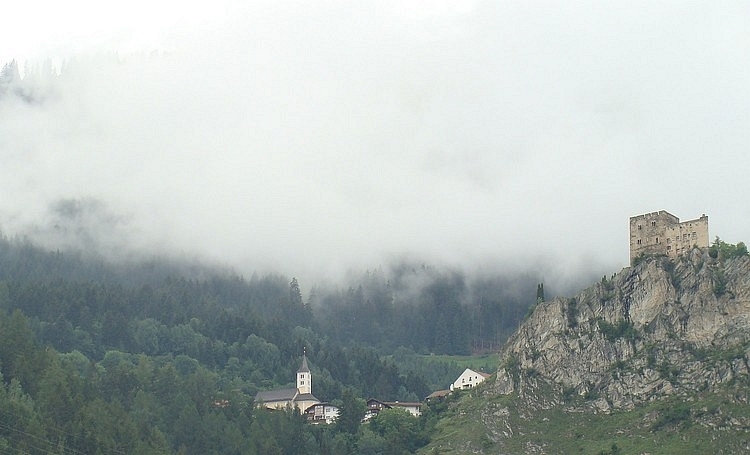 Part of the mountains are hidden in the clouds and is just about visible but the higher mountains of the Ortler range are completely dissolved in the clouds. 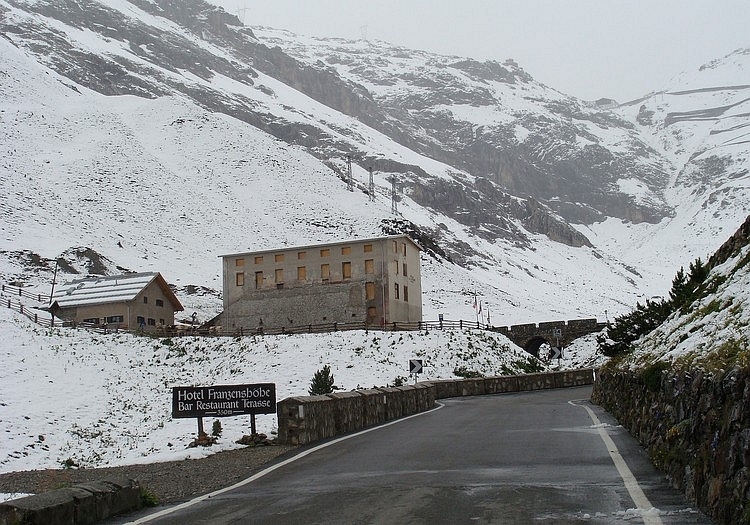 The Stelvio is one of the few alpine cols in high-Alpine sceneries. 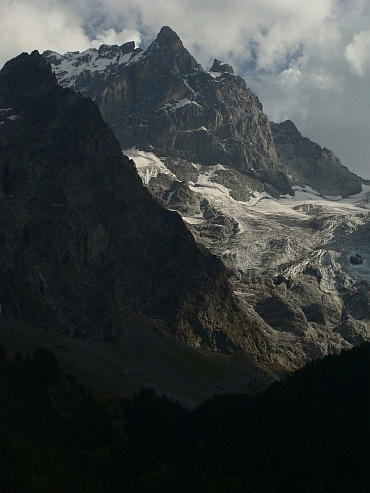 The Ortler, which is not visible now, rises to 3908 meters altitude. The road winds steeply up over the snow-covered scree. The wind is raging as I get higher and the snow intensity increases. Slowly it is getting cold. But sooner than expected Ireach the top of the Stelvio, 48 hairpins above Prato, four hours after I started off. As I look down, I see the long and winding road in the further pristine white landscape. I take a hotel at the pass in the hope that tomorrow the sun will shine as I descend to Bömio. 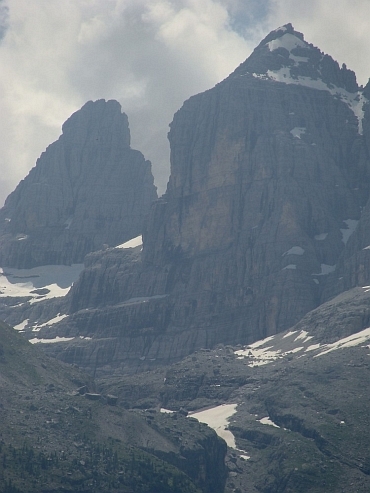 There a new giant will await me: the 2.621 meter high Passo di Gávia. It is unpleasantly cold but the storm is finally over. A radiant blue sky stretches above me and a pristine white world below me. In between the sun climbs over the mountains and plunges the snow carpet in a warm orange glow. I can see the hairpins below that I have cycled up last evening. I do not enjoy the view for long. It is icy cold up here and there is a breeze that seem like cutting razor edges to my skin. I return to my hotel and decide to rest there for an hour and after that I will wake up again and have my breakfast. At half past 8 I am having breakfast. Then I take my bike and try again how the conditions are. It is still freezing but it is at least ten degrees warmer, within about half an hour it will thaw. I begin the descent to Bórmio. I descend carefully, sometimes I need to manouvre around an ice passage and a single brief passage is completely unpassable on my bike. I have to walk over the ice before I am able to continue. Pulling the brakes on such icy passages could prove a hazardous job. It does not take a long time before I arrive in the thaw zone. I can relax now and enjoy the white mountains around me. The scenery is not as high-Alpine as the other side of the pass but it is no less impressive here. The views are breathtaking. The last kilometres of the descent the snow is no longer around me and I am cycling through pine forests now. All around me razor sharp rocky pinnacles tower above myhead. The Stelvio is certainly one of the greatest cols of Europe. 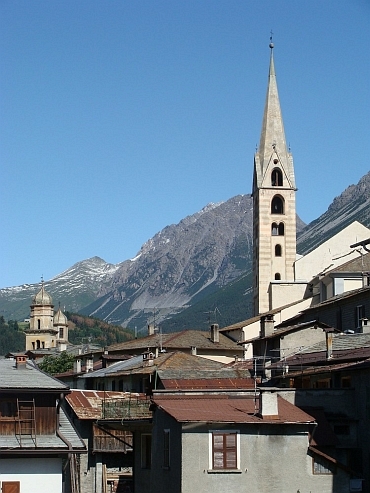 I reach Bórmio, a village at 1200 meters altitude, in the middle between the Stelvio and the equally promising Gávia. It is the first real Italian city I reach - the villages and towns of South Tirol are by atmosphere much more than Austria Italy. It has been nice and warmed up the Italian ladies are dressed in a summery Italian day. It is incredible to think that it was only an hour ago that I struggled through the snow. This is a part of the charm of traveling by bicycle: the changes are fast and The experience can be intense for all the senses. The first espresso in Italy is really good. I can mentally prepare myself now for the climb of the Gávia. Over 1400 altimeters are separating me from the top of the Gávia. That is indeed a long climb but not as long as the Stelvio yesterday. I walk a bit with the bike on the basis through the town and begin the climb. The start of the climb is ver impressive. To the west impressive rock walls are looming. In particular, the rock wall of the snow 3859 meters high Königsspitze impresses. So far the climb is not steep. But from Santa Caterina on, half the distance to the pass, everything changes. 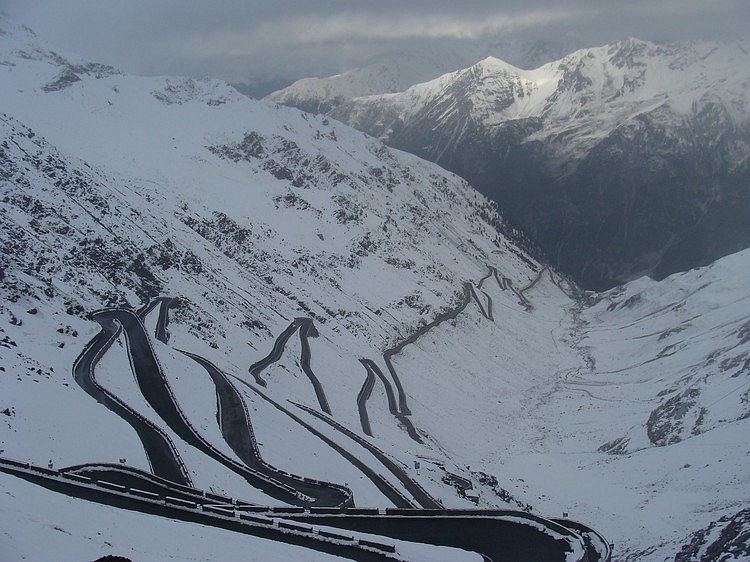 The climb is very irregular and the road quality is significantly less than the road quality of the Stelvio. The holes in the asphalt and the many blobs of asphalt on the road, combined withe the steepness of the climb, make the Gávia one of the toughest climbs in Europe. On the one hand it could be annoying that I am struggling to the top now but on the other hand a climb like the Gávia is supposed to be very difficult, I like to believe in the mysticism of the climb. Well, that is how it turns out to be. Even better, a bit further I return to the snowy conditions. In the hours that the sun is up, the snow line had moved upward considerably, but I am just in time to enjoy the snows once again. These are the best circumstances that I could possibly experience. And this at one of the truly magnificent mountain passes of the Alps. In the end I reach the pass, where I take rest for an hour. When I start the descent, almost all the snow has melted away. The descent is steep for my fully loaded bicycle, and I descend quietly on the narrow road. The descent is more exciting than the much wider Stelvio. Sometimes the views are airy. Completely out of nowhere a tunnel looms suddenly. I can not pull the brakes on time because a car is riding just a few meters behind me - which is apparently the local use in Italy. I am rushing with full speed into the tunnel. It appears to be completely devoid of light and there is also a curve so that it is pitch dark here and I see nothing at all. I have to make an emergency brake and fortunately I do not crash against the tunnel wall. Slowly my eyes become accustomed but there are other dangers: there are cars in the tunnel. I have not prepared for a tunnel and my lights and reflective jacket are in my panniers. I cannot do anything but to continue. Fortunately the tunnel is short and I get out of the dark threat safely. The rest of the descent is nice and I reach Ponte di Legno. 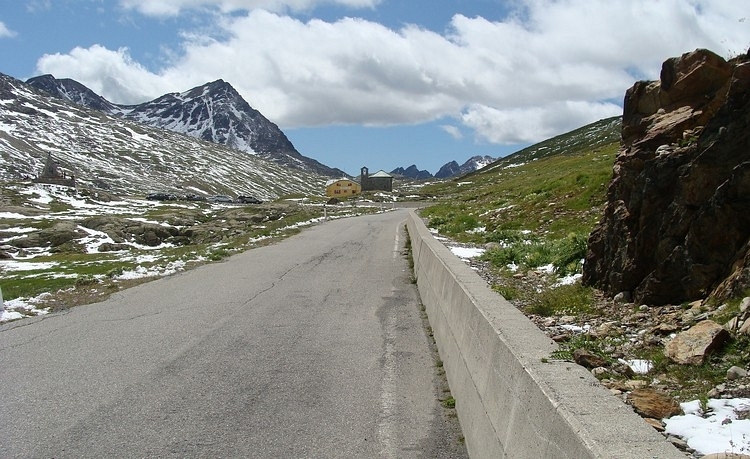 I want to cross yet another pass today: the 1884 meter high Passo di Tonale. This climb is not a culmination of beauty and splendour after the greatness of the Stelvio and Gávia. The road is wide and very busy. It is Sunday afternoon now and there are many people who have thought that it might be a nice idea to drive across the Tonale today. It is remarkably hot down here, maybe thirty degrees. What a contrasts today! The climb passes the messy Tonale ski areas. 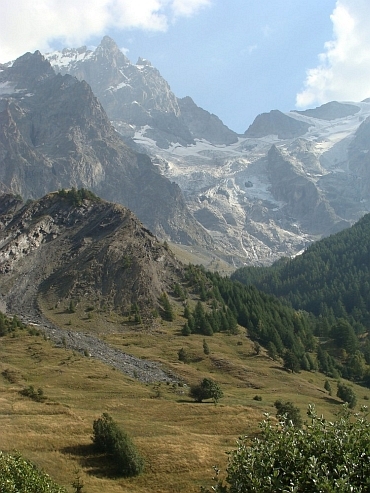 The area could do well in a contest of the least beautiful parts of the Alps. The descent is not much fun either but there are some attractive villages and occasionally there are beautiful vistas to high alpine peaks. Eventually I find a nice, typically Italian camping in Osanna. Today I want to reach Lago di Ledro, a lake that is close to Lake Garda where friends of mine are residing now. 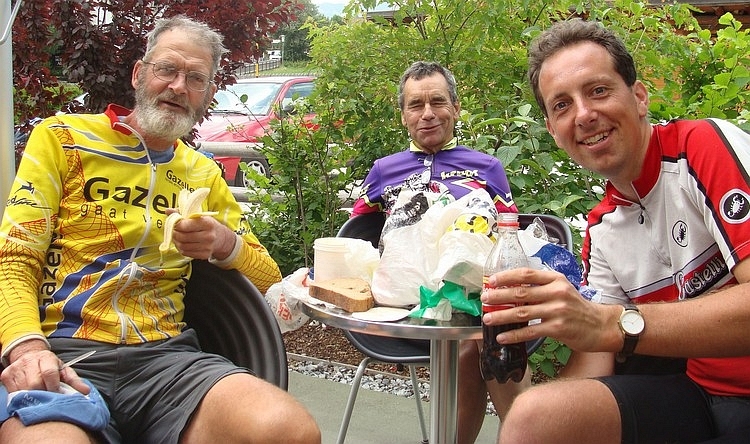 That is for sure one hundred kilometres cycling through the mountains but it seems to be an achievable goal. The day begins with a descent to Dimaro. 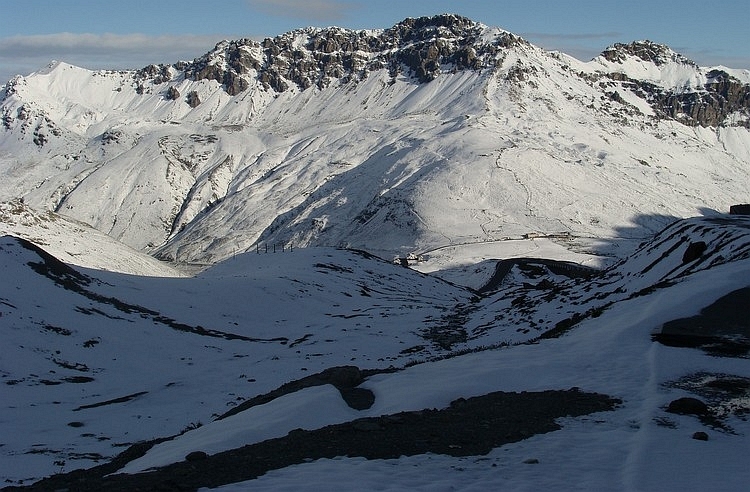 On the way there are beautiful views of the 3769 meters high Cevedale, a small three thousand meters above the valley. 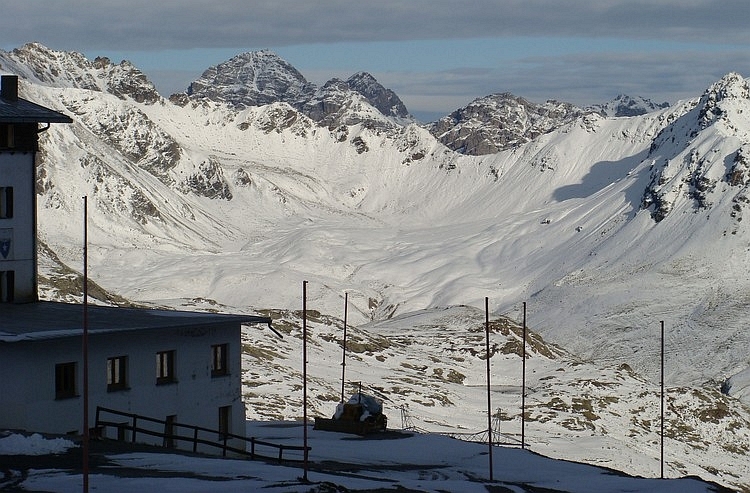 From Dimaro I am cycling southward and I climb to the 1682 meter high Passo Campo Carlo Magno. The climb is not very spectacular or aesthetic as it ends up once again in ski areas. However, there are spectacular views of the Brenta Massif. The descent to Pinzolo offers more beautiful views. Then the alpine beauty is over. The mountains are much lower now. It is getting hotter and more humid and the wind swells up to uncomfortable proportions. My inspiration descends to a medium inspired level. There is another unpleasant surprise as the expexted long descent is interrupted by a climb to a pass that I have not seen on the map. The adrenaline level is below zero as I arrive in Storo after a few hours. I only have to climb to the Passo di Amporo now. Unexpectedly the landscape is suddenly very beautiful again. The road winds up between jagged rocks. The landscape is overwhelmingly green, even on the steep cliffs the trees prove to survive reasonably well. I reach the pass and I descend to the lovely lake. It takes more than one and a half hour to find the apartment of my friends and I am very relieved as I finally meet my friends. 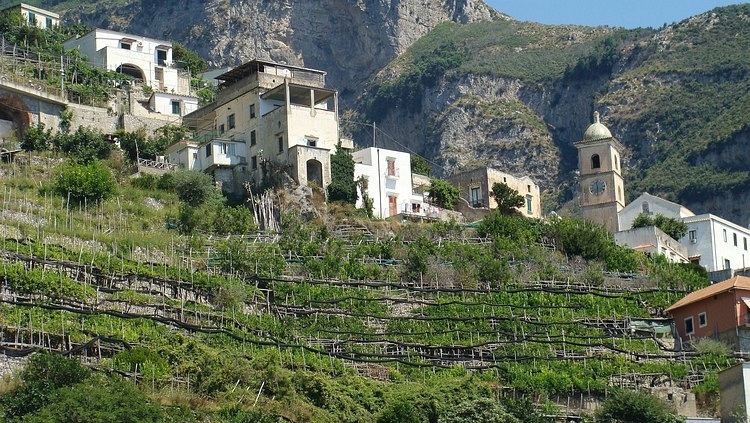 There are two route options from Pieve di Ledro to descend to Lake Garda. There is a paved road and there is a mountain bike route. I decide to take the mountain bike route. After a short time the trail reaches a spectacular section which is two to three hundred meters vertically above the lake. 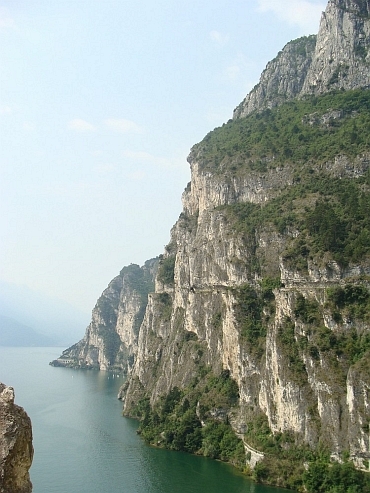 The remainder of the route to Lake Garda follows the vertical rock walls. Sometimes there is a tunnel passage but fairly all the way down to Lake Garda the route lies straight above the lake. Eventually the trail ends down in Riva del Garda, at the northernmost point of Lake Garda. 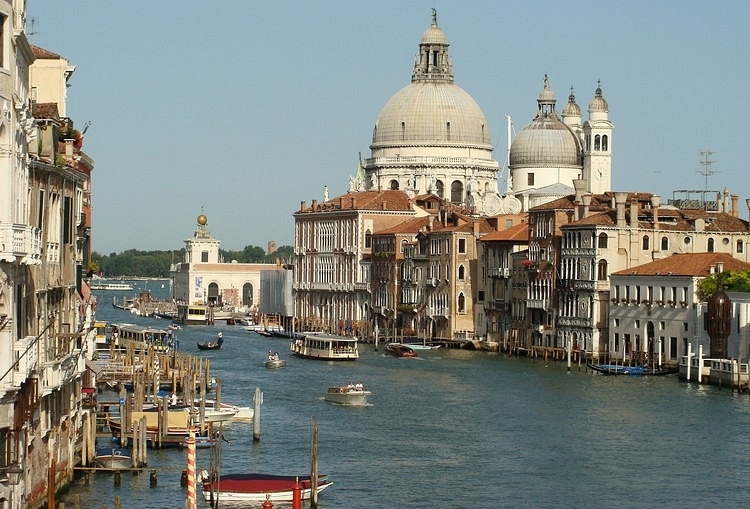 I would like to cycle in two days to Venice. Therefore I am heading eastwards now. First I cycle to Rovereto. From there I want to cross the mountains of Trentino to reach Bassano di Grappa, in the area where the Po Valley gradually merge into the Alps. But first Ihave to pass the obscure mountains of Trentino. 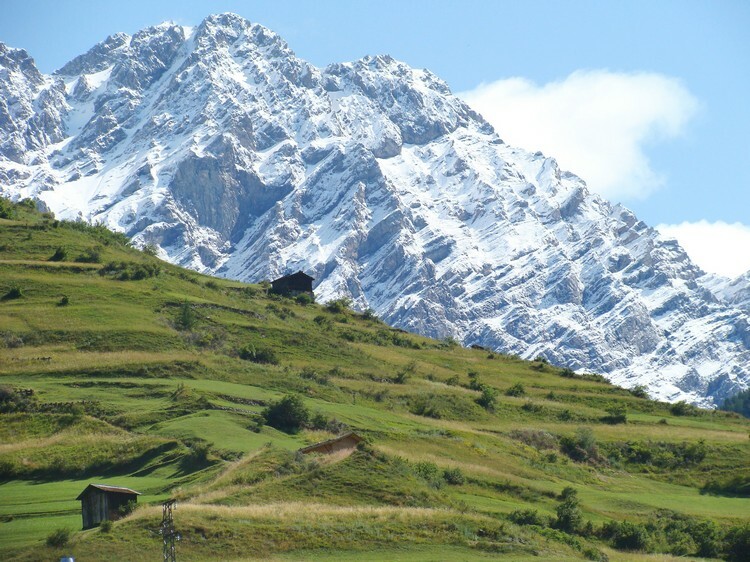 The Alps are no longer very high in these surroundings, the highest mountains are just above 2200 meter high. 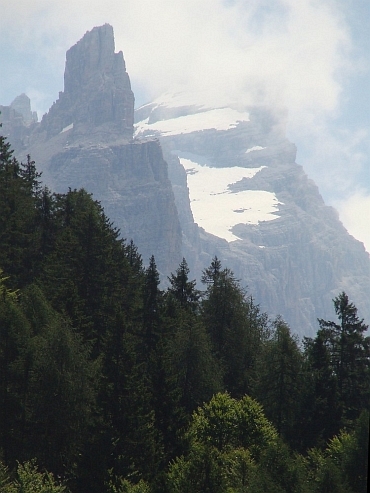 The only pass that I have to cross is the Pian delle Fugazze, which is 1156 meters high. At first glance that is not too impressive but the climb begins at a very low elevation and it eventually ends after a long ascent with a net one thousand altimeters to overcome. Because the ascent is not a continuous one bu a broken one with many small climbs and descents, the gross number of altimeters must be a lot more. It is hot and humid weather, which make the circumstances difficult. 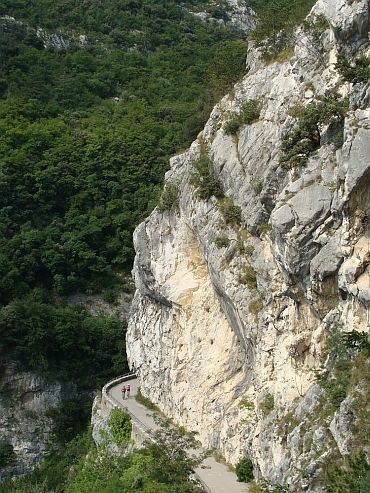 All in all, this is a climb to rival the famous 'high' climbs in the Alps. The villages that I pass, are atmospheric but they are almost devoid of people. The desolation is characteristic, this is really adventurous cycling through a 'white spot' on the map. The landscape is very green and at places very, very steep. 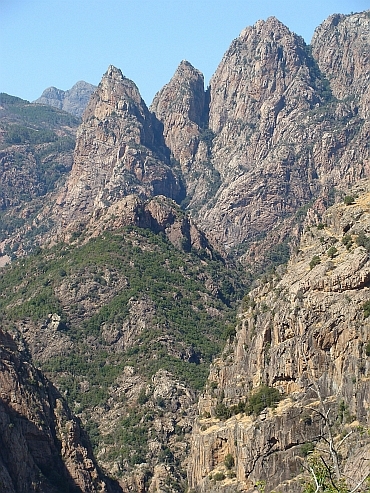 In the area around the pass, there are giant pinnacles. Most impressive however is the section on the other side of the pass - on the eastern side. 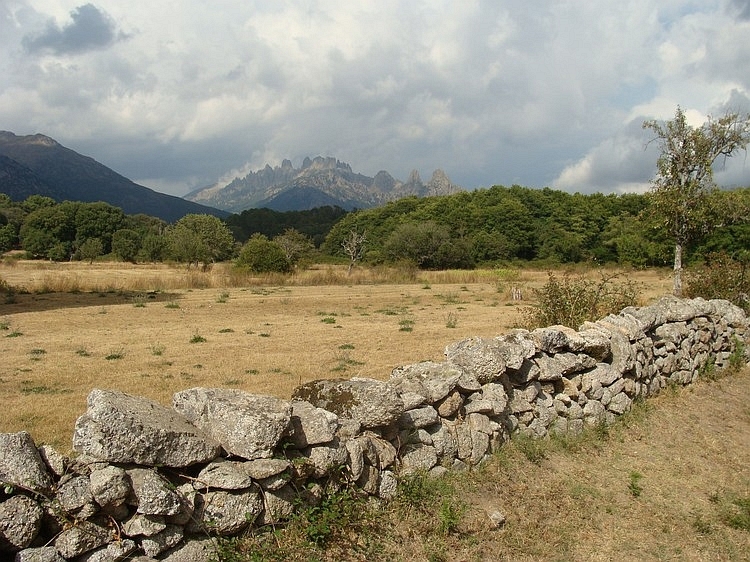 The Pasúbio is an erratic mountain range with spectacular rock peaks, a bit like the Dolomites. But where the Dolomites stand solely as giant blocks in the landscape, the cliffs of the Pasúbio mountain peaks dynamically merge into a steep, wooded slope that falls down all the way until the valley level, many hundreds of feet below. 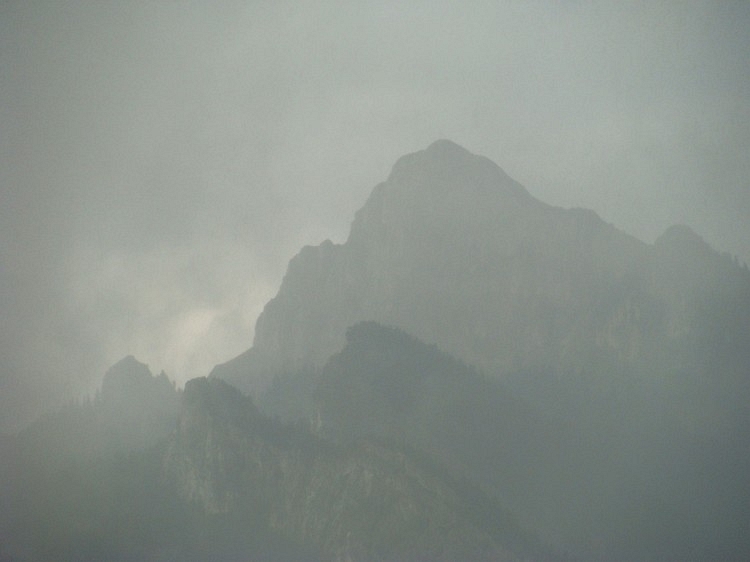 The peaks are veiled by monsoonlike clouds. All in all, I have got the impression of a tropical mountain range, a mountain range which seems to be much higher than the actual height. 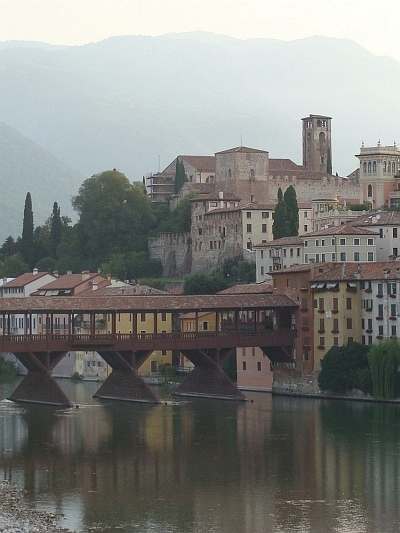 The crossing of the Trentino mountains end in Schio. I am finally in the Po Valley now. The magic is there right off, since there are no quiet roads eastward, parallel to the Alps. One problem is that I am suffering from a nasty nausea. I am afraid that the water taps in the villages were not proper. The last kilometres I am really suffering. I feel that I have to give up very soon. I stumble into the first hotel in Bassano di Grappa that I can find. 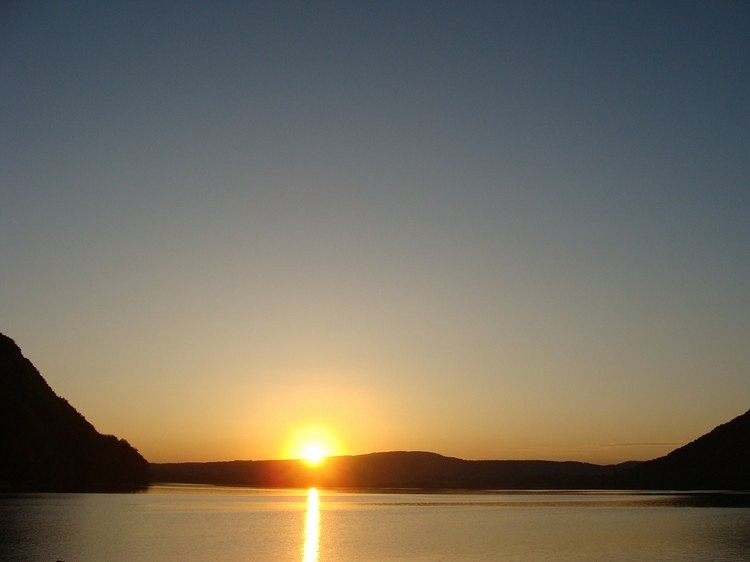 There is a sublime sunset in the beautiful town that lies under an otherworldly glow. But I do not have an eye for it. I grab the hotel key from the hands of the perplexed looking receptionist and take a sprint to my room where I reach the toilet just in time. As everything is out, an acute fever pops up. Things do not seem to get better. I crawl under the covers and I fall asleep, shivering and awfully cold. Drenched in sweat I wake up. And... unexpectedly I am not feeling too bad. Although I do not want to eat yet, I feel like cycling a bit. It is not too far to Venice and the area between Bassano di Grappa and Venice is completely flat. I decide to start, and I will see how it goes. And so I am on my bicycle again today. I am riding through the villages and towns of the Veneto provice. I wonder if the route to Venice would have charmed me, if I were fit. But now that I am not, I do not dislike the flat landscape. 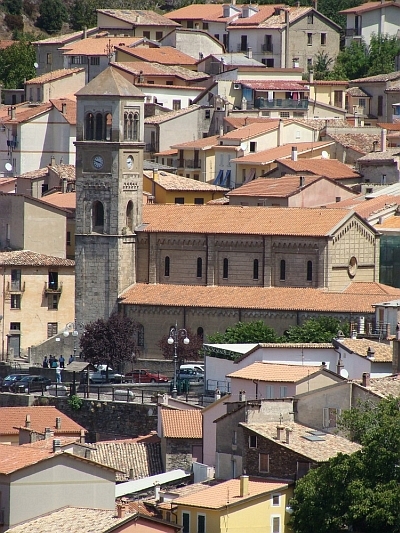 The towns have very characteristic, thin, mostly pink, church towers. The roads through the area are relatively quiet and there are many places, where I can have a little rest and where I am able to break the rhythm. All in all, the distance is covered relatively fast and at 12 o'clock I stand before the Adriatic Sea at Fussina. 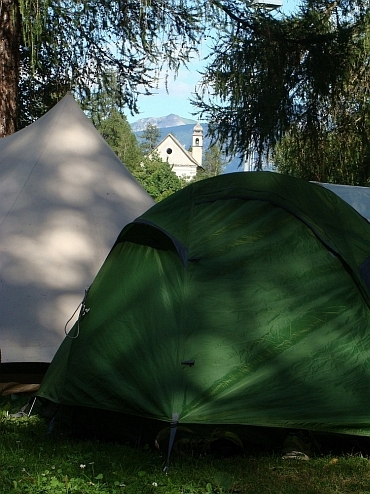 Here is a huge camping, which is aimed at visitors of Venice. I put my tent and take a shower. I am in time at the port to reacht the two o'clock ferry to Venice. The rest of the day I wander through the alleyways and along the canals of the city that is named the "Giethoorn of the South" by Frank van Rijn, after a Dutch smalltown with canals. Everybody seems to know Venice and I was warned indiscrimately. "You'll have to swim through the canals because it is too busy on the streets." "Even busier than Old Delhi." When I wander through the city, it proves to be completely deserted. Where are the tourists? Nobody knows. 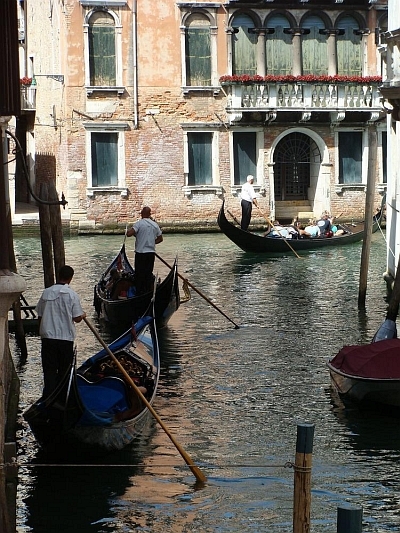 The boatmen of the gondolas stand confused and the tables of the cafes and restaurants are set for nothing. For nothing? Not that it is free. Out of pity for all those unemployed cafe bosses, I have a little stay in one of the cafes and afterwards a total of 3 Euros is included in the bill only to set the table. 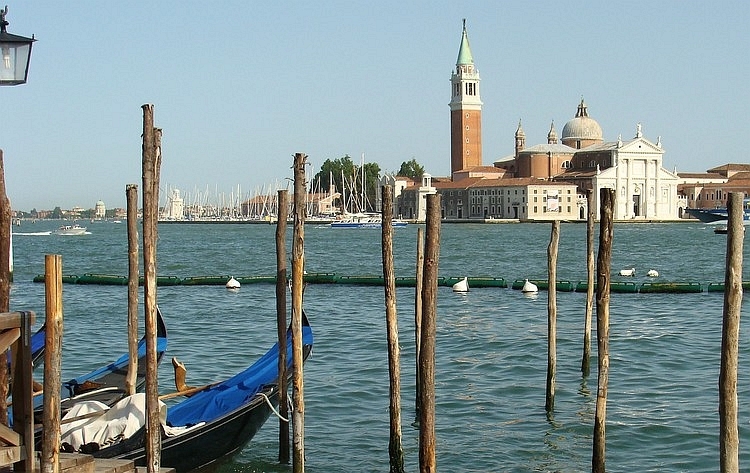 I hear a story of two Japanese tourists who had a total bill of six thousand Euros, following a dinner in Venice. For that money you are able to set the table two thousand times! One day you cycle through the snows, another day you cycle through the stifling, sticky heat of the Po Valley. I am riding right to the south now and I set course for Tuscany. The Po Valley is like a casserole between the Alps and the Apennines (which are the edges of the pan) and it is awfully hot in there. A sticky, moist wind faces me and does not leave me the whole day. I find out that the casserole can also serve as a sizzler. Steamed, fried and wrung I reach Ferrara after a long day without any highlights. Ferrara is the first place with a campsite and I am glad that I am there after nearly 150 kilometre. Fortunately, there are fellow cyclists at the camping, even a cycling tour group, so that it is a very nice, social affair at the campsite. I wakeup, pack my stuff and cycle to the old town of Ferrara. I have a pleasant impression of the city. 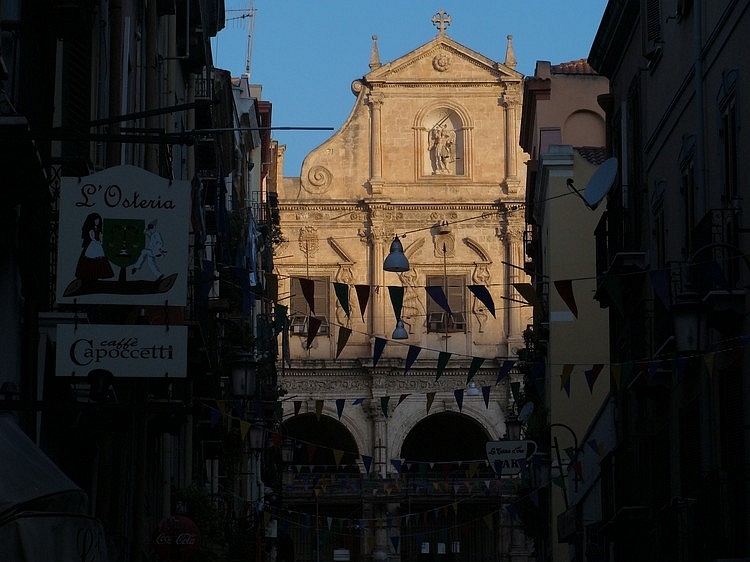 The cathedral is full of atmosphere and the quiet streets downtown are enjoyable. 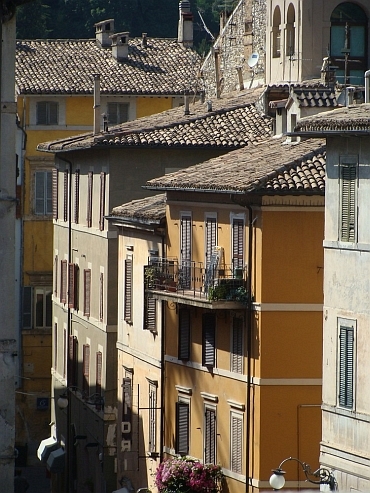 What a recurring problem seems to be, is finding the right route out of Italian cities. 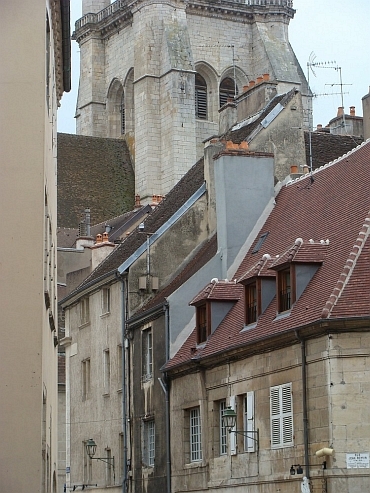 The old cities are usually mazes of one-way streets and really nothing is ever indicated. Once again I fail, this time I miss the right turn on the ring around the city, so it is only after riding half the ringway as I recognize the supermarket near the camping. Now that it is cloudy, I cannot orientate towards the sun. After cycling a few kilometres back, I see where I should have left the ring. The wind has turned, and today there is a tailwind instead of a headwind. Moreover, it has pretty cooled down. Not to mention that it is cold, but you cannot expect that in August in Italy. The sun is still there and the scenery is not bad. I still find myself in the Po Valley but I am quickly approaching the Apennines now. I push on through the villages and the lands; I can see the Apennines now. I am missing Bologna by just ten kilometres. I am passing through the suburbal town of San Lazzaro. This is not exactly the most beautiful town in Italy, but here is the beginning of the climb on the Apennines. I am following the narrow road to Zena. The hills around me are getting higher and higher. The landscape around me looks like the Tuscan countryside with rolling hills, lanes, cypresses, yellow fields of grain and once in a while a lonely house on a lonely hilltop. The difference with Central Tuscany is that the hills are much higher here. A steep climb brings me to the main road to the Passo della Raticosa. It turns out that the road is busy with motor bikers. It is Sunday and it seems to be normal that the Italian motorcyclists en masse follow this route. It is getting late. The sun is already low and shines a warm light on the mountains and valleys. The panoramas are beautiful in the connection between the Passo della Raticosa and the Passo della Futa. For this second pass I hardly need to climb. And I hardly need to descend. 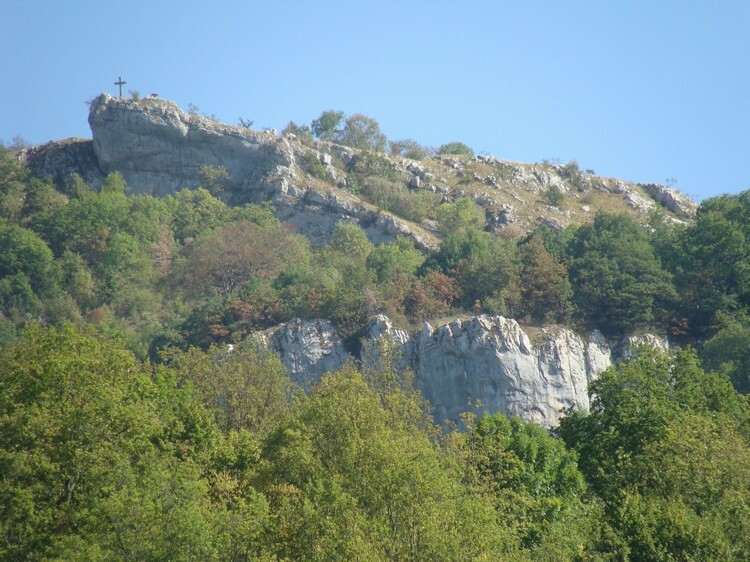 I find a campsite within a few minutes after the pass, the so-called Monte di Fo. This shows a nice, typically Italian family camping. No Dutch or any other foreigners abide here, only a Dutch couple. The man has previously cycled here on a tour to Rome. I am having breakfast at the campsite. Under an early morning sun I am riding down. 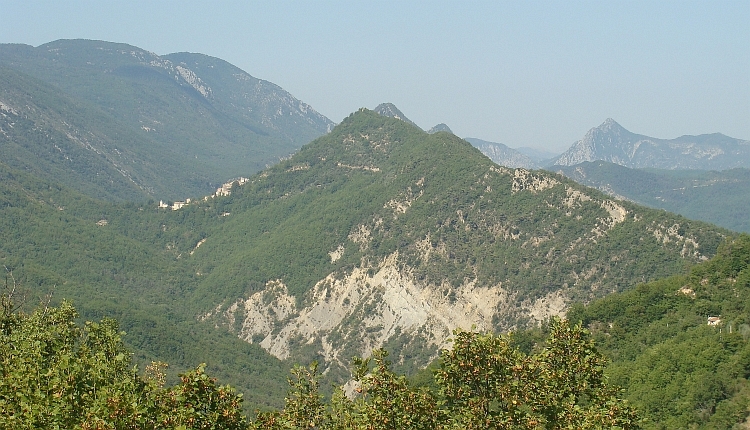 The descent follows many small hilltops. Every one hundred meters the view changes completely. Downstairs is a large lake, there are some new mountains looming up behind. So after the long descent, new climbs await me. After forty minutes I have crossed the ridge and I am descending again. This descent is just as beautiful as the previous. 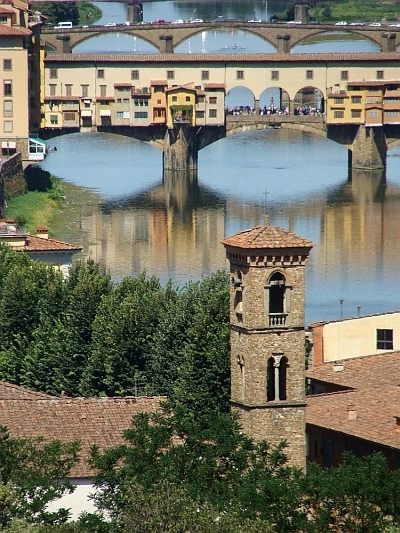 Far below me lies the city of Firenze, behind Firenze are the hills of Chianti, one of the most famous areas of Tuscany. After ten minutes I have descended all the way down and abruptly I am standing face to face with the Duomo. 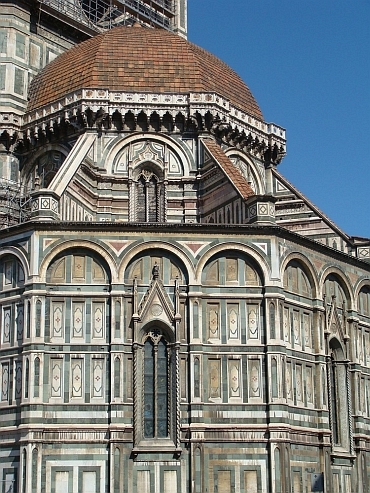 I have already been in Firenze in my 2003 bicycle journey and therefore I do not spend a lot of time period to visit all the famous churches. 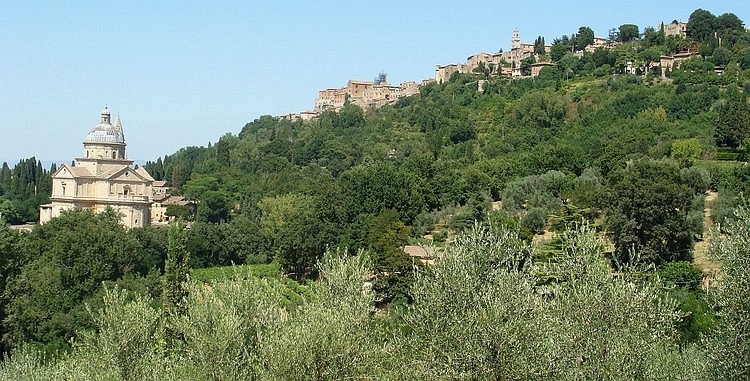 I am cycling on to the Arno River and on the other side of the river I am cycling up into the hills of Chianti. On the way I pass a beautiful view point. I am cycling in the hills of Chianti. It is quite hot; the temperature will be around thirty-five degrees or more. Because the air is very dry, the heat is just bearable for a heat-loving man like me. But I sweat like an otter on the many small climbs though. The roads are sometimes viciously steep, all in all the going through this area is easy to underestimate. 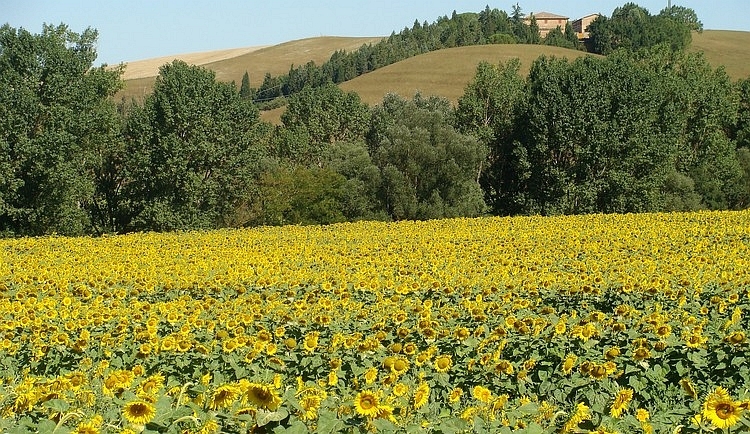 The landscape is exactly what could be expected of Tuscan landscapes: rolling hills, villages, church towers or houses on the hilltops and fields on the flanks of the hills. 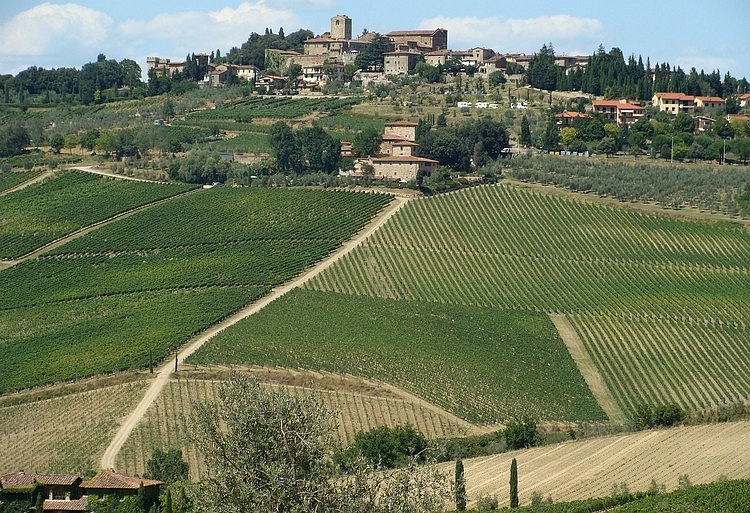 Unlike other areas in the Tuscany countryside the vistas are often dominated by a lot of vineyards. 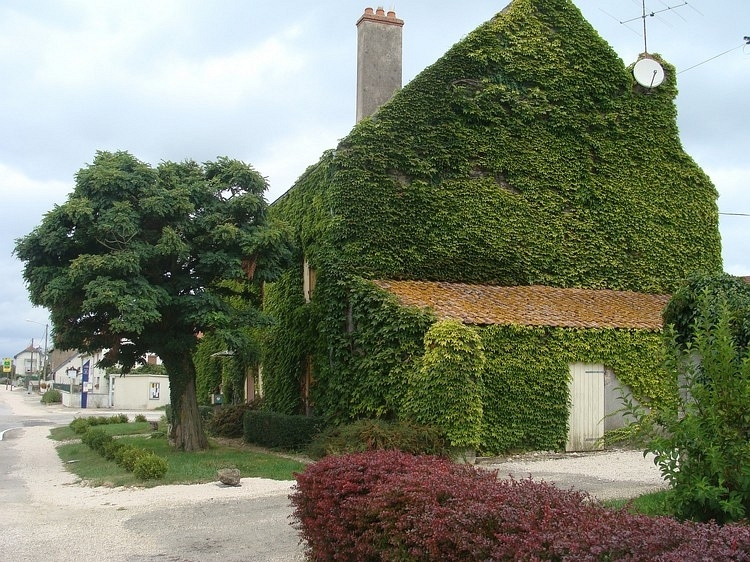 That is the reason for the vividly green landscapes. On a beautiful hillside area I have lunch in a restaurant with a magnificent view over the valley. I have never eaten truffles by now and I decide that I do not begrudge myself this novelty. The Tuscan specialty is in my view somewhat overrated compared to other mushrooms such as the ordinary mushroom. But I am hungry and empty a whole cup of Parmesan cheese on the spaghetti and the truffles. The exquisite flavor of the truffle is totally dissolved in the much stronger flavor of the parmesan cheese and I do not bother at all. 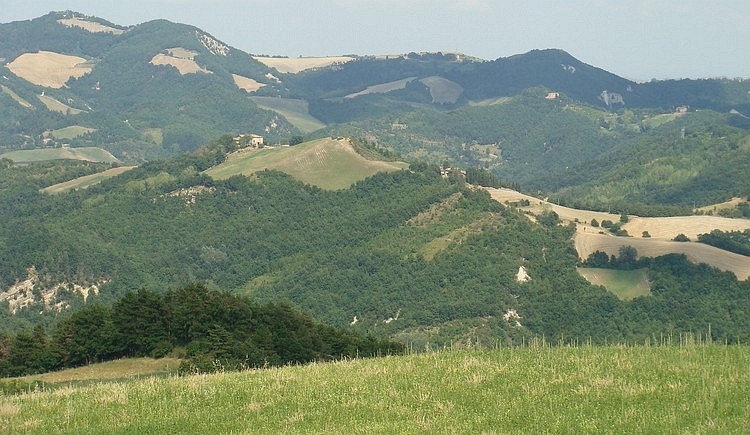 It gives me the right energy for the last hills that separate me from the camping of Siena. Finding the right exit road out of a major Italian city: why does it have to be so difficult??? Why are there never ever any signs??? 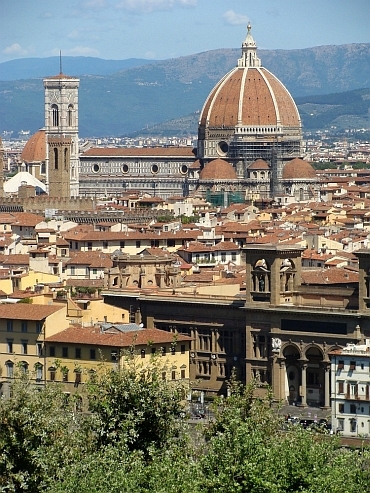 Siena lies on a hilltop and therefore a wrong choice is very expensive. I have to find the right way because I have to cross the highway at the one and only right place: there is a tunnel in the highway and a wrong choice means that I have to return and that means climbing back into the town. Three times I try, all three different ways bring me at exactly the same point at the highway where a long tunnel is between me and the road that I want to follow. So three times I have to climb back (plus the first time that I had to do anyway to reach the city). I am done with myself and with all the Italians. In other countries I never get lost! That, at least, is what I tell myself. But this time is worse than ever. Out of sheer desperation I decide to follow a wrong direction. I wanted to ride into the Crete Senesi but now I am cycling to Montenori. From there I will try to find a way into the Crete Senesi once more. When I am riding on the road from Montenori to Asciano one hour later, I have reached the Crete Senesi whatsoever. 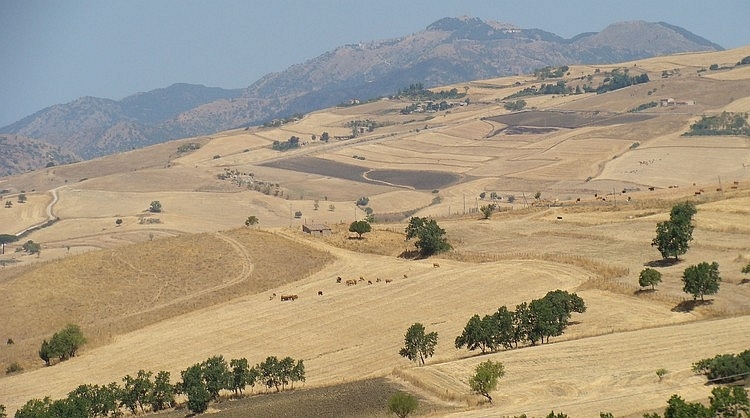 This southern part of Tuscany is much drier than, say, the Chianti region. Here the yellow tones dominate. In fact, the whole landscape is yellow, except for the inevitable cypresses. It is extraordinary panoramic. The landscape undulates endlessly. To the south the hills tend to get higher and higher. 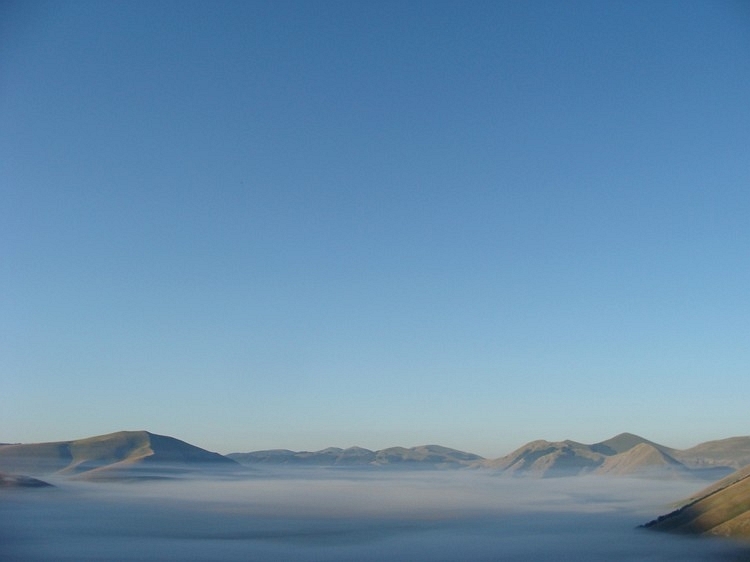 The 1700 meter high volcanic cone of the Monte Amiata dominates the view. 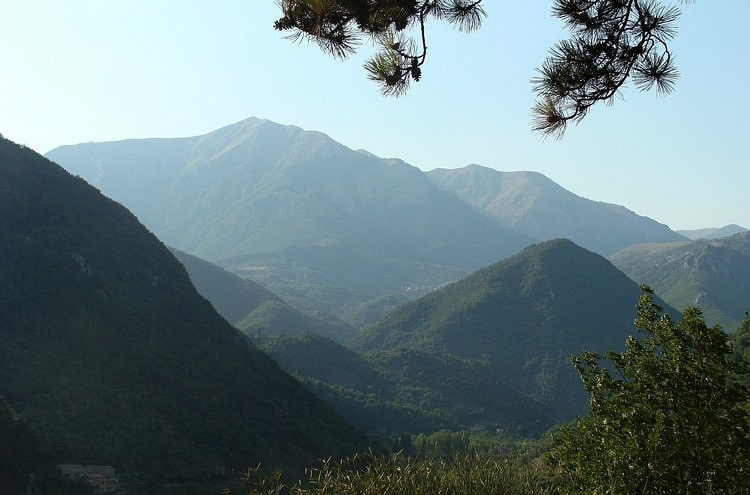 A few dozen kilometres to the northeast the green chain of the Apennines rise. As I continue to bike south, the view only gets wider. And there are some beautiful towns. 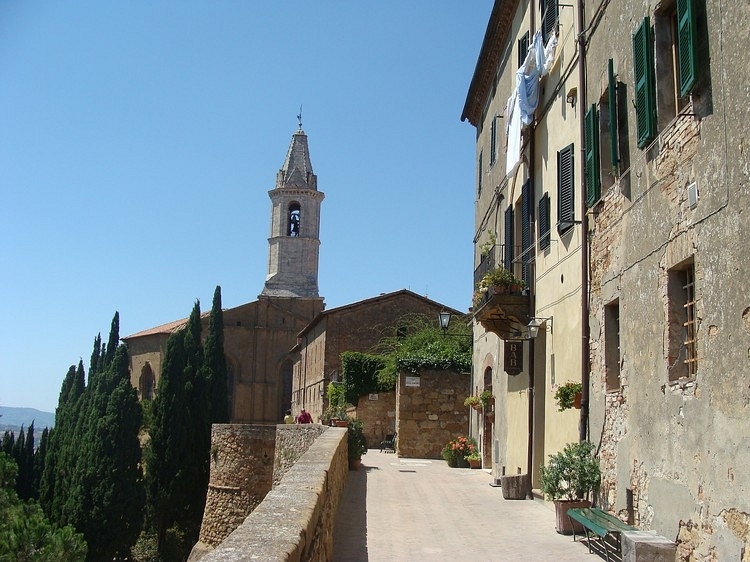 Pienza and Montepulciano have erned some fame but there also many unknown but beautiful villages that are beautifully draped over the hills. For lovers of unstable autumnal weather, the Crete Senesi will certainly disqualify. 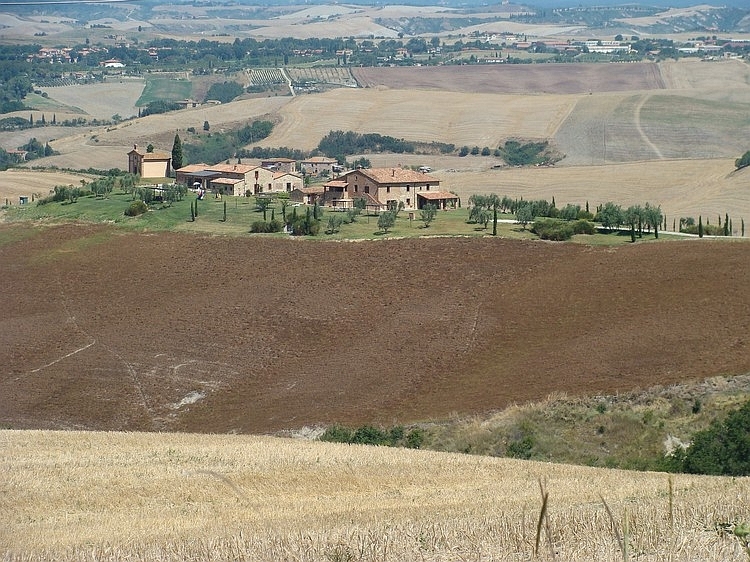 The hills of the Crete Senesi are dry, hot and brimming with sunshine. It is clear that this part of Italy is one of the highlights of the trip so far. There is a lot of climbing to do also. The rhythm is: climbing for fifteen minutes, down to the valley in one minute and then climbing again. It is a rhythm that you must like and you should certainly not consider the effectivity of the efforts. Montepulciano is the highest point of today. Deep below me I can see a vast flat area with in the middle of that area the Lago di Trasimeno, the biggest lake of Italy. The last thirty kilometres to the lake are not so special but the day still brings a highly rewarding finale as I join a few Dutch families who invite me to the barbecue. There is also wine in abundance and it is a very cosy evening. The weather is hazy and I am not in a grandiose mood. There is not a great flow of energy between me and my surroundings. 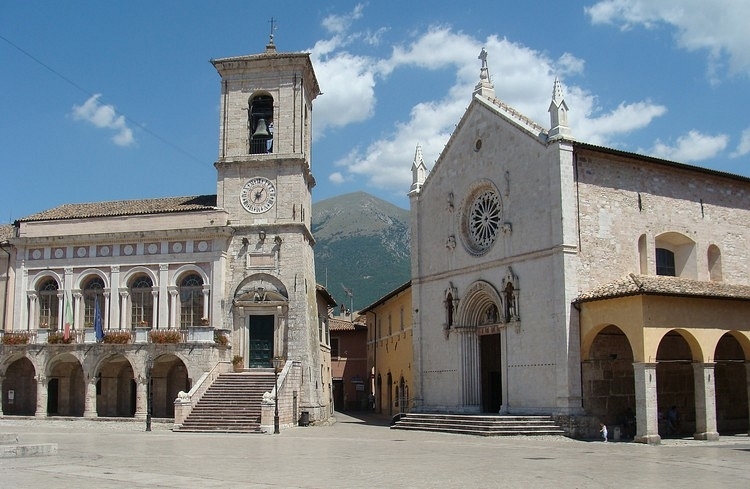 The beautiful towns of Bevagna and Montefalco can not really impress me. Probably it is myself to blame; there is nothing really wrong here actually. 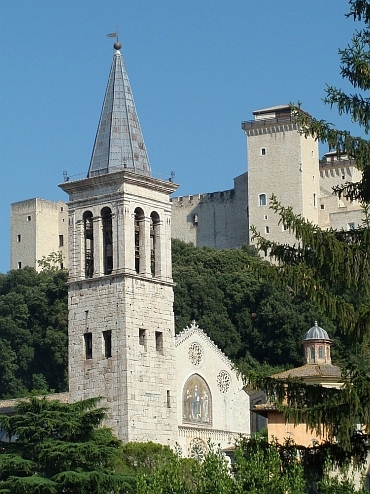 I reach the foot of the Apennines at the city of Spoleto. Spoleto is a beautiful city and almost three hours I wander through the old town with my bicycle in my hand. After the visit, the good mood is soon vanished as a signpost to the camping is put in a 180 degrees wrong direction, so that I cycle almost ten kilometres in the wrong direction. The first time that a direction is signposted in an Italian city, it is in the wrong direction! And the worst part is, tomorrow I will have to ride back again to the city, with new opportunities to miss the right turn and to get lost again. Again I am desperately looking for the right way out of town for more than an hour, before I finally find the correct exit road from Spoleto. I am only a few minutes on my way and the scenery is very beautiful. I am riding on a quiet road with no traffic now. This is the advantage of a road that no one can find: that there is no traffic. 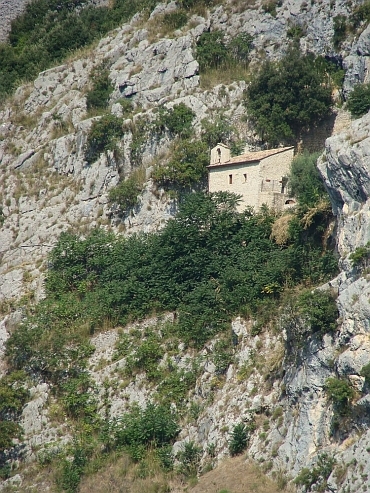 I climb a few hundred meters on the quiet road to the Forca di Cerro. On the top, it shows that the back of the pass is even more beautiful. I descend into the dark green Valnerina Valley, right in the Apennines. 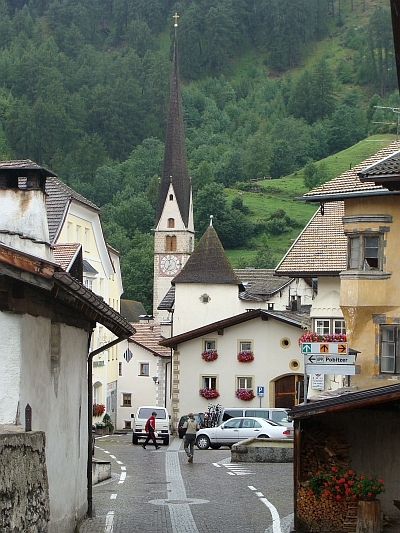 Small villages are beautifully set against the mountains or tucked into an intimate corner of the valley. 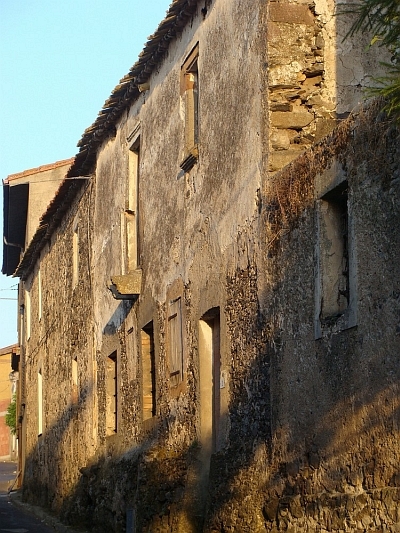 The villages are very traditional, there are no modern buildings that hide away the old houses of the village centers. In one village a beautiful young woman comes to me and asks me how I like it here. 'Beautiful', I say, not knowing whether I make a compliment to the landscape or to the woman who stands in front of me. 'Yes, it is very beautiful,' she says. I am sure that she is talking about the landscape, not about me. A deep silence falls between us. There is nothing much to say. It is indeed very beautiful here. Then she shyly draws back and I am alone again in the impressive landscape of the Valnerina valley in Umbria. 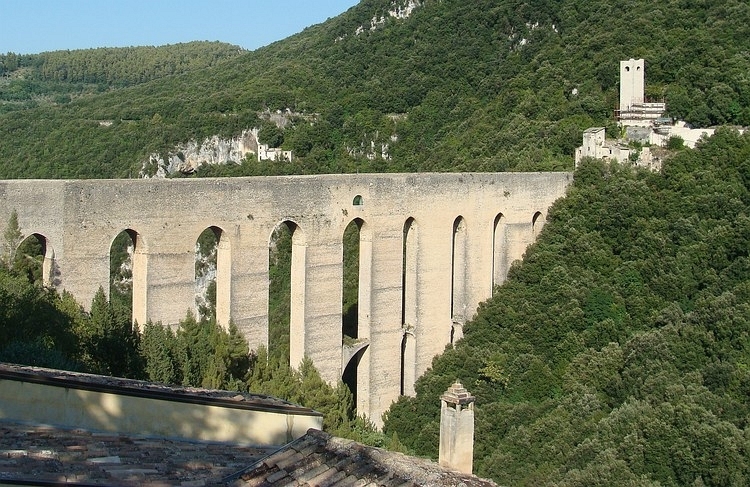 I cycle on to Cerreto di Spoleto and begin a new climb to the 1008 meter high Forca d'Ancarano. I am surrounded by increasingly scenic villages as I am proceeding. And I am surrounded by ever higher mountains as I am heading eastward. I am in the Monti Sibillini National Park now. The mountains are all above the tree line and the green valleys are lovely, with the occasional atmospheric farmhouse or an intimate village. What a beautiful sceneries in this part of Italy! There seems to be a natural beauty to everything that is here. 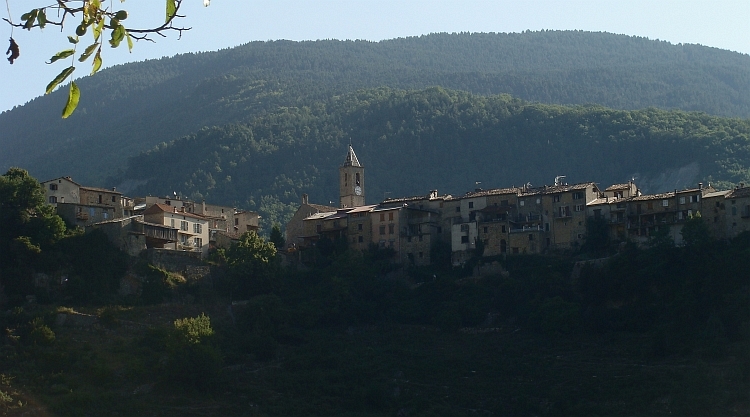 After reaching the pass I descend to Nórcia, a pleasant town in a broad valley between the high mountains of the Apennines. I have yet one more climb to do, the longest of the day. 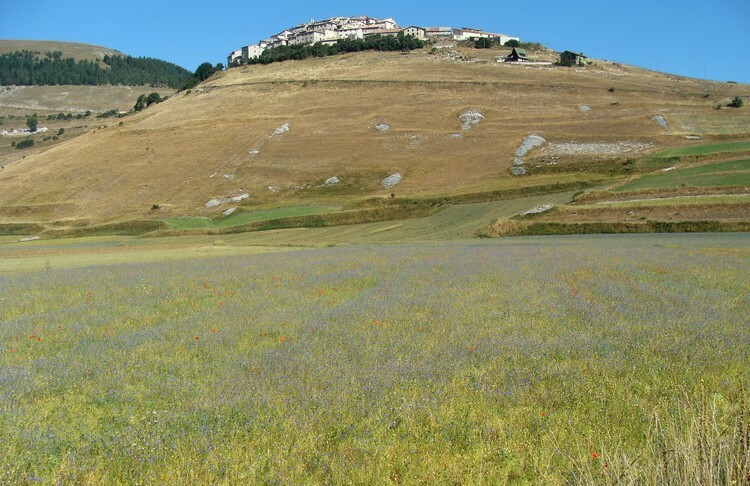 I must overcome a thousand meter altitude differnce to reach the pass at 1500 meters altitude, which divides me from Castelluccio. I make a tremendous mistake by forgetting to tap water in Nórcia. I unfortunately find out only after climbing a few kilometre. I decide that I do not want to go back; in case of emergency I can always hold a car to ask for water. It appears unnecessary. By quietly cycling up, my limited water supplies reach out and just before the pass, there appears to be a cafe where I can refill my bottles again. I reach the pass and I ride into one the most beautiful landscapes of Italy. 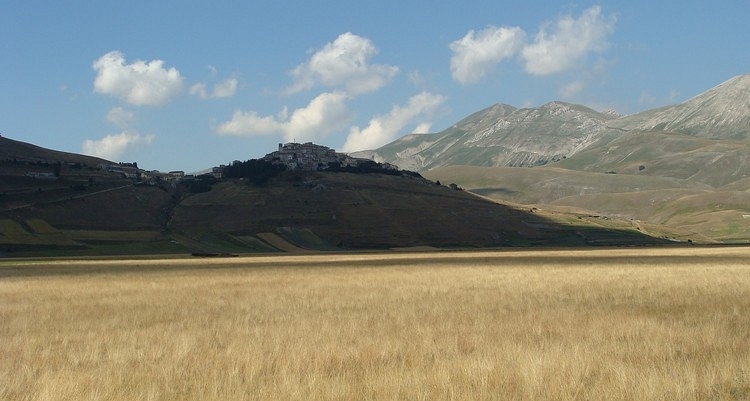 The plateau of the Gran Piano stretches before my eyes with the mountains of the Monti Sibillini at the background. The Gran Piano is as flat as a billiard cloth, without trees, but with beautiful fields of flowers. 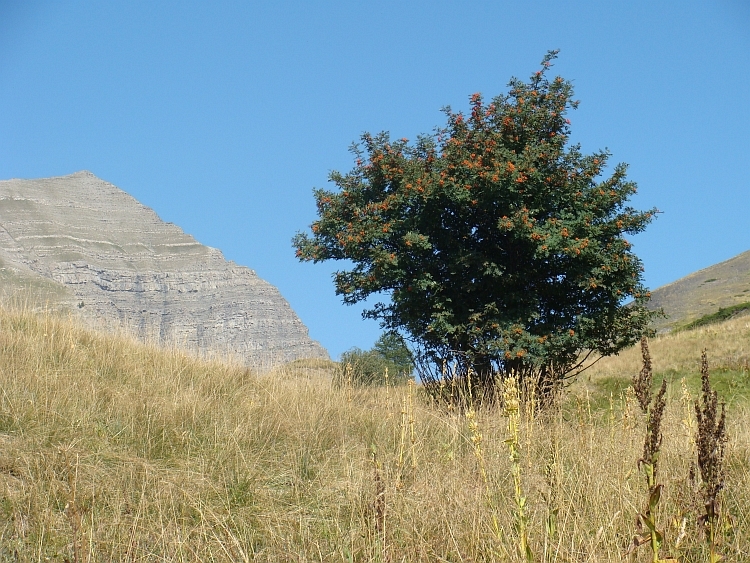 The Monti Sibillini is a wild and wonderful, bare mountain chain. 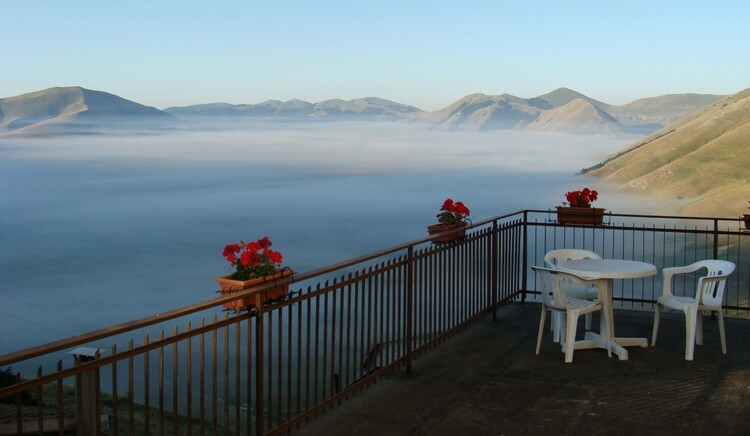 On a lonely hill in the plain lies the intensely atmospheric village of Castelluccio, draped over the hilltop. I visited this place with Willem Hoffmans in our journey in 2003. But also for the second time this landscape does not fail to impress. 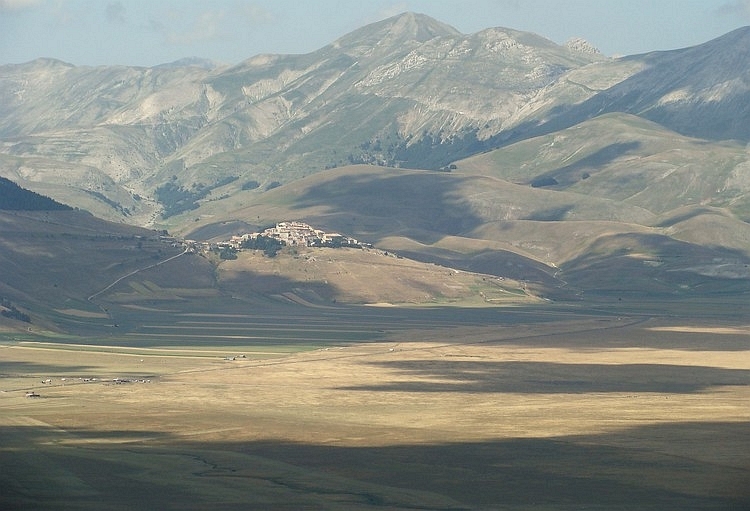 I book a hotel in Castelluccio and the rest of the afternoon I enjoy the views. 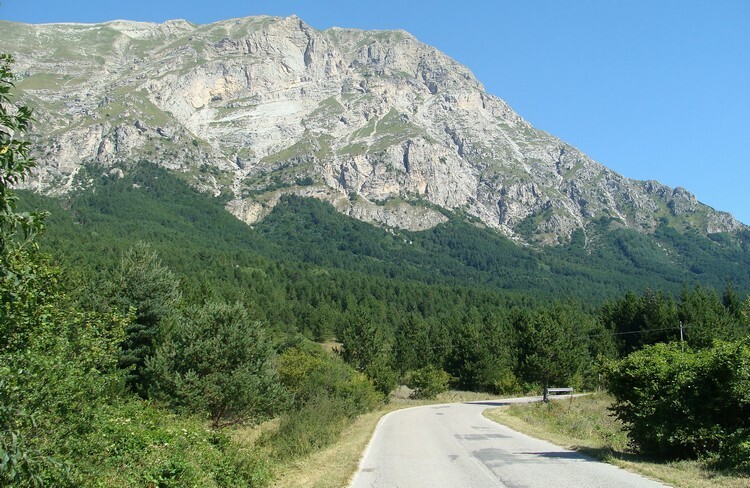 One more time I cross the Gran Piano and I begin the short climb to the Forca di Presta. One more time I have those great views back to the Gran Piano. Then I reach the pass and begin the long way down. The affected area is apparently much bigger than I expected. At home I had planned to cycle with a broad arc around the earthquake zone, but apparantly the arc is not wide enough! The problem is that I cannot go back any more. That is at least fifty kilometres back through this dreary region. So I continue and soon I see the first tent camps. In the most beautiful part of the lake there are dozens of campers. According to Berlusconi these people should take it as a nice holiday. But this does not look like vacation at all. I do not feel good to be here, as a traveler between all those people who have lost their homes and maybe even friends or relatives. I see that most people do not look too friendly and I cannot blame them. I am feeling embarrassed. Whatsoever, there is no alternative but to go on. So I climb to the 1299 meter high Passo delle Capannelle to follow the road to the east, away from the earthquake zone to the area surrounding the Gran Sasso d'Italia. It is four o'clock as I reach the pass. To my horror I see that the road to the east is closed. Desperately I am looking at my map to find solutions. In any case the solution will not be to find an overnight stay in this area. All hotels are for sale and I surely do not feel like going to a tent camp and ask for a night shelter for a weary traveler on a bike. 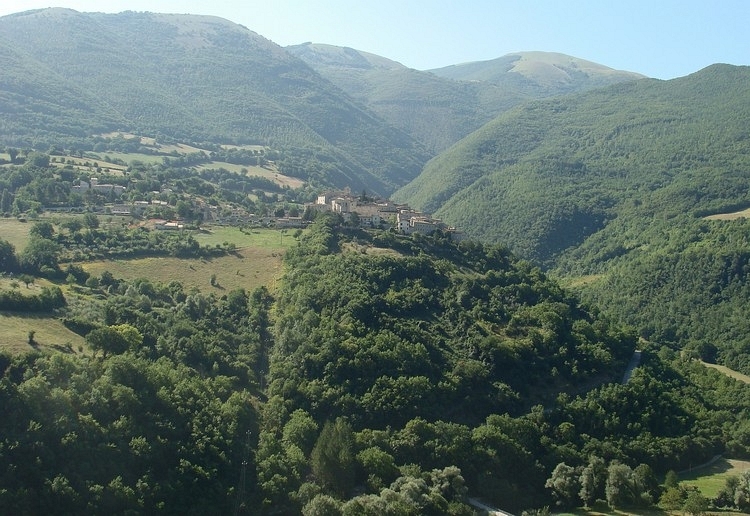 So the only option I see, is to descend to the valley of the Aterno, the valley of L'Aquila, and subsequently follow the busy road from L'Aquila to Rieti. That means I still have secenty kilometres to go! Quite a disappointment as it is already 4 o'clock in the afternoon! It is the cold hard truth. I descend into the valley of the Aterno and I see L'Aquila less than ten kilometre away from me. Everywhere around me are tent camps. I pass a few new apartments, where a lot of people have gathered. And a lot of press and police. It appears one of the first newly built complexes for the victims. The atmosphere is very emotional. Of course there are many people who have to wait years to obtain a house. In any case this is the news of the day, the news reports about nothing else really. I continue as I have got a long way to go. I have switched off the enjoy mode and switched on the time trial mode. I am going for it and at eight o'clock I reach Rieti. I have rode seventy kilometres in the wrong direction to get away from the earthquake zone, but I managed to do it and I can finally have a little rest. What now? I have completely gone astray from the planned route and I am condemned to at least three hundred kilometres of mountainous areas without many facilities. 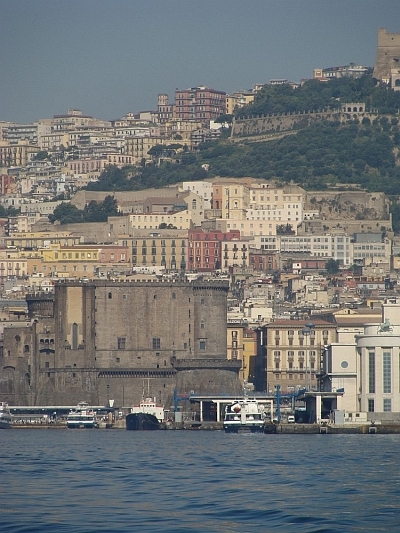 Only afyter three hundred or more kilometres I will be able to find campsites easily in the area of Naples. Before it will even be difficult to find a hotel. Moreover, the risk of closed roads due to the earthquake will remain. The first twenty kilometres I do not have a map to ride on, my plan was a route east of cycling the earthquake zone, while I am west of the area now. Therefore I do not have a map of this area. The plan is to first return on the map and subsequently head straight southward. Like Icarus, I must try to find the right balance. I must ensure that I do not bend too far to the east, then I will return to the earthquake area. But I must also ensure that I not bend too far to the west, then I will return in the mapless area. So I cycle a little back on the busy road to L'Aquila again until I find myself on the map again. The first road to the south on the map I leave the highway. So I am climbing on a narrow road in the mountains once again. After a while I reach a big lake, the Lago del Salto, surrounded by green mountains. Despite the beauty of the landscape there are no tourists here. It is too far away from the major European population centers. Maybe the landscape is not special enough for tourism. Anyway, the facilities are not there. I follow the road twenty kilometres more and then I climb into the mountains on a very narrow road. I have arrived in extremely remote areas now. In the villages the watchdogs go chasing me. Some watchdogs are extremely aggressive, it looks like South America here. In a road fork I want to take the right fork but the watchdog would not let me. I dare not confront this dog and so I am forced to settle for the presumably wrong way. After half an hour climbing I find out that I am very lucky: the presumably wrong way turns out to be the correct way. Not much later, I reach the pass. I find myself several hundred meters above the surrounding landscape. A kilometres long descent follows. Down below I find out that I have descended too far. At the last intersection I had to take an obscure branch that I have obviously missed. This branch had to bring me in Pietrasecca but I went straight down and now I have descended almost ten kilometres too far. I feel like a wog, as I will have to climb a useless hour over a busy, wide road until I am in Pietrasecca. Once arrived there, I have one more hour climbing to go over the big, busy road to Avezzano. A long descent brings me Tagliacozzo, I swap the broad road to Avezzano for the much smaller way to Capistrello. 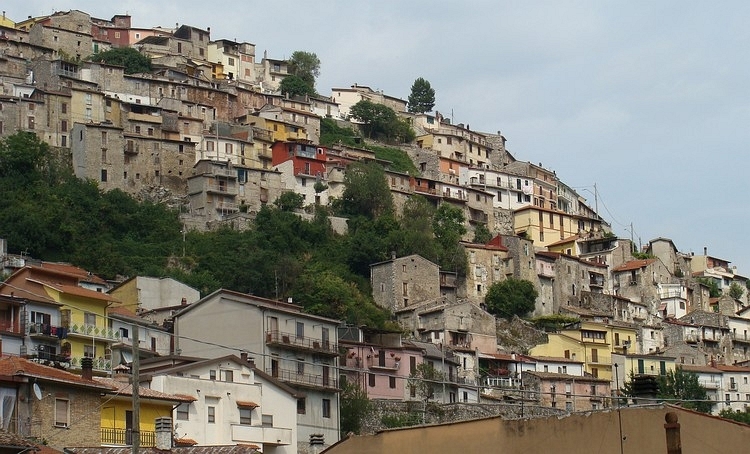 Capistrello lies against a spectacular steep mountainside with many colored houses, a fascinating sight. Unfortunately I do take the wrong exit road and I descend two hundred meters on a wrong way. I do not want to cycle back, but that means that I do have a few hundred extra altitude meters to climb. After the detour I succeed to find the right pathway and I reach the road through the Val Roveto to Sora. 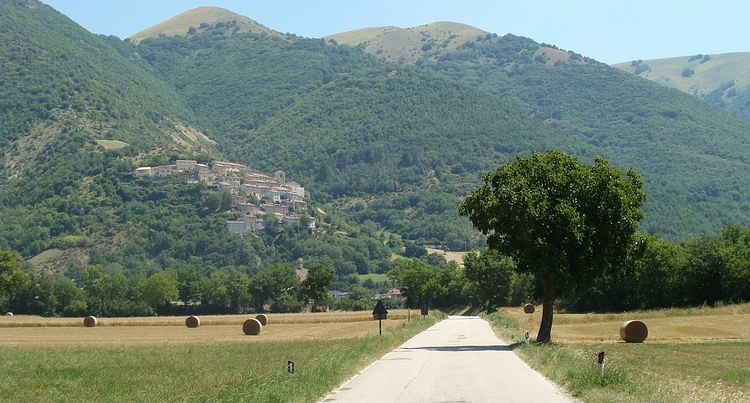 I find myself in the high Apennines now, on the left is the National Park of Abruzzo National Park and on the right there are the Monti Simbruini. It is in this area where I hope to find a place to stay for tonight. If there is one opportunity to find a campsite on the way to Naples, it must be here. And I am lucky: there is indeed a campsite indicated. I follow a small way that goes up steeply. After half an hour climbing, there is still no sign of life and I begin to fear that something is wrong. I pass a house with people in the garden and I aks whether this is the right road to the camping. Yes, I am on the right track, I hear. I am on the right track, but the campsite is closed. But the solution is simple. Get down and climb up on the other side of the valley, as there is a campsite on the other side of the valley too. I hardly succeed to subdue my inner aggression, things like this do nonly happen in Italy, and far too many times. Going down is easy and I am already busy climbing on the other side of the valley. 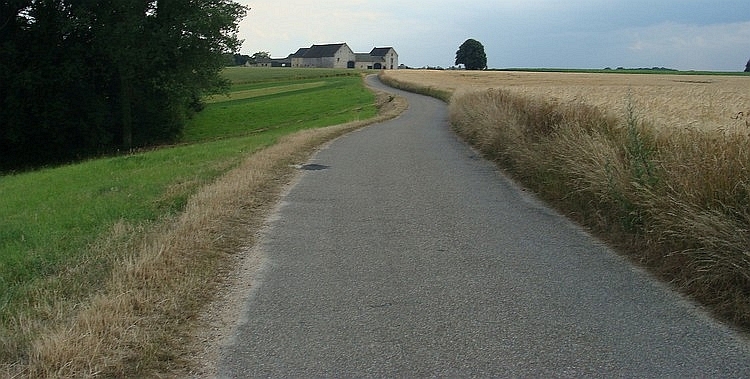 This route leads through several villages. Despite, the road is terribly bad. And the road is deteriorating with every stretching meter. The villagers look at me with pity, some people are laughing at me. I feel that they are making fun of me. I feel that the people know that I am cycling a lost cause. But this is Italy and it seems very unusual to help each other. In fact I already knew and after an one hour of incrediby steep climbing, I stand in front of a closed campsite. My head almost explodes with rage. I blame the Italians and Berlusconi in particular, the man who I personally hold responsible for a population that has been held stupid for the last fifteen years, the man who systematically withdrew the Italian people from any relevant education, any relevant information, the man who silenced the press and skilfully dismantled the legal system. And have I mentioned fifteen years of corruption? I am done. But I am not ready with the cycling day. After having cycled 140 kilometre through the mountains, it is half past seven in the evening, it does not take more than an hour until the night falls and I still have to cycle thirty kilometres to the provincial town of Sora, the first place where I can certainly find a place to spend the night. I put all my aggression in cycling as fast as I can. I need to reach Sora. In one hour I have thirty kilometres covered and meanwhile I have lost my aggressive feelings. In Sora a motorcyclist helps me to find a nice bed and breakfast. And that works out extremely well. I also find an excellent restaurant where I am totally pampered. So in the end evrything is all right. But idt did not come easily. 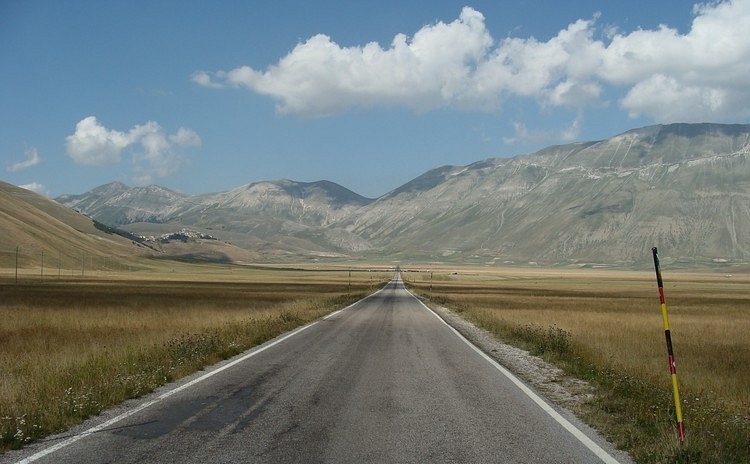 Hundred eighty-six kilometres through the mountains of Abruzzo, that is a bit too much for one day. The song remains the same. I take the wrong exit road from Sora again. This time there are no consequences. I quickly find the right way and I am on my way to Casalvieri. Over many narrow pathways I reach the little town, where a rough road leads through a rugged, sparsele vegetated, ravine to Roccasecca. I have passed the Apennines now. Before me lies a broad plain. Some twenty kilometres behind the plains there is one more ridge of hills and behind thiose hills: the sea! I cycle into the plains, to the village of Aquino. Here the famous thirteenth-century theologian / philosopher Thomas of Aquino has lived, best known of the five scientific proofs, although they are almost unanimously rejected in the scientific world. The current population of Aquino does not follow the example of their famous mystical ancestor in a radical rejection of the temporal and a holy devotion to the eternal. Indeed, the atmosphere is one of a superficial indifference. The women of Aquino seem to devote their lives like many Italian women to beauty, shoes and jewelry. The men of Aquino to speed - whether on a motorcycle or a car - or just hanging around. The people of Aquino differ from their Italian brothers and sisters. In the afternoon I descend from Sessa Aurunca into the coastal plain near Naples, in the buffalo mozzarella area. But what the h#$% is going on here? I always believed that anarchy could only exist as a most mental abstraction, but here anarchy really exist as a physical reality. In the past, several groups have planned to create a state of anarchy which is essentially an impossibility. I always assumed that any attempt to create anarchy would die in this paradox: people always tend to make plans, even when trying to create anarchy. But I was wrong. This part of Italy succeeds to maintain a state of all-encompassing anarchy, without planning, without intention, completely spontaneously. Anarchy without motive, straight chaos. My first impression: it is noisy, it is ugly and it smells horrible. It is one big filthy pigsty. The rubbish is laid down in two or three meter high ridges of refuse bags along the long road. The traffic is essentially antisocial to a level that is beyond egoism. Antisocial just to be antisocial: the kick of irresponsibility. The road is two lanes wide only and one lane is filled with parked cars. Traffic lights and priority rules are obviously not taken into account. It is the survival of the rudest. That is 1) trucks 2) BMWs 3) other cars 4) scooters 5) me and 6) pedestrians. It is tiring to cycle here. Anyone can simply insert on the road at any time out of the row of parked cars. First do, then look. That is how it works here. Every time a door can swing open when I pass along. It is one big orchestra of horns. Everywhere people quarrel, performing a drama of emotional gestures. It appears to be surprisingly easy for me to adapt to the new situation. After a few minutes I see muself raising my arms to the heavens as a BMW unjustly takes priority or performs an irresponsible trick in the traffic. The smell of the waste is unbearable. When the waste was not collected in Palermo, Berlusconi once said that the city had "the atmosphere of an African city". But I think that we must put it the other way around now. That, in case of delays in the local garbage collection in - say - Nairobi, we can say: "Urgh, it smells like an Italian city." After three extremely long and exhausting days, I feel like having a rest day. 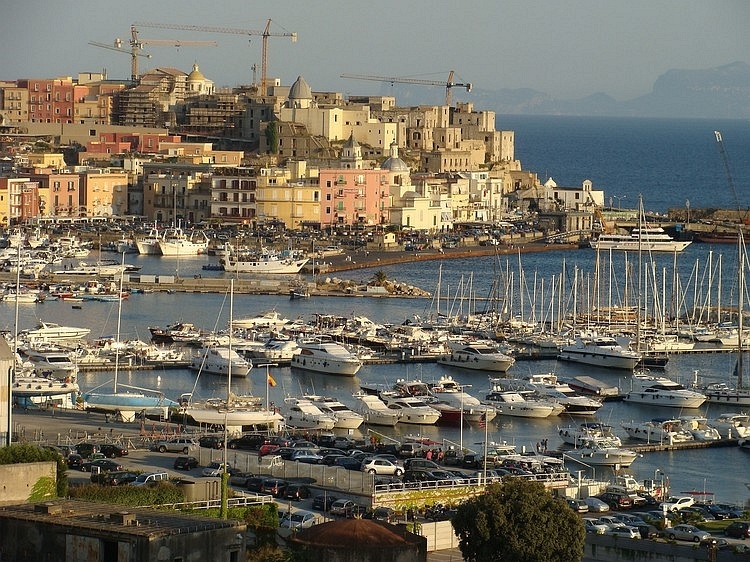 I will cycle the five kilometres to Naples and take the boat to Capri. I will spend the day on Capri and subsequently I will take the ferry to Sorrento and find a camping there. I am on my way early in the morning; it is Sunday and before the Neapolitans are awake, I have crossed the city and I am on the ferry to Capri. Naples lies beautifully on a wide bay. The hills are dotted with colored houses. The view is highlighted with the Vesuvius, an active volcano. Capri is an island with mountains sometimes straight from the sea. 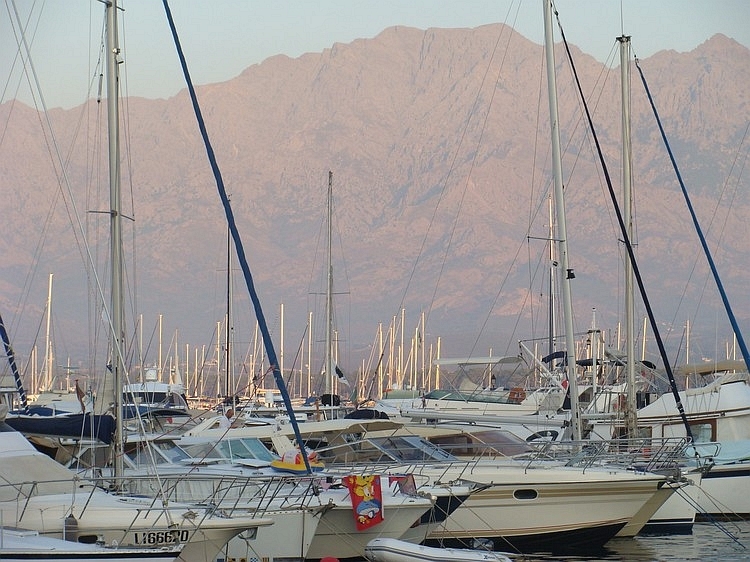 In a small bay lies the town of Marina Grande. The village is extremely touristy of course. Italians would not be Italians, if the prices were not three times as high as in mainland Italy. I want to cycle the island and I am climbing on the narrow road to the town of Capri. I am walking with my bike in my hand on the busy main street of the village. I hear a police whistle and a moment later again. I do no pay attention and I am walking along until someone taps me on my shoulder. A man points to a policeman who comes running to me. "He is coming for you", he says and leaves the scene. The cop squeezes through the crowd and stands opposed to me. Big moustache, insensitive eyes. He shows an authoritarian expression. "It is forbidden to all traffic, security." "You are not allowed to go here." "But I'm a pedestrian", I explain, "I just walk my bike with my hand through the streets." "O." I am still not impressed. If you're in southern Italian cyclist ë multiple times a day for life-threatening situations antisocial mafiose made by road users. There is never has intervened and now I am held accountable for walking with a bike... we live in a strange world! "And how must I go from the one side of the village to the other side?" "Well, at least without a bike." It looks like the cop is trying to make a serious point. "You can park your bike outside the village." "That is a very nice of yoy mister, but then thiefs might empty my bags." "That is not my problem, that is your responsibility." Meanwhile, there are cars driving in the street. I point at the dangerous traffic that the villagers of Capri are so brutally exposed at, but the cop does not even bother to look. "These people are authorized by law." "Can you perhaps authorize me as well? ", I ask. The patience of the cop seems to be over. He makes that clear by brutally pointing out that I can go to hell. This is not a heartly welcome to Capri. 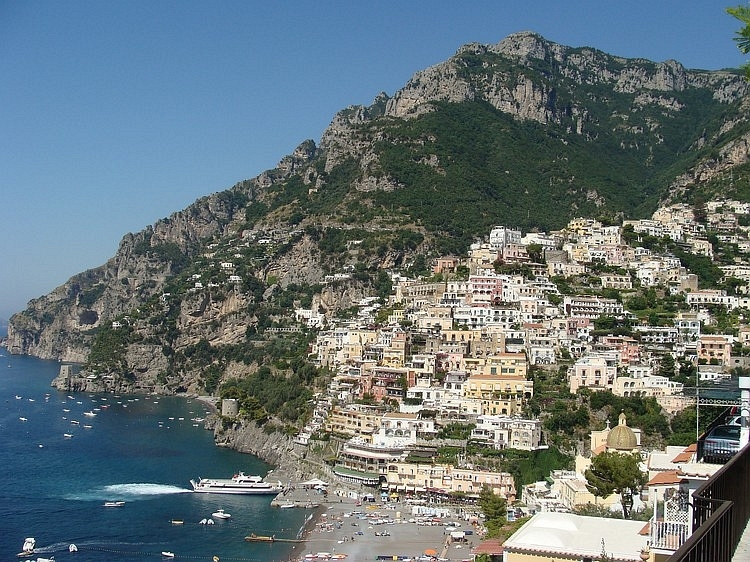 Before I get fines, I withdraw and leave the village of Capri. And I leave the island of Capri. This is not a good place. I take the first ferry to Sorrento. 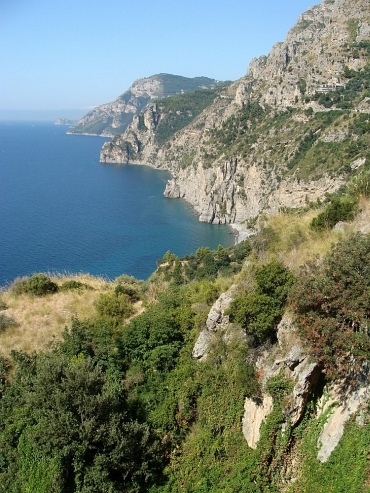 From Sorrento I have to climb seriously to the pass that divides me from the Amalfi Coast. I am climbing an hour before I reach the pass at more than 500 meter elevation. The effort is rewarded with stunning views. On the north side I have views back to Naples, Vesuvius and the Bay of Naples. 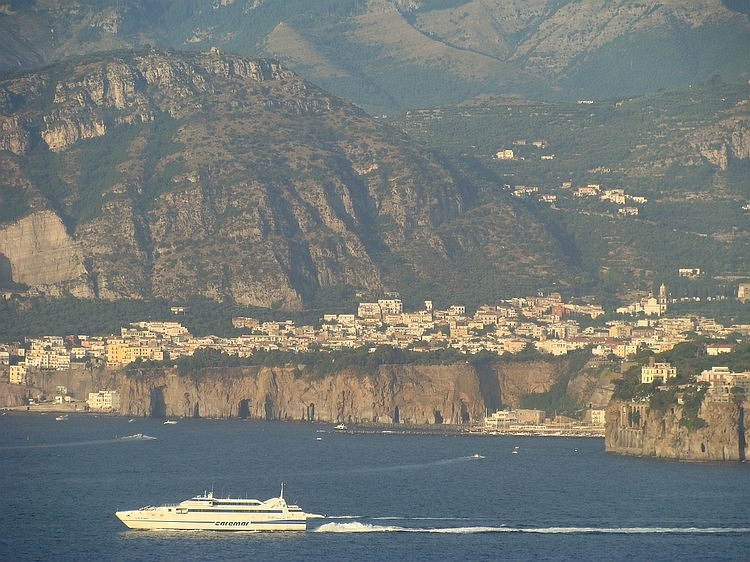 On the south side, I have views over the steep cliffs of the Amalfi Coast. I descend to the Amalfi coast, where the road lies straight against sometimes vertical cliff walls. Along the cliff coast, I descens to Positano, that lies steeply in a bay with high mountain peaks like a crown above the town. Positano is the first of a long string of villages and small towns that lie spectacularly on rocks, hidden in coves or steeply against the cliffs. 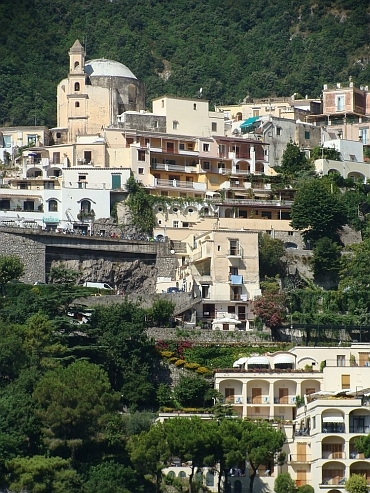 The architecture of the villages may not be very unique, the dramatic setting in the landscape make the towns and villages of the Amalfi Coast so special. Today I enjoy. 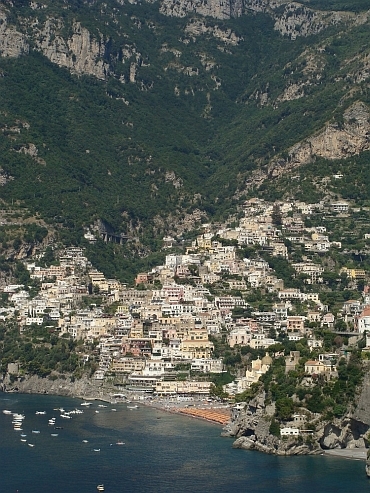 The Amalfi coast makes me think of the Cinque Terra, at the Ligurian coast. The hours slip by and at two o'clock I have crossed the area. The port of Salerno marks the end of the Amalfi Coast. Here I will take the ferry to Sicily tomorrow. It would have taken me three days to reach the south point of mainland Italy. From Reggio di Calabria I could have taken the southernmost ferry to Sicily. The problem for me is that there is only one departure per week from Palermo to Sardiny. 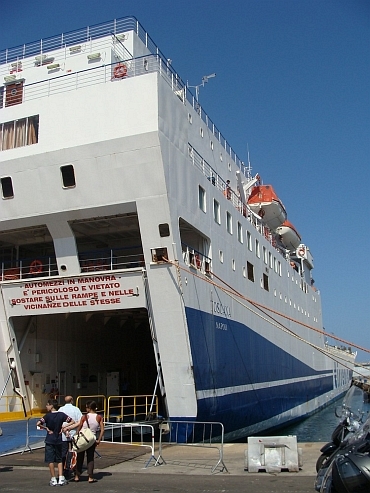 In order to catch the ferry to Sardinia, I have to take the ferry from Slerno to Sicily. So I will not continue to Reggio di Calabria but I do want to continue forty kilometres to Paestum before embarking to Sicily. 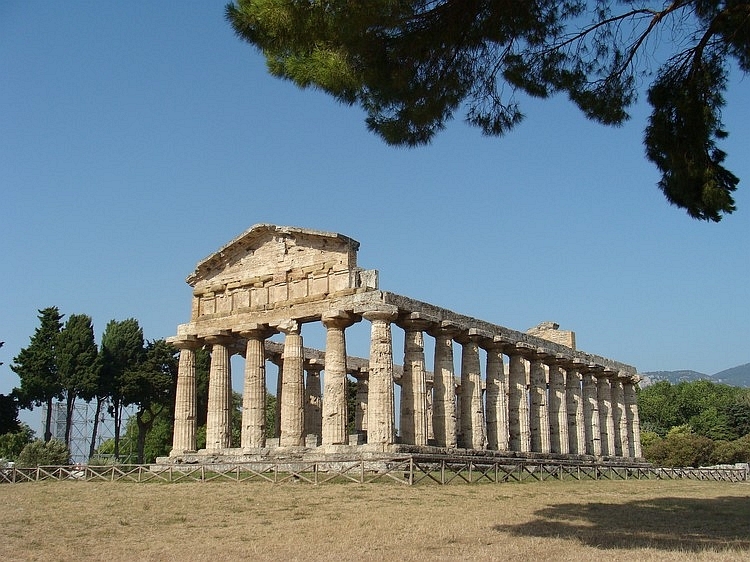 There are two ancient Greek temples in Paestum that I want to visit. The road from Salerno to Paestum is as flat as a Dutch polder and despite the heat and the headwind I cycle in two hours to the Greek temples. Near Paestum I find a campsite as well. 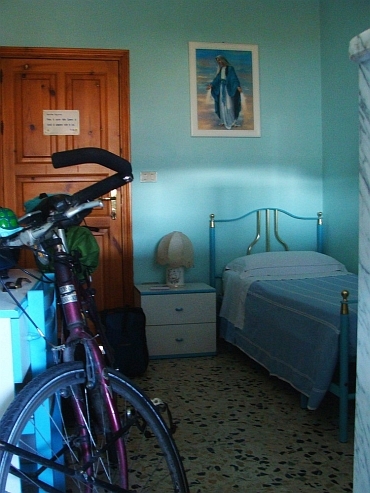 Tomorrow I will cycle the same road back to Salerno and then take the ferry to Sicily. I arrived with the ferry in Sicily yesterday night at ten o'clock and luckily I succeeded to find a hotel in downtown Messina. The hotel is not exactly a five star hotel but I have had a good nights sleep whatsoever. 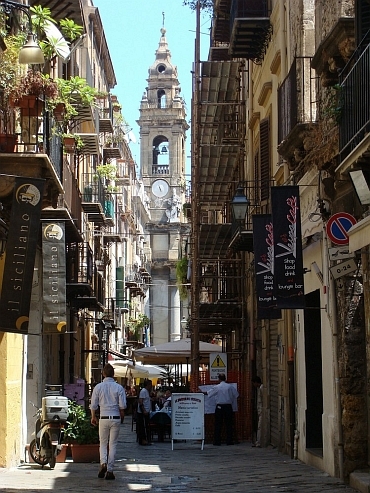 Messina does not fascinate me and neither does the coastal route to Taormina. In Naxos I meet a special man of about sixty one years, who begins telling me about his tragic lovestory as a young man. Forty years later he is still in pain and looks back in melancholy. After Naxos I leave the coast and ride towards the Etna, that is veiled by clouds today. 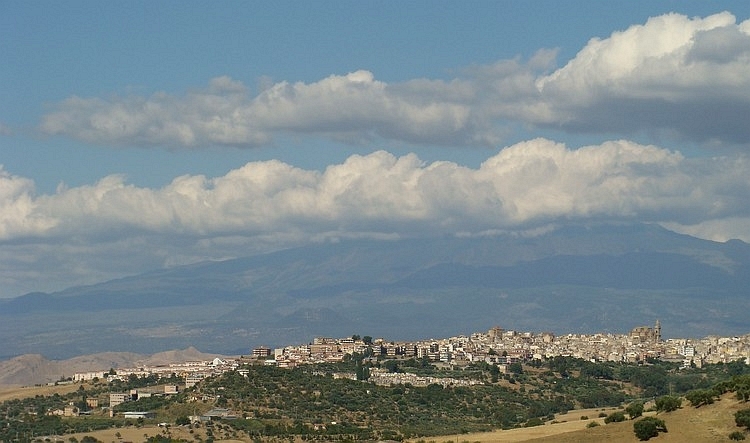 Through the beautiful town of Castiglione di Sicilia I cycle to the campsite of Milo, which appears to be closed. I am forced to move to a luxurious hotel in Zaffarena Etnea. From Zaffarena Etnea I start the day with a big climb: from 500 meter to 1900 meters in fifteen kilometres. 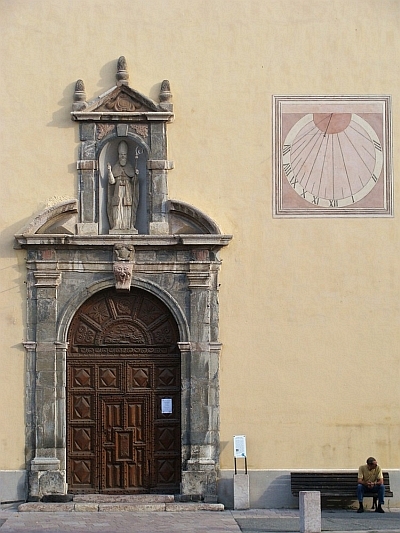 There is the tourist center of the Etna. 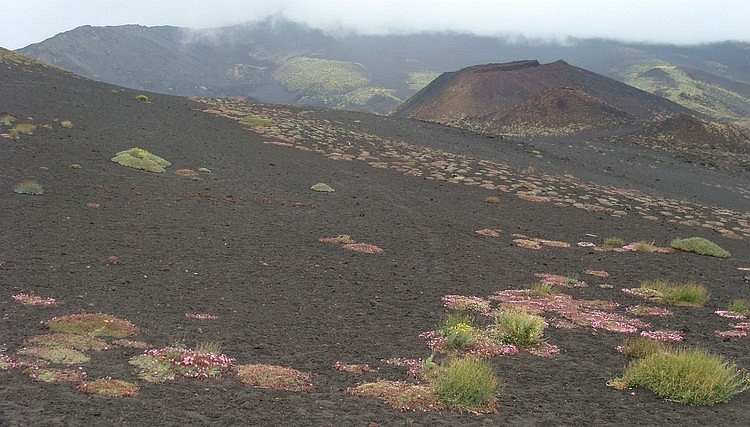 The summit of Mount Etna is much higher, at 3300 meters altitude, but you can only reach the top with an organized tour. 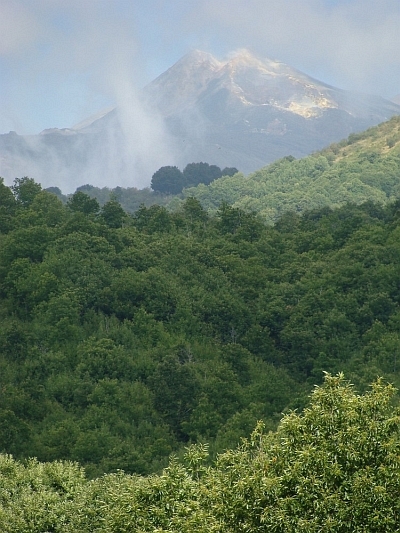 I climb through the deep green forests of Mount Etna until after a few miles I cycle through magma fields. A barren brown landscape is all around me now. The road switches up through the wilderness. I continue on the winding road up but often I keep silent for photos. Unfortunately the summit of the Etna is soon wrapped up in clouds. Rapidly the mountain is collecting more clouds. Further up the mountain, the lava fields turn into a reddish purple and black. Pink, mossy flowers grow on the black flanks and elsewhere yellow herbaceous species grow out of the mountain. I reach the tourist area at 1900 meters altitude. From here I take a short stroll up one of the many craters that is within reach. The view is limited by the many clouds but I can still discern the sea two thousand meters below. I walk back to my bicyle and I descend to the west, down to the village Ragalna. The landscape between Ragalna and Adrano is messy and is full of newly built concrete houses. From Adrano I am proceeding to Regalbuto. I enter a dry, yellow, hilly landscape, one of the highlights of this cycling journey. The farther I ride away from the Etna, the more impressive are the views. The sheer volume of the giant volcano defies imagination. 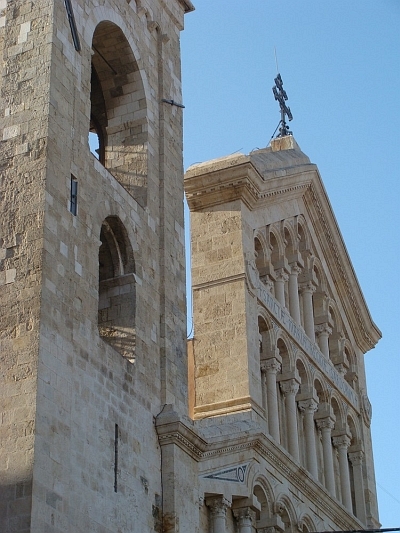 The colossus of Sicily rises far above the surrounding landscape. Seen from far, the Mount Etna has got a Smurf blue color, which makes a wonderful contrast with the yellow ocher hills of the immediate surroundings and the dark green, wooded valleys below me. 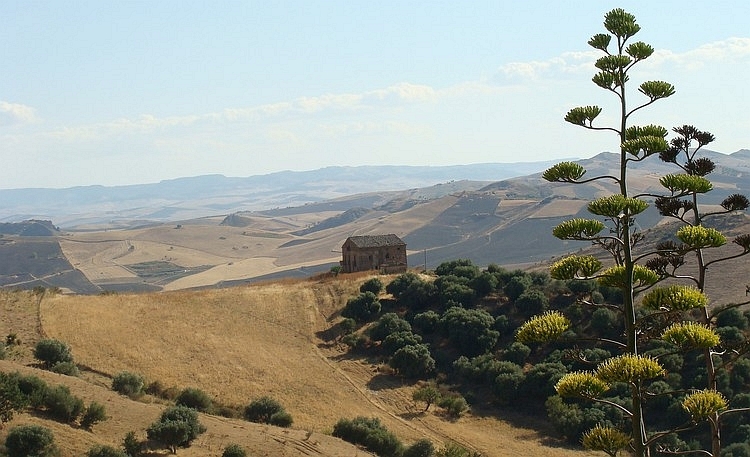 Through the parched interior of Sicily I push on through to the west. The road winds through the mountainous landscape. It is great cycling here. The road is never flat here. And luckily, the landscape is not either. There is little traffic. The temperature rises by the minute and after I have passed the beautifully situated village of Nicosia, it is burning hot. Every small climb results in a merciless sweat attack. As just before Gangi the road is closed and I am obliged to make a detour on a small farm road, I have to do an extra climb of two hundred to three hundred meters with percentages to 20%. Because of the steepness, my front wheel nearly loses contact with the ground. It is around noon now and the temperature will be at least 35 degrees. Sweat is flushing over my body, the salt water running in my eyes and in my mouth. 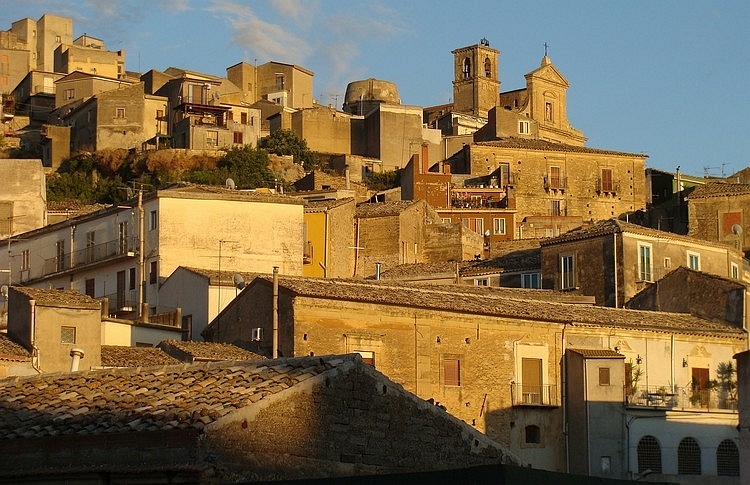 Then I am finally in the town of Gangi. 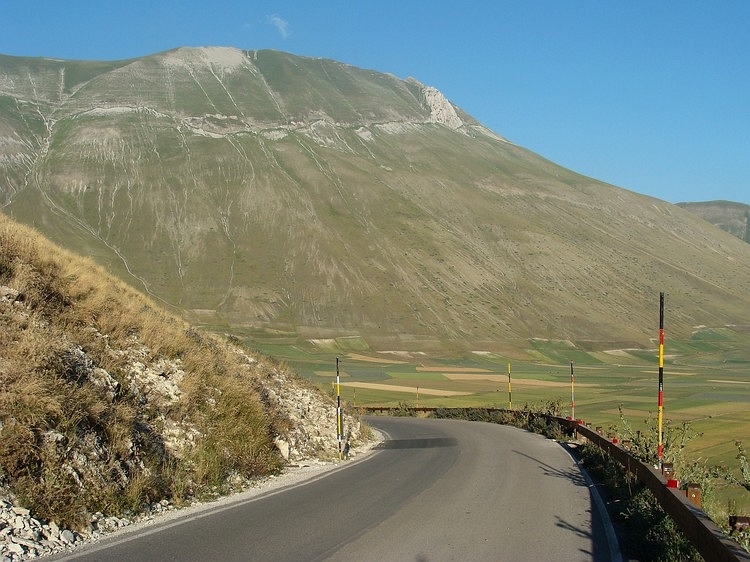 From Gangi I climb in 10 kilometre to the 1120 meters high pass, the Portella dei Bafurca. From the pass it is almost exclusively down to the sea. 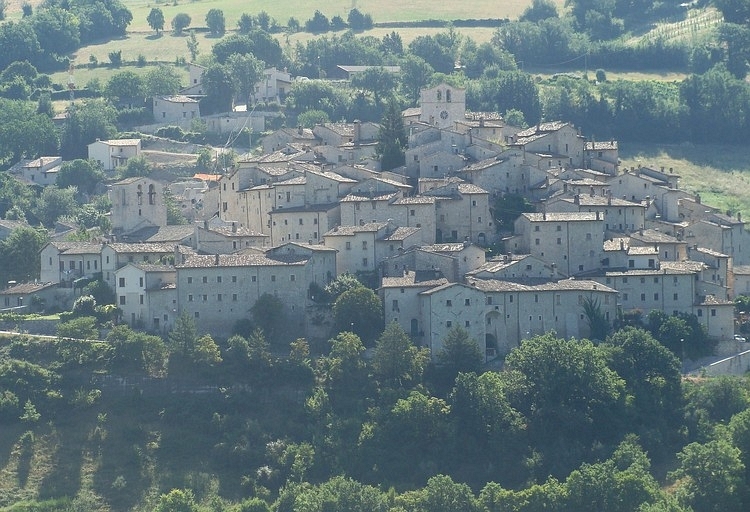 I soon pass the pretty village of Geraci, which is located on a sharp ridge. The village has got some remarkably high buildings. 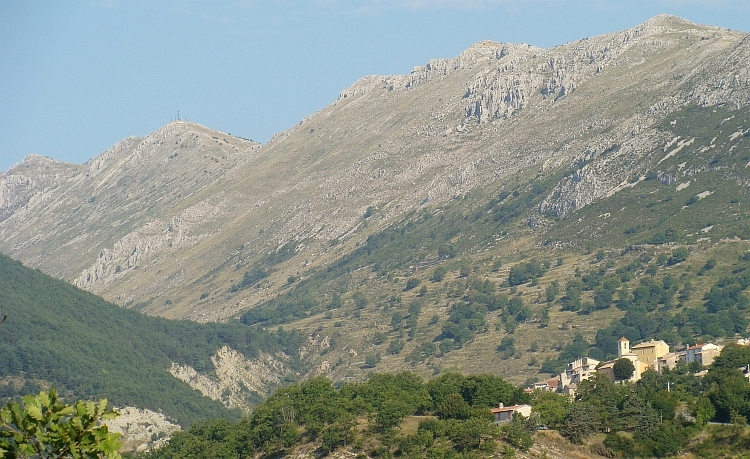 I descend into the naturul area of Madonie, a rugged mountain landscape. 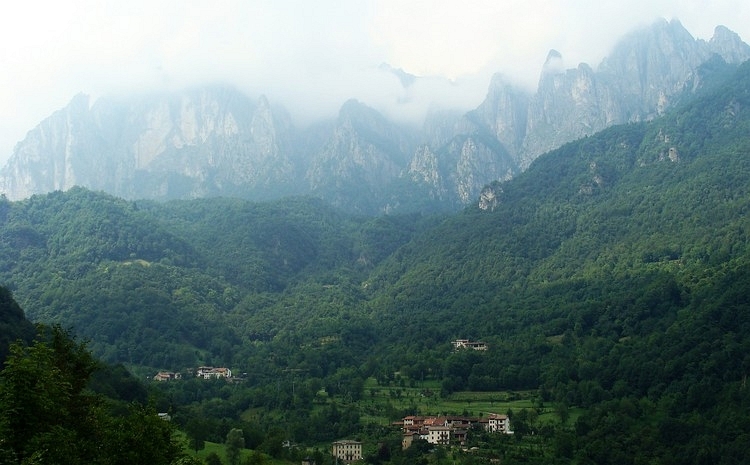 I find myself a little thousand meters above the valleys on either side of me, on both sides of the valleys new mountain ridges emerge with other villages like Geraci on top of the mountains. The descent switches from one to the other side of the ridge. The road winds in all directions and unfolds ever-new vistas. I pass the town of Castelbuono, then I have a small climb to the Portella di Monte Nero. 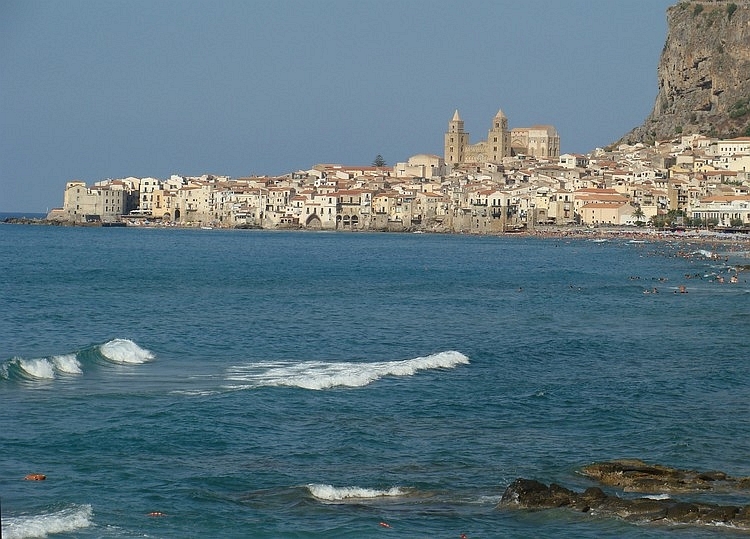 A few minutes later I descend to the sea and not much later I am in the special town of Cefalù, beautifully situated on a bay and just before a huge rock. 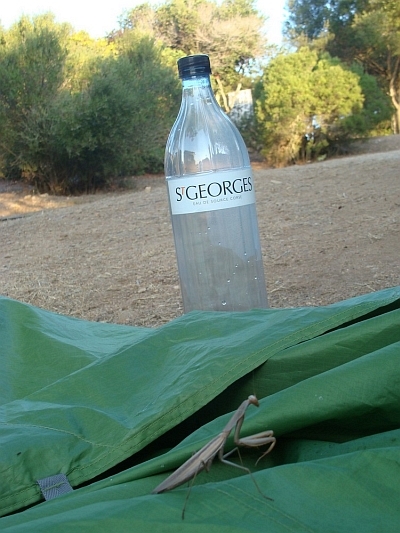 I visit the famous cathedral of the town and I finally find a camping. It is a good thing for me to be able to do my own cooking again. At 5 o'clock, the ferry will leave from Palermo to Sardinia but I do not know if I will be allowed to go. The company does not make reservations for persons without a car in the high season. On the Internet I get error messages when trying to make a reservation. There is only one company that travels to Sardinia and that is only once a week from Palermo to Cágliari. Neither on Internet, nor by phone is it possible to make a reservation. I suspect that the company can earn more money by allowing only people with cars and that the error messages on Onternet are not accidental. But maybe I am too suspicious. I decide that I give the Italians one more chance, so I will cycle to the booking office of Palermo and I see what happens. As I do not manage to arrange the trip to Sardinia, I will go with another company to Genoa, and I will cycle as soon as possible out of the country. In mostly flat 87 kilometres I cycle to Palermo, where I reach the ferry terminal at half past twelve. To my surprise a charming and helpful man arranges the tickets. It takes a while before I know whether or not it is possible for me to go to Sardinia, but after fifteen minutes the good news comes: I can go! Another man had to wait three hours for the good news, but he is allowed to go too. 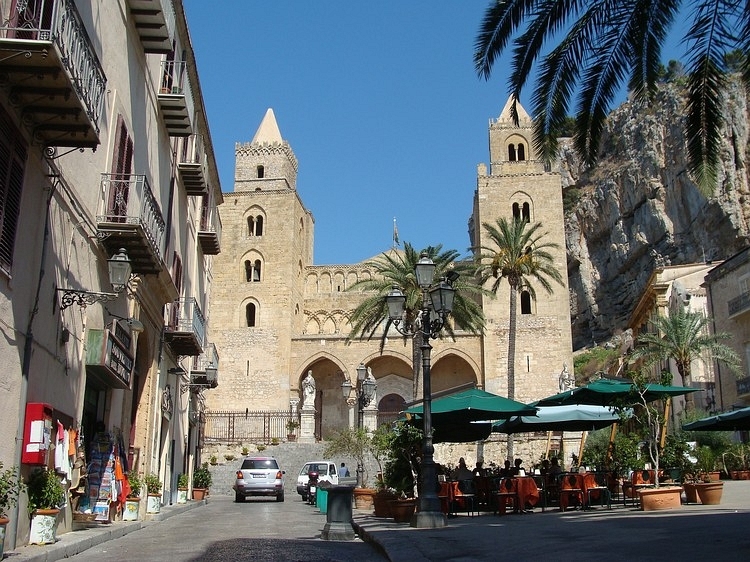 I have got a few hours yet to explore the city of Palermo and then I will make the great crossing to Sardinia, a crossing which will last up to 14 hours. Sunday, August 9, 6 o'clock in the morning. The night has been driven away by the day. My ship is coming in and arrives at the port of Cágliari. I am riding off the boat and I find a new island, Sardinia, below my wheels. 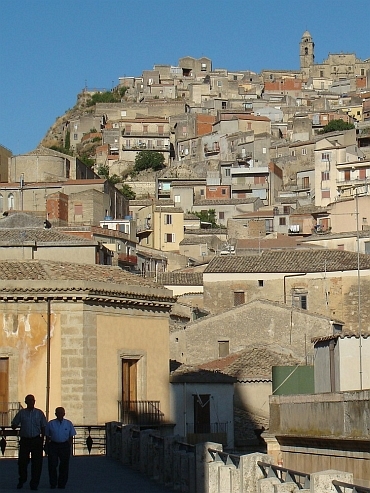 The town of Cágliari is still asleep. Through te empty streets I cycle to the citadel, to the old city. 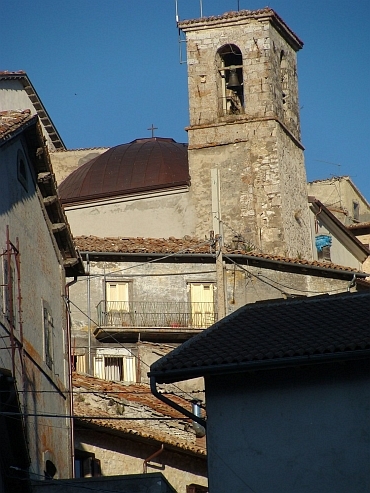 The churches, the higher points in the town, are touched by the orange sunlight. Occasionally a man or a woman is strolling through the streets, I am practically alone in the big town. A cafe is open yet, I am the first guest. From the terrace, there are beautiful views of the harbor and the hills in the distance. Meanwhile, the whole city is illuminated by the sun, a beautiful view. After a good breakfast and an equally good double espresso, I am ready for the day. I have managed to sleep quite well on the boat, the seats were pretty comfortable. I am not tired now and I feel that I do not need a shortened program today. I explore the city a little further. The cathedral is very atmospheric. Then it is cycling time. The city is slowly waking up now, but it is still quiet at 8 o'clock on a Sunday morning. 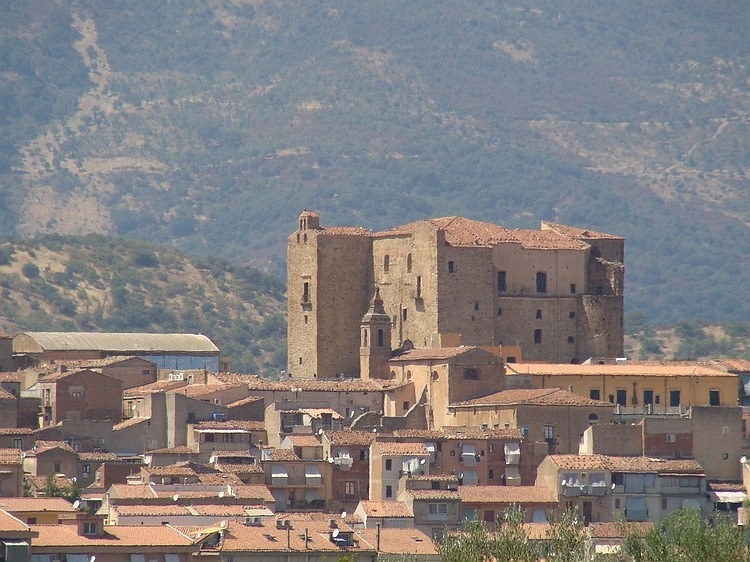 Cágliari appears to be a surprisingly big city. Like every Italian city I do not manage to find the correct exit road again. Therefore it takes me sixteen kilometres to get out of town. The landscape is almost flat and certainly not too special. I am riding to the north and the landscape becomes hillier as I am proceeding. After fifteen minutes, I take the first exit of the main road and now I am cycling on a small regional road. 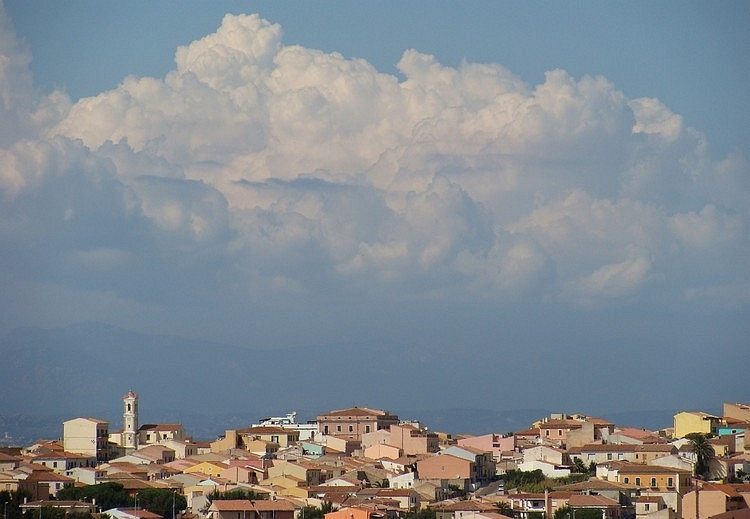 I am passing the first villages and I realise how sparsely populated this region is, now that I have left Cagliari. 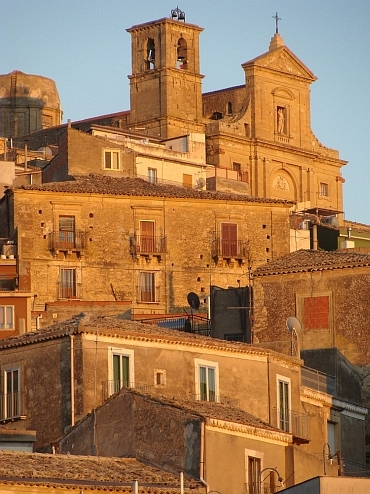 The mainland of Italy and Sicily are densely populated, even the outlying areas. 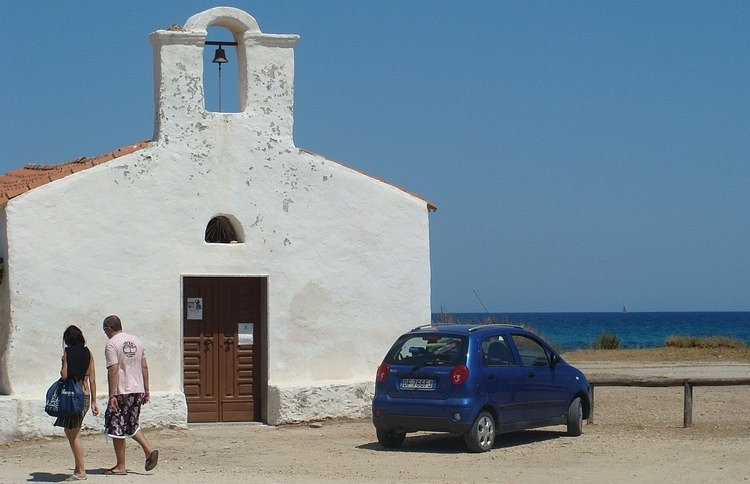 Sardinia in contrast is very sparsely populated, the rest here is very beneficial. And I am still in the low areas now. How will the rugged interior of the island be like? I will know soon enough. After Senorbi I am climbing into the hills. The hills of southern Sardinia are not as high as the central part of the island but that does not mean that I do not need not climb here. The road keeps going up. As I am getting higher, the surrounding hills seem to get increasingly higher as well. It is only 12 o'clock in the morning and it is already bloody hot. Under the influence of the wind the sweat evaporates quickly. My skin feels rough and stiff from the salt. Never before have I experienced such heat this early in the day. A prolonged effort under hot conditions is much more fatiguing than a similar effort under normal circumstances. That is my experience at least. I really do not know why that is, perhaps because of the extensive loss of all kinds of minerals and salts. The fatigue of an effort on an extremely hot day feels different than ordinary tiredness during a similar effort. The hilly landscape around me is barren and deserted. Cork oaks are the eye-catchers in this heavily weathered landscape. 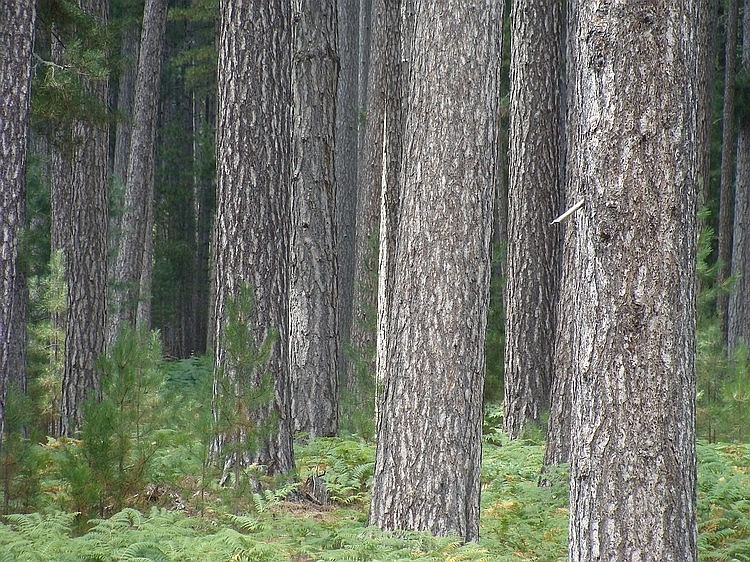 Because of the wind some cork oaks do not grow up straight, but in a characteristic s-shape. After a long descent I reach Pranu Muteddu, an archaeological site of menhirs, tombs and mysterious nurraghi buildings of perhaps four thousand years old. Who and why these buildings are built, is unknown. 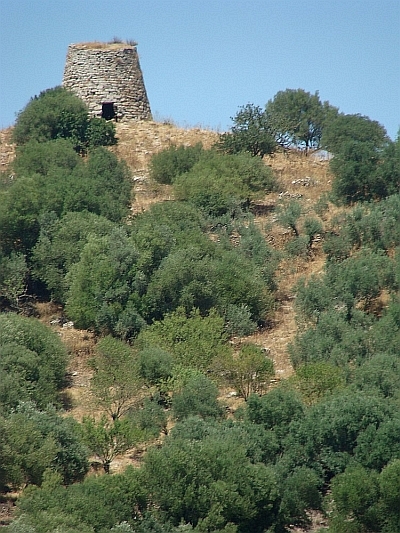 The function of the tower shaped nurraghi is unknown. The buildings are scattered over the island. I take the time to stroll across the site. When I return to my bike after an hour, it is extremely hot. This is by far the hottest day of the trip. I cycle on through the deserted landscape. Numerous hills and valleys I pass. The landscape is a plateau landscape that is cut by river valleys. The road alternates constantly between the hills and the valleys, so that I have to climb a lot. The heat, the wind and the climbing take their toll. There are not too many facilities in the deserted villages and if by chance there is one cafe in one of the villages, then it is a closed one because it is Sunday. The largest town on the region should provide food and drinks, otherwise I am having a problem. But in Escala Plano, everything is closed again. Everything except one cafe at the end of the village. And that is a good thing because I desperately need food and drinks. I am traveling further through the hills. It is late afternoon now and slowly the temperature drops to more normal conditions. That means below forty degrees. The landscape is a bit greener and I pass some nurraghi. 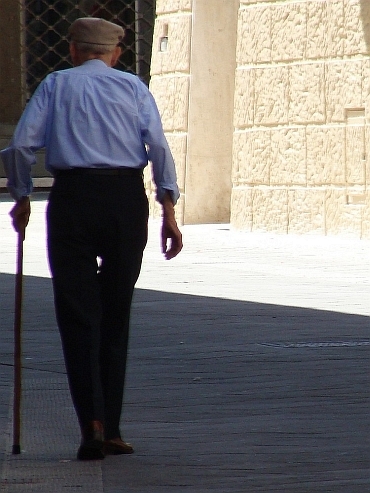 In the village Orroli I meet a group of old men, that seem to gather daily at the central square. The men are curious about what I am doing here. They ask me whether I like Sardinia. "Yes, there is a great atmosphere here", I reply enthusiastically. The men look at me bewildered. "Really?" One of the men looks surprised. "Yes," I let my enthusiasm run wild, "what about you?" "Many stones, little bread. That is Sardinia in a nutshell. More I can not make of it." These men do not owe many illusions. In the next village, in Nurri, I find a bed & breakfast. I meet two German ladies, that visit the village of Nurri every year. 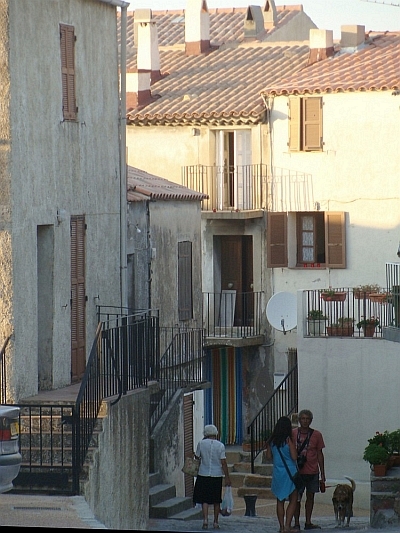 They tell me about life in the hillside of Sardinia. Entire villages have worked in the Volkswagen factory in Germany in the sixties and the seventies, that is why all old men speak German fluently. I cycle away early in the morning. I want to go early, now that it is not too hot. After a few flat kilometres and a descent I reach a large lake, the Lago del Fiumeadosa. 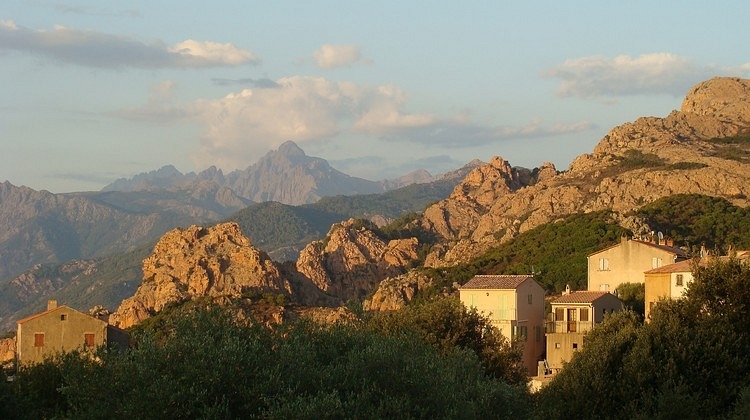 Here begins a long climb to the central highlands of Sardinia. After one hour of climbing I reach a plateau that stretches out before me. Miles to the north and to the east, new mountain ridges are visible. I cycle over the plains to Sadali as I see a gray, thick-haired dog with a thick fluffy tail dribbling before me. Is that a wolf? I did not think that there are any wolves in Sardinia but I pick up some stones and fill the pockets of my cycling shirt. Just to be sure. The 'wolf' is still walking calmly before me and does not snow any interest in me. Or maybe he does not even does not even know that I am here at all. Better thins way. Neither of us will benefit from a confrontation. After a few kilometres of cycling on the lonely plateau I reach the village Sadali. In a roadside pub I take a break to recover from the climb and from the confrontation with the wolf that probably was not a wolf at all. The immense plateau that stretched out before me cannot be considered a plateau on closer inspection. Nothing here is what it seems. 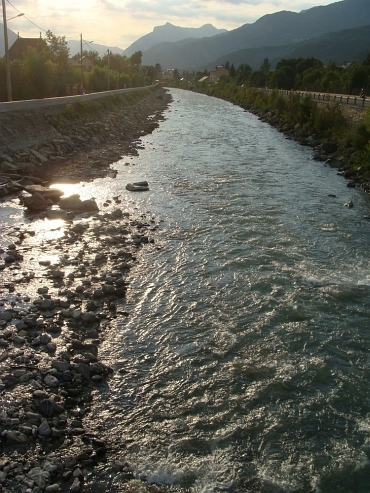 The plateau is intersected by numerous rivers. So there is a lot of climbing and descending before I have crossed the plateau. And after that there is still the real climb to do. Just before Aritzo I reach a pass and I descend into the village. 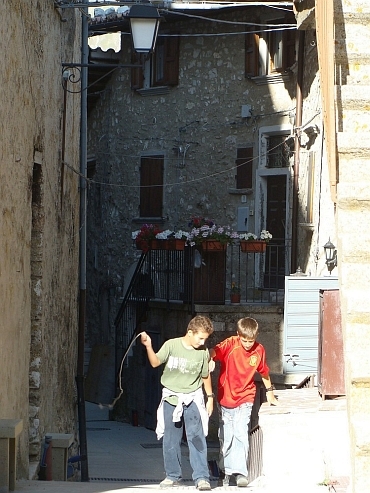 Aritzo is perhaps the most touristy Sardinian village in the central interior. That does not mean that the town is very touristy. There are not many tourists at all. There are no campings apart from the coast and there are hardly any hotels in these regions. 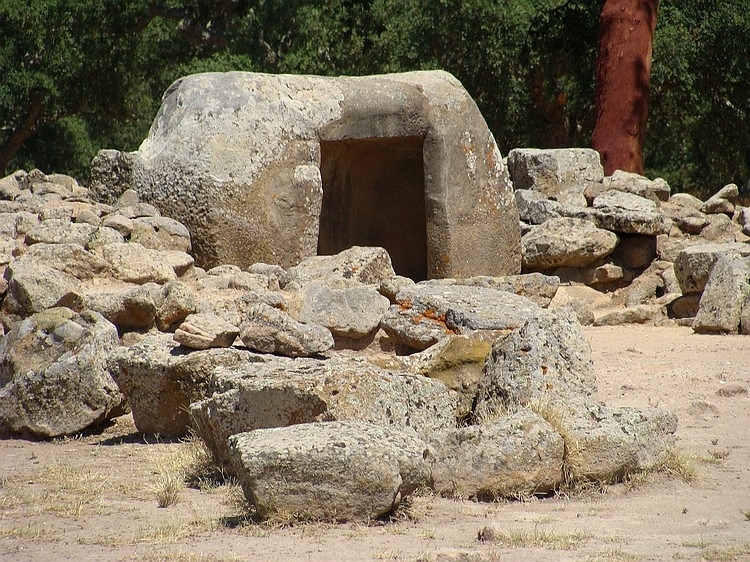 I decide to try to reach Nuoro today, the most important city of the interior of Sardinia. The heat is not too bad today. I am cycling between 500 and 1000 meter higher than yesterday and that menas that it is some five degrees cooler. And those five degrees make life a lot easier. After the long descent from Aritzo, I am climbing again. 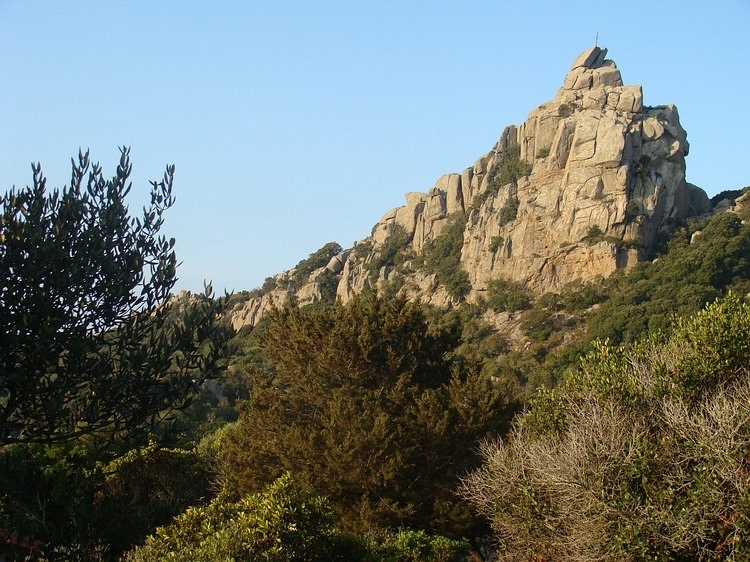 The climb is the longest of today and ends at an altitude of 1245 meter on the s'Arcu the Tascussi, amidst the mountains of the Monti del Gennargentu, the main mountain massif of Sardinia. 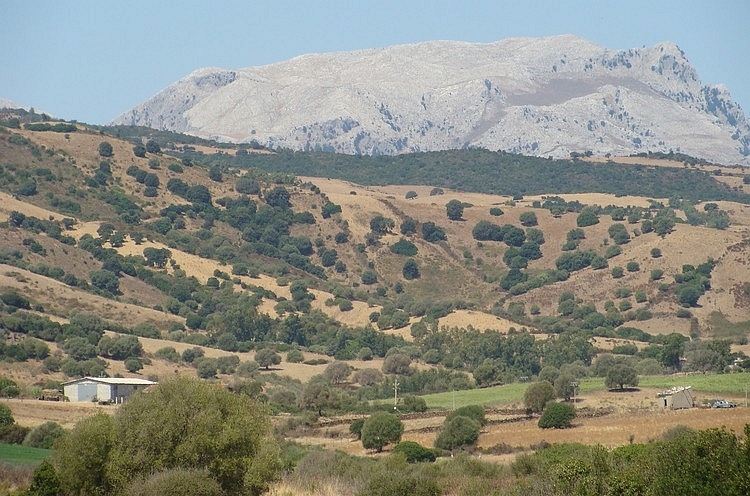 From the beautifully situated village Dèsulo there are beautiful views over these barren, weathered mountains. After having reached the pass, I am descending and climbing on the edge of the highlands. After one last climb, I have finally crossed the highlands. I descend to the village of Fonni and then continue to go down further. 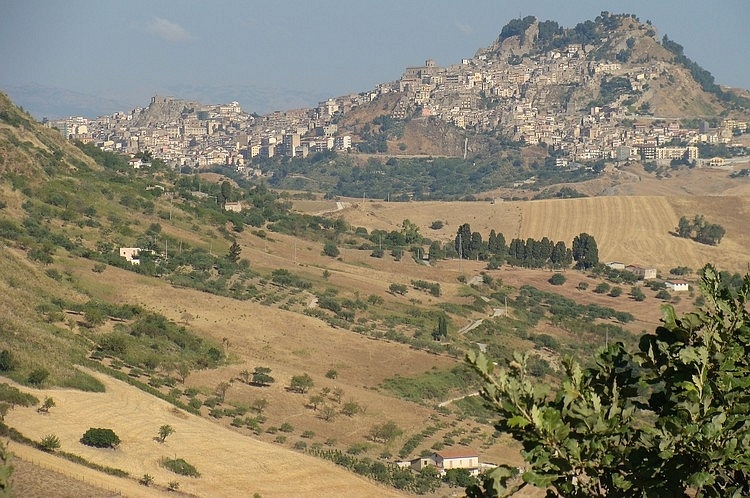 The last forty kilometres of the day are therefore covered easily and in no time I reach the provincial town of Nuoro. It takes the necessary effort to find an overnight stay, so I must be satisfied with a boring hotel in the suburbs. The center of Nuoro is not too special anyway. The town consists for the most part of gray high-rise. The view from the city to the limestone cliffs to the north however, is breathtaking. Today I want to reach the sea. With a little luck I will succeed to find a campsite today. I take a northeasterly direction and I find myself from the first minute in beautiful mountainous landscapes. 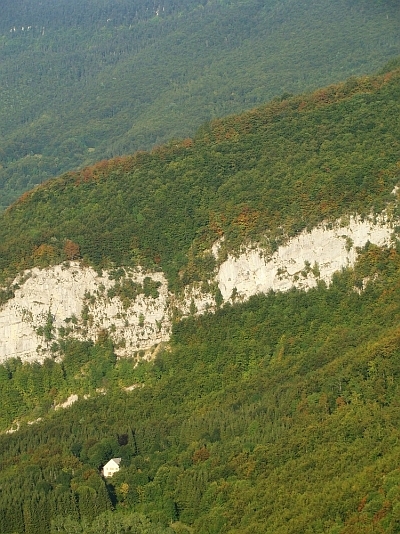 In the north lies a high, steep, razor sharp, white limestone massif. Galtelli lies south of a new, bright, white mountain massif, this time with a round shape. Here it is not the altitude but the color and the sheer volume of the solid stone that impresses. From Irgoli there is only a short climb that separates me from the sea. I reach the pass and I descend to the coastal road. It is a little disillusion as I reach the coastal road. The silence and the rest of the recent days is replaced by the very busy coastal road. The introverted atmosphere of the interior gives way to a hedonistic, consumer atmosphere on the coast. Unimaginative buildings have been strewn down haphazardly on the most beautiful spots along the coast in recent years. The coastal route is not yet very interesting. Sometimes there are beautiful views to the interior mainland. And there is the village Posada with on a small rock on a beautiful bay its little houses painted in various pastel colors. 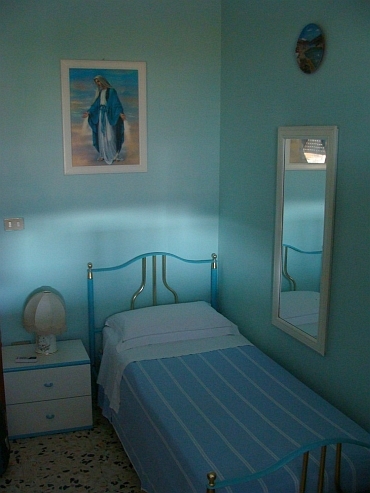 I find a camping in San Teodoro, a cheerless young Italian-only resort. The campsite itself is okay and there is space for me. 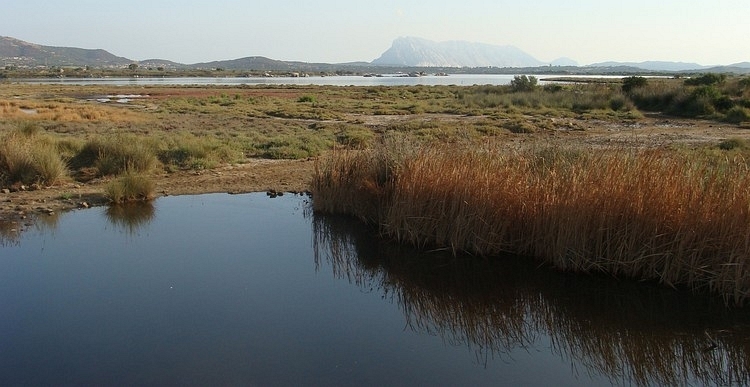 North of San Teodoro is a beautiful natural area. There is a lagoon with many birds before me, behind the lagune is a huge white rock that rises up from the sea. The huge white teeth in the landscape is linked to the mainland. The road climbs over this connection and turns around the white block. I cycle to Olbia, the largest city in the northeast of the island. From Olbia I am cycling to the Costa Smeralda. The reputation of this area as one of the finest coastal scenery in Europe is not fulfilled. Although the coast is mountainous, it is not very steep and not very high either. The landscape is green but it is completely messed up by unkindly and hastily built down holiday creatures, occupying the slopes everywhere. 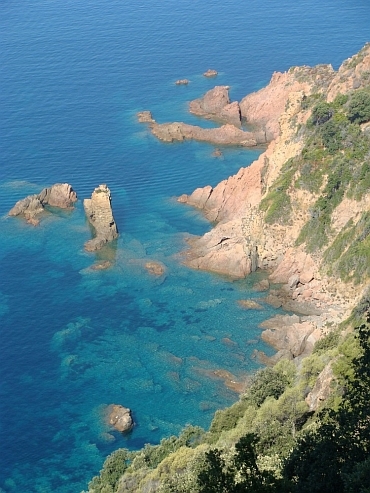 Also Porto Cervo, the northeastern tip, fails to impress. 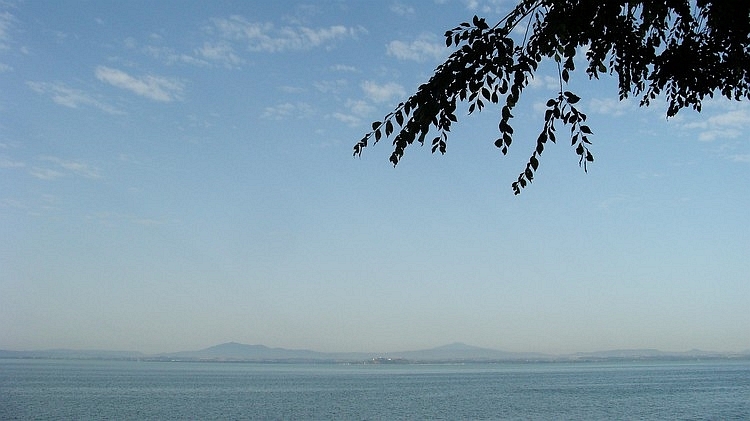 I cycle towards the northernmost tip of the island Santa Teresa. A true highlight is the rocky Capo d'Orso with a few beautiful bays and beautiful tropical style views to the islands of La Maddalena National Park. Here I meet Renzo, an intelligent man and enthusiastic cyclist. 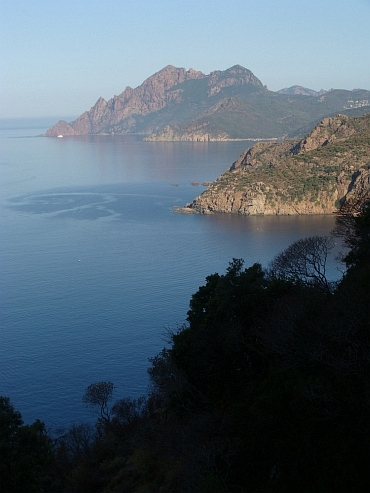 I cycle over Palau to Santa Teresa, where the ferry to Corsica leaves. It takes only an hour to reach Corsica. 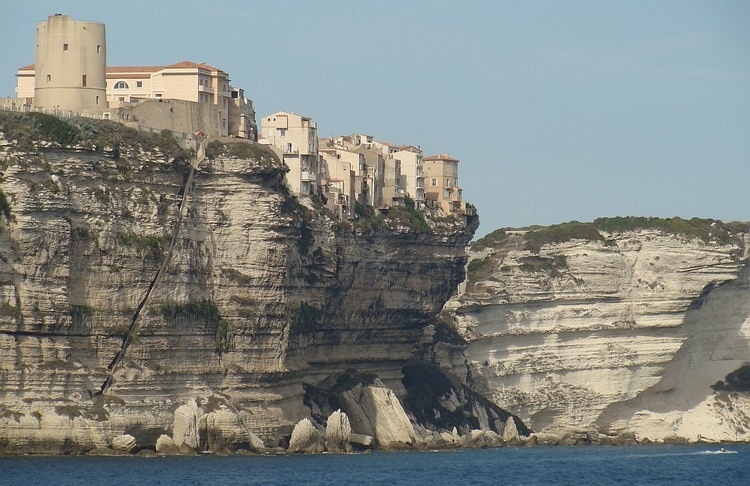 The last ten minutes of the boat trip are beautiful, as we pass the beautiful medieval town of Bonifacio on the edge of the vertical cliffs above the sea. It is six o'clock at night as I reach Corsica. I have left Italy, now I am in France! Along the south coast I am proceeding on the road from Bonifacio to Sartène. There is few traffic and there are few villages. 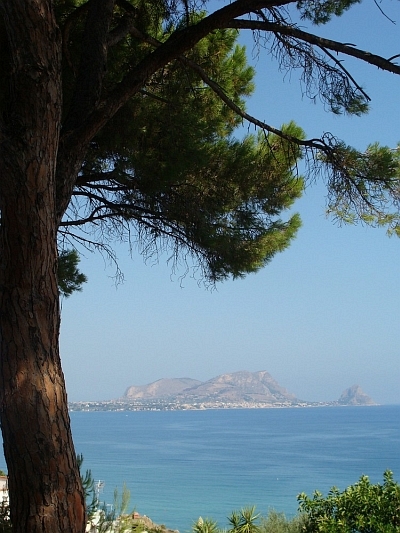 Large-scale bungalow parks or big hotel complexes as on the north coast of Sardinia are completely absent. I cycle through beautiful and peaceful coastal scenery. 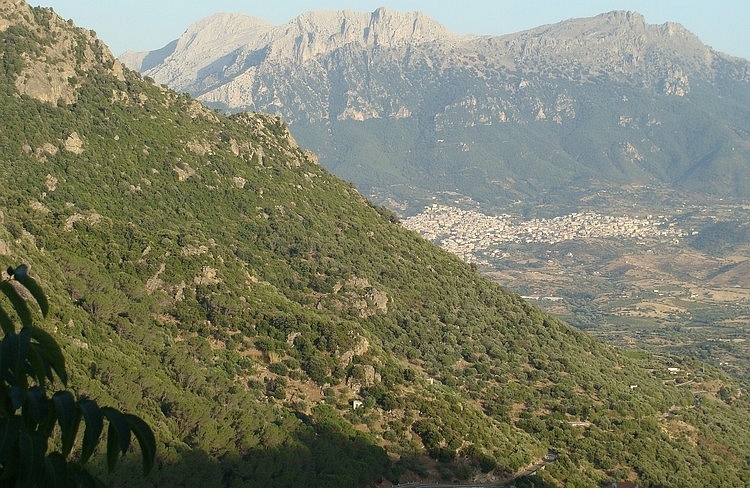 It is strikingly green after the semi-arid landscapes of Sardinia and Sicily. Just before I pass Sartène I pass an Italian young lady on a bike. For the first time in nearly three weeks I meet a traveler bike in action. She has packed her bicycle remarkably sloppy. The sleeping bag hangs loosely 'down' and almost touches the ground. The elastic straps are not firm enough, apparently. I make her aware of the fact that she almost looses her sleeping bag. She hastily and roughly pushes the sleeping bag back inside the cover. The result is by no means less messy. And the constellation really is not much tighter now. Just before we reach Sartène, I make a few pictures while she is riding on. I will not see her again. In Sartène I meet cyclists again, a young Belgian couple. They are crazy about cycling in Corsica. 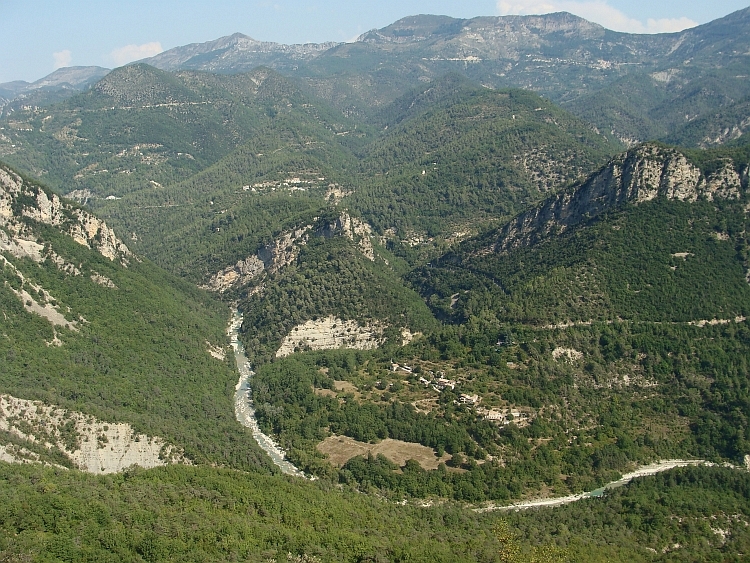 We share some experiences and I continue in the direction of Zonza, in the inland mountains of Corsica. That means climbing of course. About one thousand meters upward. After the climb the road remains at more or less the same height and winds along mountain ridges and plateaus. Sometimes I find myself several hundred meters above the valley and sometimes I go along mountain ridges that rise far above me. Most impressive are the granite rocks of the Aiguilles de Bavella. I finish the day at the camping at Serra di Scopamène, where many hikers stay overnight. 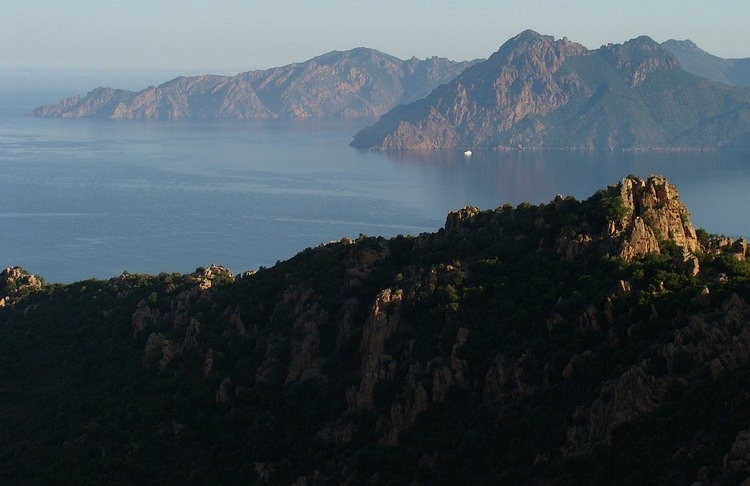 In Corsica, there are roughly three north-south routes: the east coast, the west coast and the highlands in between. The east coast from Bonifacio to Bastia is flat and boring. The route is 173 kilometre long and is only suitable for cyclists who want to cross the island as fast as possible. 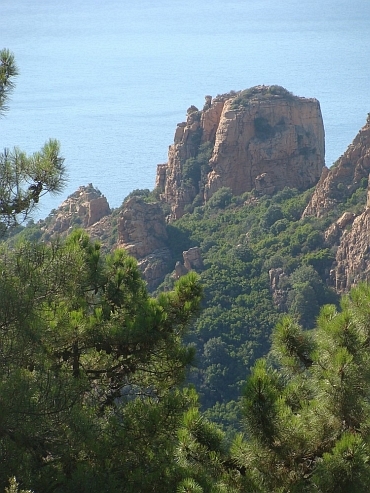 The West Coast of Corsica is very mountainous and is one long series of bays and excellent rocky cliffs. This route from Bonifacio to Calvi over Ajaccio is up to 300 kilometre long, there is virtually not a flat kilometre but probably offers very interesting to grandiose landscapes. 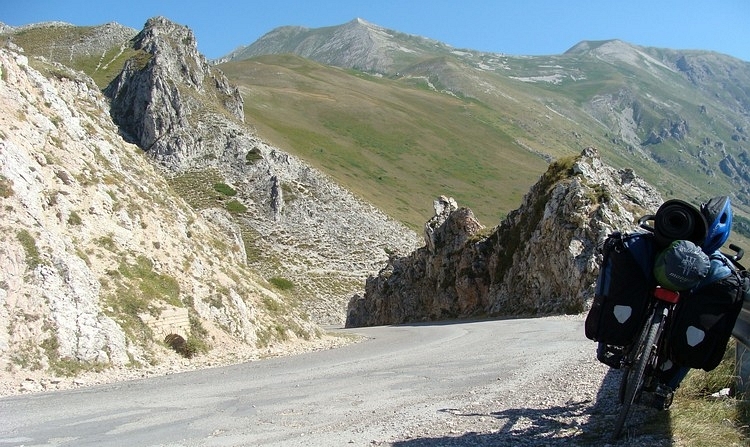 The mountain route in the mountains in between offers a lot of climbing with several passes above 1000 meters altitude and is probably as scenic as the west coast ride. 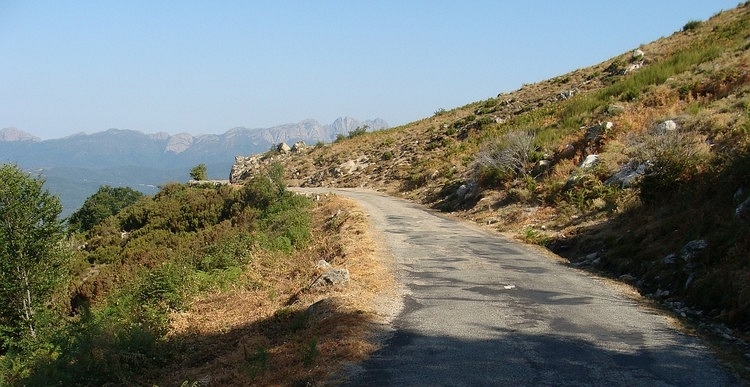 The route from Bonifacio to Calvi over Corte and the N197 is also nearly 300 kilometre. So there are two very interesting routes and one uninteresting route. I have decided to make the best of the two interesting routes. 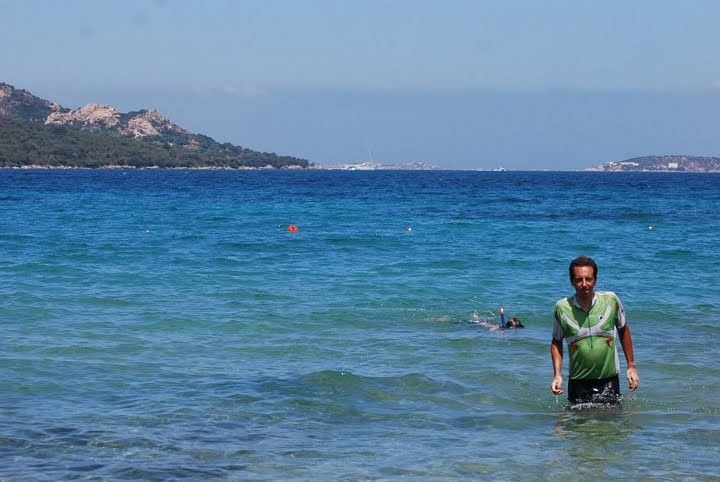 I will first cycle to Corte through the interior mainland, from there across the highest mountains of Corsica on the Col de Vergio and subsequently over the west coast to the north, to Calvi. In the early morning I cycle to Aullène. 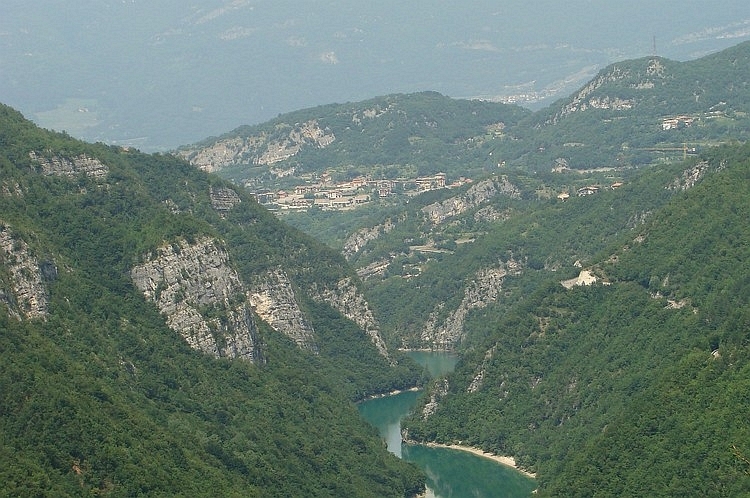 Aullène is located high above the valley of the Coscione. 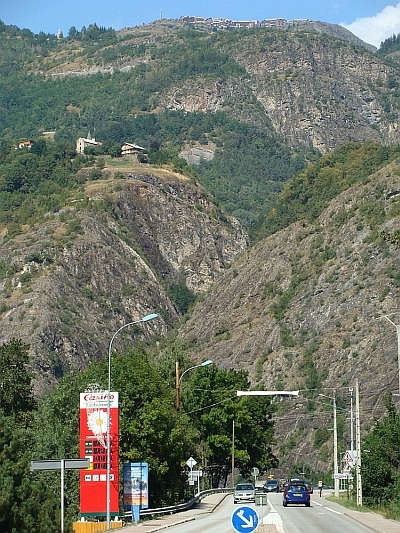 The road climbs parallel to the valley in the direction of the Col de la Vaccia. The road is not steep and after an hour I reach the first pass today. 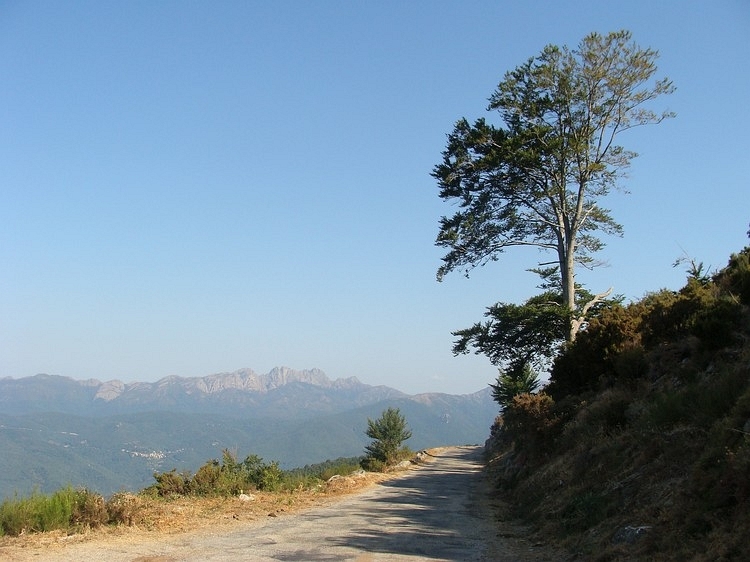 From the Col de la Vaccia I have great views to the north, to the higher mountains of Central and Northern Corsica. The next climb, from Zicavo to the Col de la Verde, is longer and steeper. The weather is not improving. A first small storm just misses. I hurry down. As I reach Ghisoni at the foot of the third and hardest climb of the day early, I know that it will not remain dry today and that I can expect the worst. Everywhere heavy, black clouds are clinging to the mountains and they are growing at a frightening pace. But the darkest clouds are in the north and because I am climbing on a southern slope to the Col de Sorba, I cannot see how things develop on the other side of the mountains. When I arrive at the pass after a little more than one hour of climbing, the sun is shining. 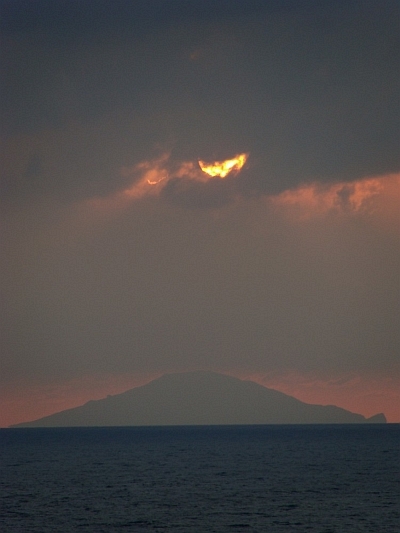 But it is a fearful sun against the backdrop of deep black clouds. A hedge of rain blocks the view to the other side of the valley. No time to lose now. I hurry down. I have barely started, as the first storm thunder blast crushes all illusions of a dry arrival in Corte. After the descent I have to cross a fourth pass today. Then the rain starts. After few minutes I cycle down through heavy, torrential rains. One thunder follows another lightning. If the thunder storm is too close, I have to get of the bike, despite there are no shelter options. More than one hour I let the rains pour down on me. The showers will not leave soon. If the thunder is finally a little bit further away, I decide to descend a bit, hoping to find a shelter. After the first turn after two hundred meters, there is a cafe. In retrospect I have let myself rain soaking wet for nothing. In the cafe I hide until the rain finally stops. When the thunder has finally left after yet one and a half hour, I decide to contine. 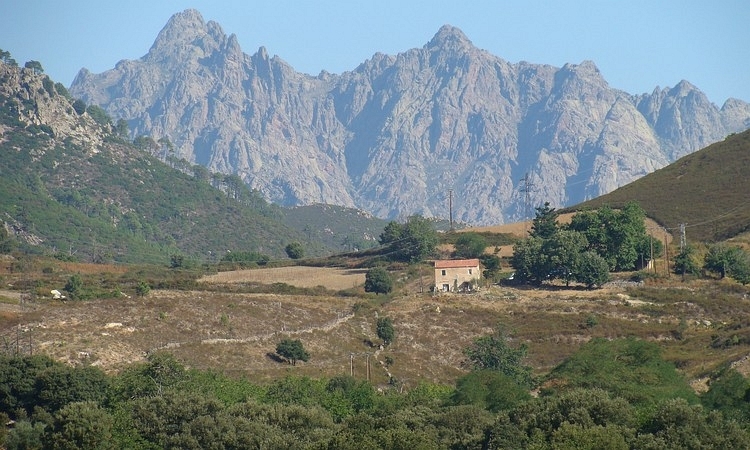 I am proceed to the beautiful villages of Vivario and Venaco and to the last pass of the day, the Col de la Bellagranajo. The last kilometres of the short climb have been dry and when I am on the pass, the weather is brilliant. The views are stunning. 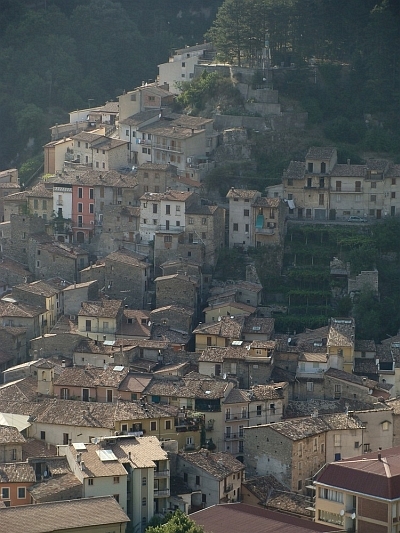 A nice descent brings me to the town of Corte, a pretty town with a citadel on a cliff. 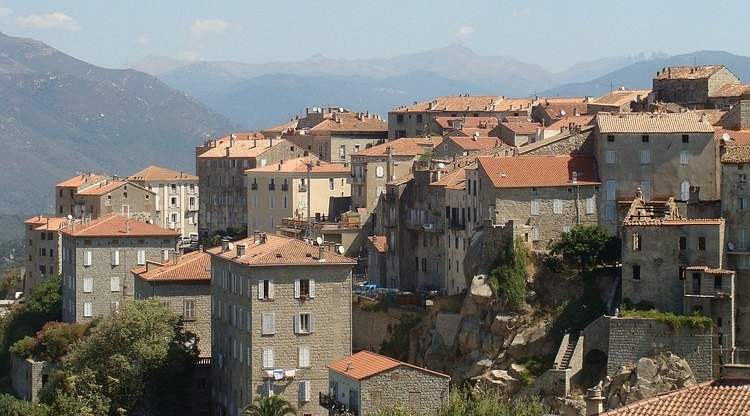 The town is the most important town of mainland Corsica and is surrounded by alpine rock formations. I find a nice campsite at the riverside. A short climb brings me form Corte on the Col d'Ominanda. Impressive rock walls are looming in the north. I descend to Castirla and here I have my first flat tyre of the trip. Once down in the valley, I can immediately climb again. I am going to the Col de Vergio 1477 meters high now, the highest pass of Corsica. I am stuck for an hour in a traffic jam in a narrow gorges, there seems to have happened an accident in the ravine below. When we are finally able to continue, I cannot see anything of the accident, which is perhaps better this way. 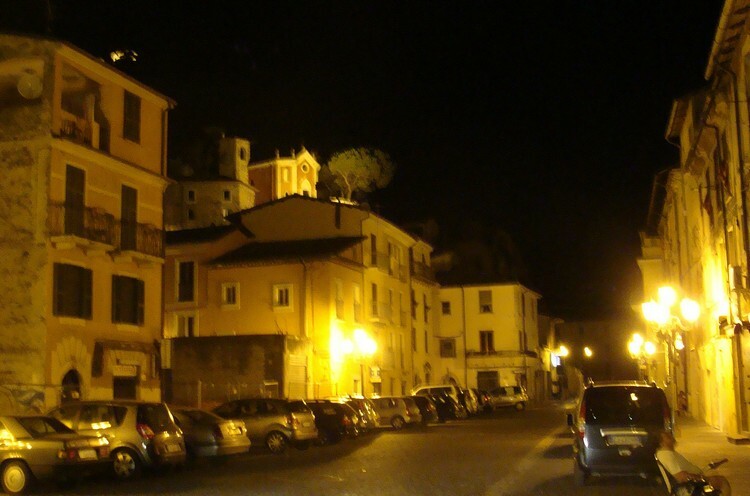 After passing the gorge I reach the village of Calacuccia. 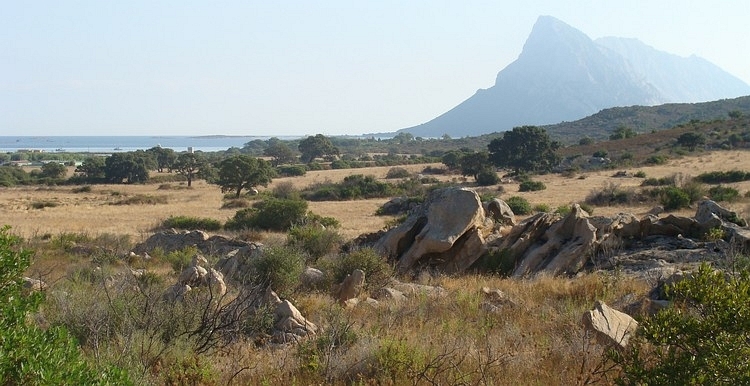 The landscape is much wider here, with views over the barren rocks of the highest mountains of Corsica. 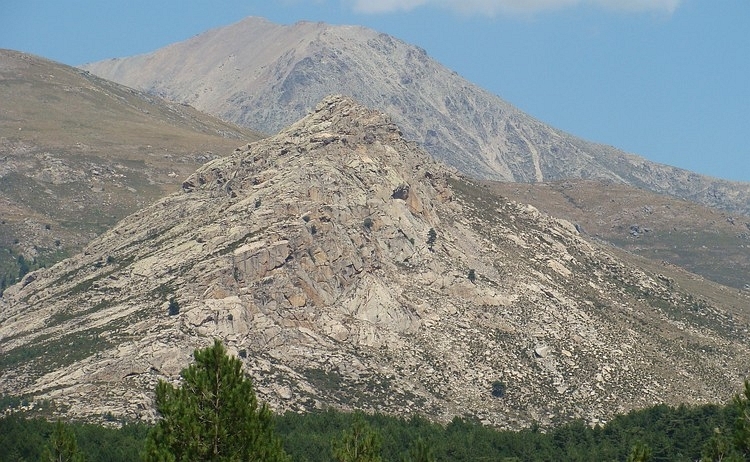 The highest mountain of Corsica is the Monte Cinto, that reaches to 2706 meters altitude. The last kilometres of the climb I cycle through dense forests. A long descent goes in one straight downhill from the pass to the sea. 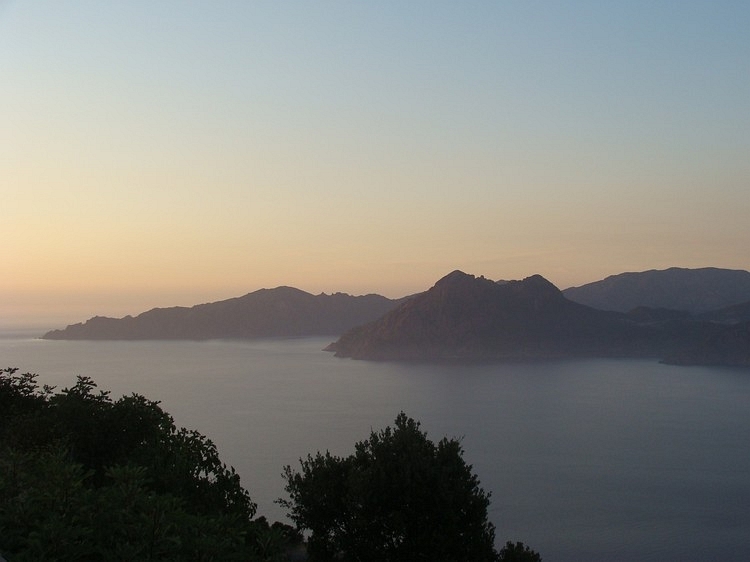 The first kilometres still pass through dense forests but from Evisa down to the sea there are spectacular views. Below, vertically into a few hundred meters deep ravine. Left, where a striking mountain peak points into the ether. Right, where the beautiful village of Ota emerges from a continuously long mountain slope. 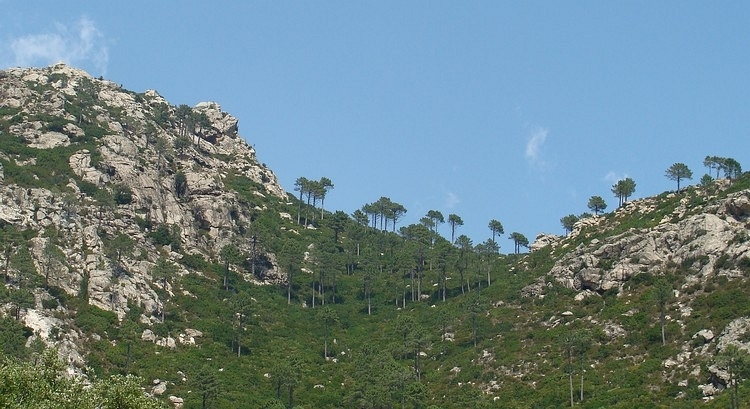 Backward, to the highest mountains of Corsica. And forward, to the sea that lies seven hundred meters below. I reach the sea at Porto, where I can climb again. Between Piana and Porto the spectacular Calanches can be found, red orange rock formations in fantastic shapes, which descend steeply into the sea. The climb to the Calanches is steep. I have to climb more than five hundred meters. What I get in return, is one of the finest coastal sceneries in Europe or perhaps in the world. The altitude difference between the steep rocks above me and the sea steeply below me amounts to more than five hundred to six hundred meters. 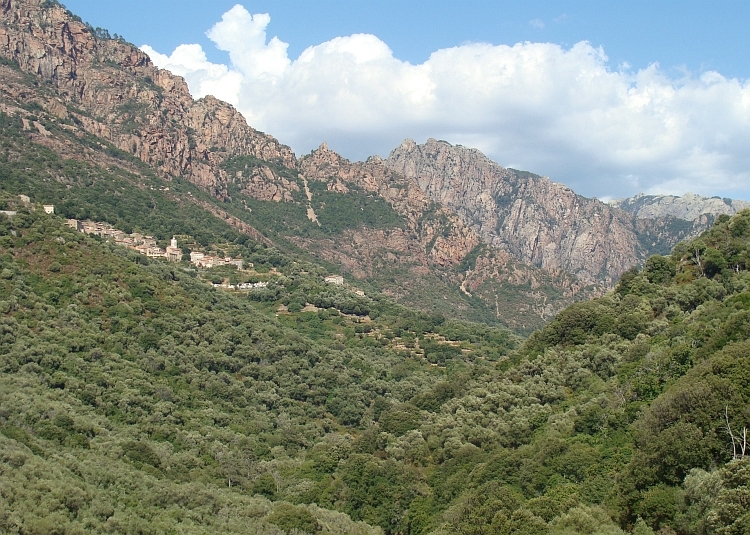 I continue the way to Piana and eventually I reach the scenic village with its grand views over the Calanches. There is a little camping, where I pitch my tent. In the evening I am blessed with one of the best sunsets in all my journeys. 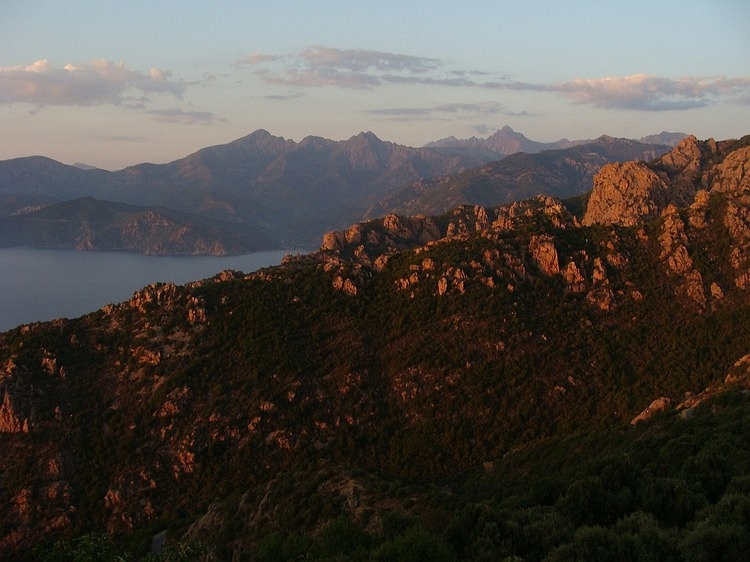 The jagged rock peaks of the Calanches glow in an eternal orange red, the ethereal blue sea is completely still and the mountains of Central Corsica light up mysteriously purple. I cycle back to Porto through the Calanches. I am riding along the coast further north. I pass the unearthly landscape of Scandola, a peninsula of red rocks. Despite the closeness to the sea, all the time I am just climbing and descending. 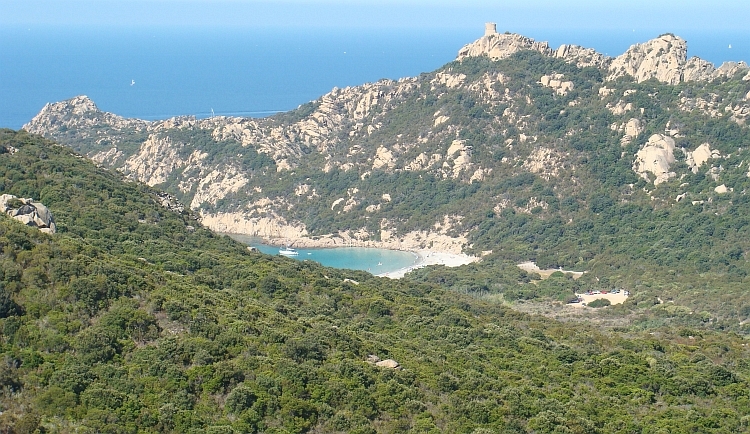 The West Coast of Corsica is one of the wildest shores of Europe. The landscapes of the Calanches and Scandola belong, together with the Cinque Terre (near Genoa) and the southern Lofoten (islands in the North Norway) to the most beautiful coastal sceneries that I have seen on my travels. 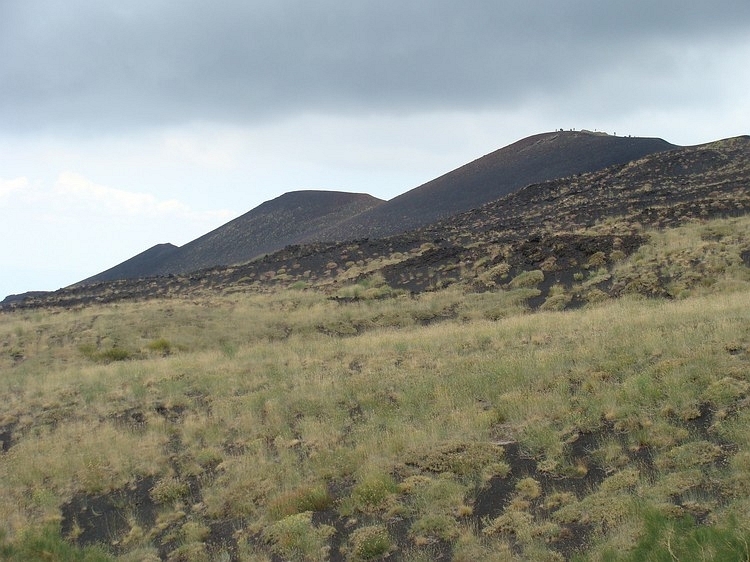 After so much wonderful natural beauty the last days, the landscape north of Scandola a little bit disappointing. They are really beautiful landscapes but just a little less special than the Calanches, the Monte Cinto and the Col de la Vaccia to name but a few examples. I reach Calvi, my final destination in Corsica. I am trying to arrange the crossing to mainland France in Calvi but that proves not to be an easy cause. Half Italy and France are staying on the immensely popular island currently and I am not the only one who wants to go to the mainland. 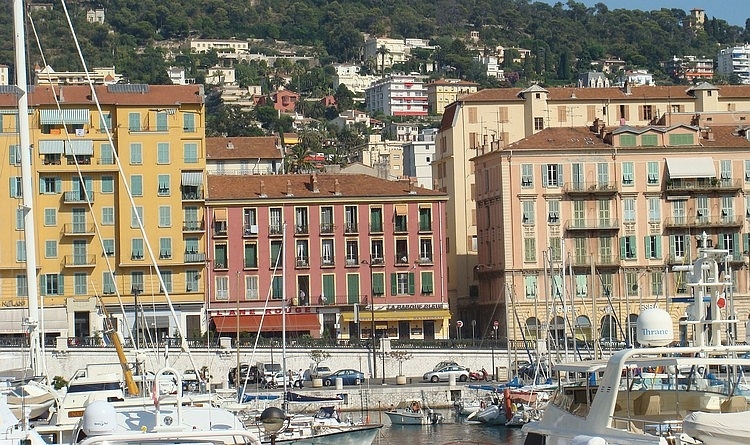 But the day after tomorrow I can take the boat to Nice. I am able to find a camping. Actually there is no space left for another tent but still I manage to pitch my tent. I have to. Not an ideal situation to spend two days like this, but I do not have any choice. 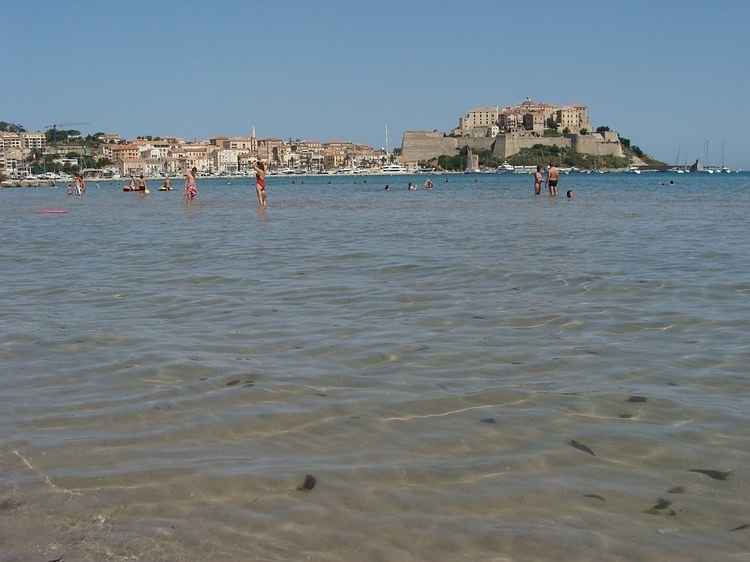 Corsica is extremely popular and Calvi in particular. The beautiful city citadel almost collapses under the swarms of tourists who fill the few narrow shopping streets in massive overloads. Corsica is really a brand, a marketing concept. 'Authentic' Corsican food restaurants are available throughout. The criteria for this authenticity are vague. There is scarcely anything in Calvi that is not being praised as authentic: Corsica Cola, Corsica shampoo, no less than three brands of authentic Corsican beer. With all this authenticity around me, I ask myself desperately, how my own authenticity could be judged. After a thought or two I feel reassured. The Lonely Cyclist is 101% authentic. More than a 100 % authentic. The ferry arrives at half past four in Nice. Over the Promenade des Anglais, the great boulevard, I cycle out of Nice, and I continue over the broad road to Cagnes sur Mer. From there inland to the camping of Vence. 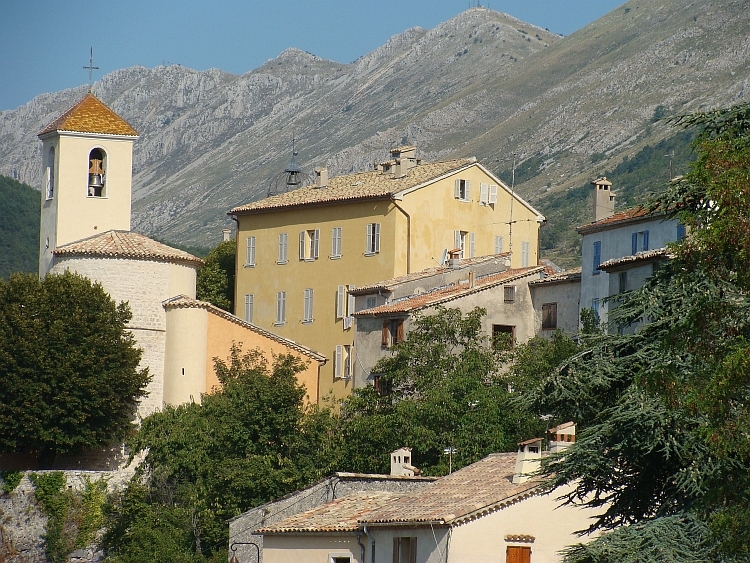 North of Vence the mountains of the Alpes Maritimes start. I start the day by cycling up to the Col de Vence, a famous col of the annual Paris - Nice ride. The bare, weathered mountains around me suggest that I am in high mountain areas but a simple glance back gives views of the sea. The climb is a popular one. Sometimes I am caught up by racing cyclists. The climb to the Col de Vence is pretty even and I am on the pass before I actually realize. From here the road remains on more or less the same elevation. The road turns around a mountain ridge and I have great views on the bare mountains of the Jérusalem and the Cime du Cheiron, mountains of nearly 1800 meters altitude. The view of the mountains and the village of Coursegoules is pretty fantastic. It is a remarkably rugged mountainous landscape in which I find myself now. These surprises are the pleasant surprises of a cycling journey like this. I visit the village of Coursegoules. 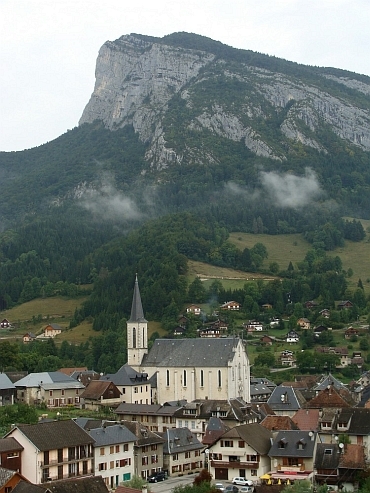 I pass the pretty village of Bézaudun-les-Alpes.I find myself in a stunning green landscape. I am still at about 1000 meters and far below me lies the valley of the Esteron. Behind the valley at least four rows of mountain chains are visible. Each chain is higher than the chain before. The farthest mountain ridges are the mountains of the Parc National du Mercantour, mountains of up to 3000 meter elevation. The road follows the course of the Esteron and remains far above the valley for a long time. For at least an hour I experience the great balkony views over a sea of green hills and mountains and valleys. Then the road sinks towards the village Roquestéron. Now I have lost altitude and I have to climb back into the mountains. Again I climb high above the valley through the intensely green landscape. 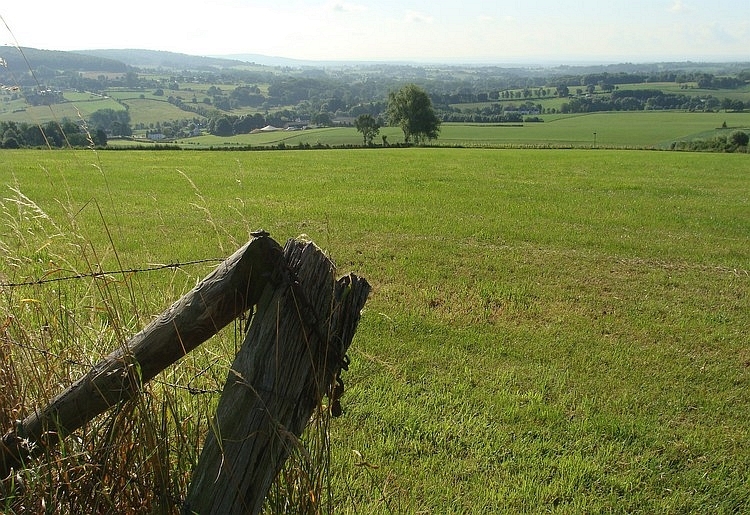 Coming from the south, the landscapes tend to get fresher and greener every day. Beyond the village of Sigale I pass a narrow rock crevice and abruptly I am on a bare, weathered plateau. 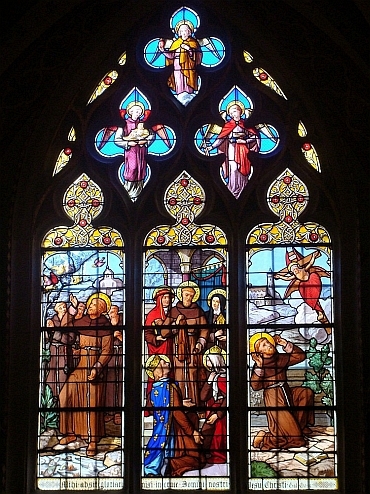 I cross the plains and climb over the Col The St Raphaël. During the descent into the valley of the Var I find myself in an exuberantly green landscape again. 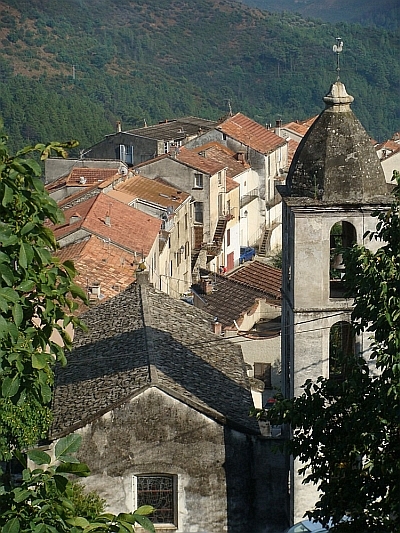 I follow the valley of the Var to the west and pass the beautiful medieval town of Entrevaux. As I walk through the old streets, I see a front of a towering cumulus clouds coming from the north. I know that there will be no escape. 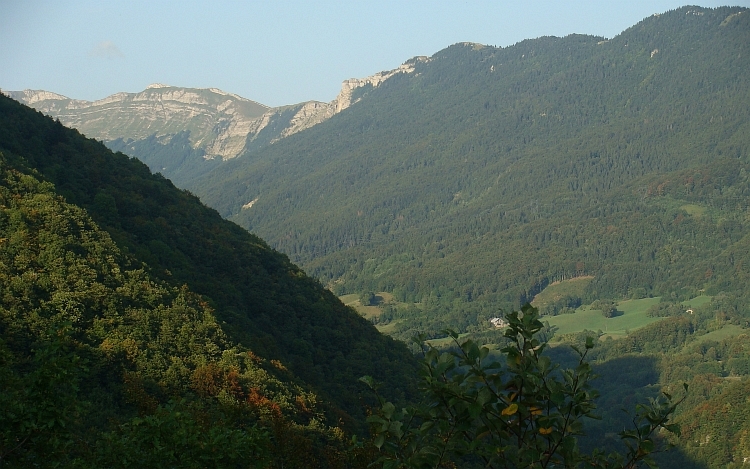 It is fifteen kilometres to the first camping in Annot from here. I take my bike and cycle as hard as I can. The sky is black and the mountains in the north are constantly bombarded with lightning strikes. I am riding at the top of my velocity continuously. Just before Annot the sky breaks open and huge water masses are being poured down over the Earth. I am hiding close to the Syndicat d'Initiative and ask where the camping is. It is only one kilometre from here. I take a sprint to the camping and pitch my tent in five minutes. The rest of the afternoon I hide in the guest room of the camping, where camping guests walk in and out. There are many sport climbers in the camp, they have northing to do either now. At six o'clock the front has passed and it is clearing up now. 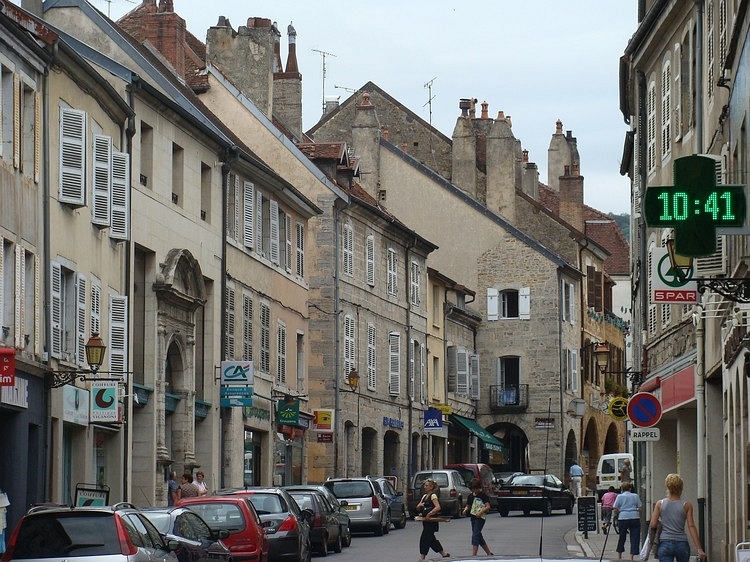 I visit the cozy little town of Annot and buy stuff to cook. The bad weather is definitely over now. As I will be cycling in the high mountains tomorrow, the weather will probably be good again. 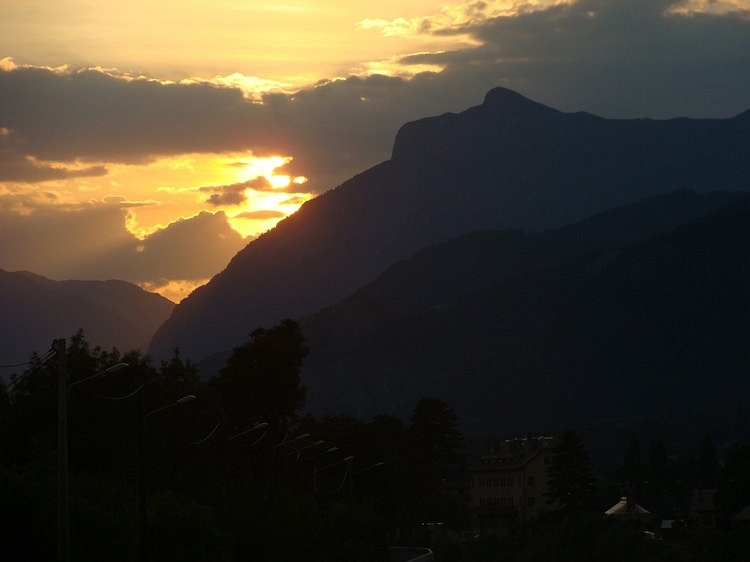 It is my intention today to ride to Barcelonnette today. 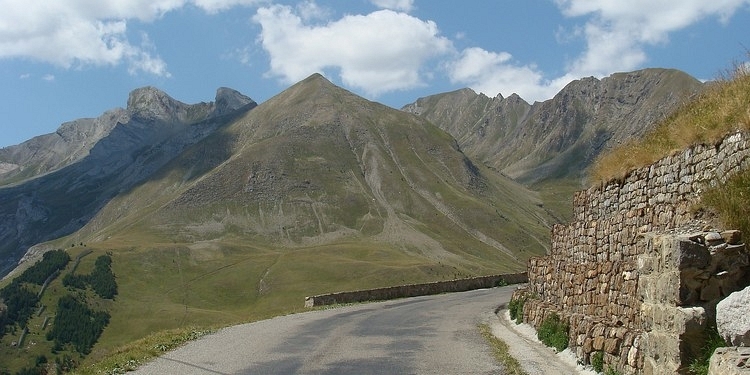 There are two passes that need to be crossed: the Col de la Colle St Michel and the Col d'Allos. The climb to the Col de la Colle St Michel goes up evenly, like most climbs in France. Usually the climbs in France are much easier than climbs of comparable altitude difference in Italy. 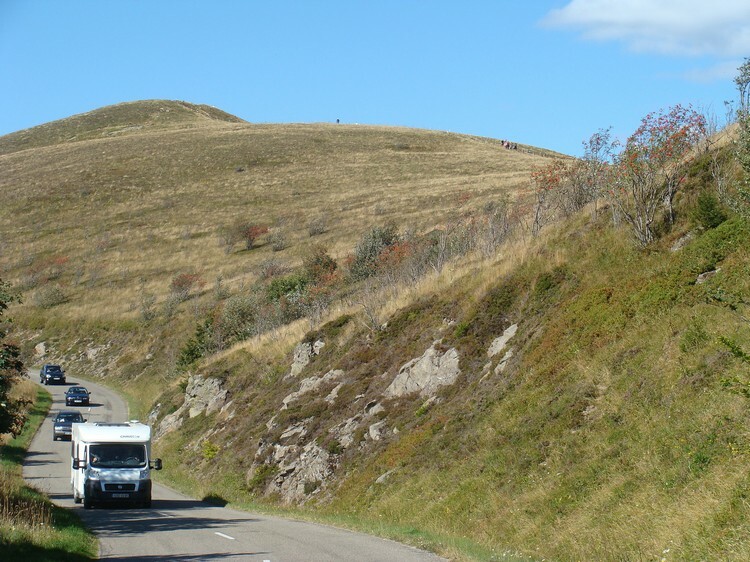 The climbs are never steeper than 13 or 14% in France and usually the climbs are regular. That applies even to the highest passes of the French Alps. After three weeks of cycling on the steep, uneven pathways of Italy under hot conditions, the roads in France are smooth and never too steep. Especially since the temperatures are pleasant here. Not too hot, not too cold. Today the sun is shines abundantly. 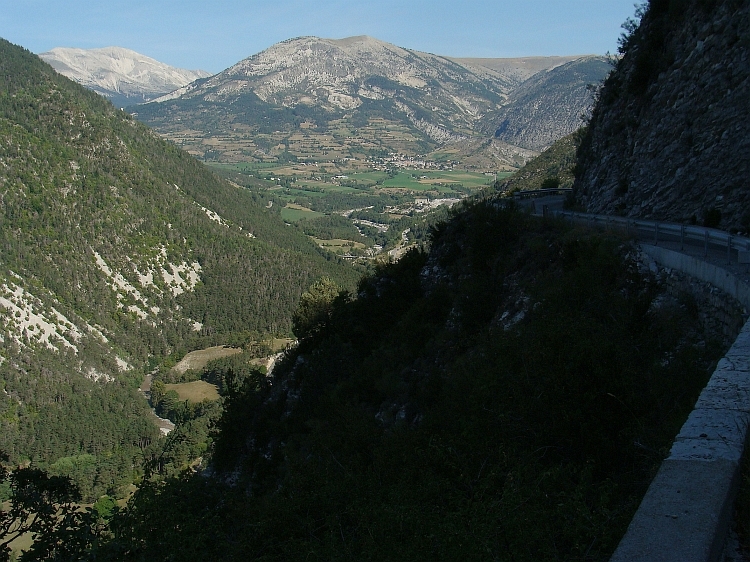 After the climb to the Col de la Colle St Michel I descend to the valley of the Verdon. I pass some beautiful towns like Beauvezer and Colmars before I reach Allos. Here starts the climb to the Col d'Allos. 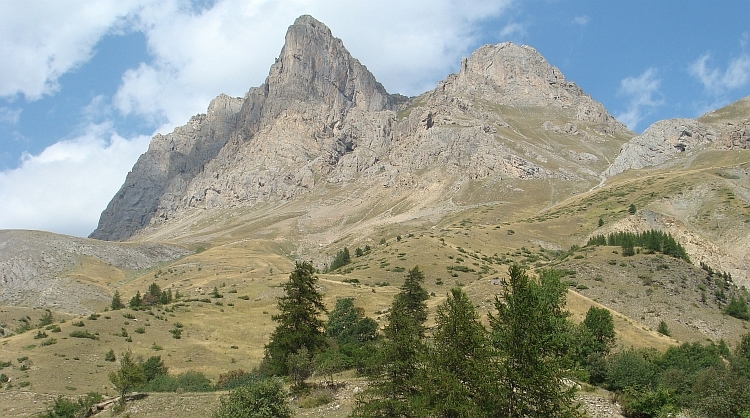 I pass the unattractive ski resort of La Foux d'Allos and climb above the tree line. Not much later I am on the pass. 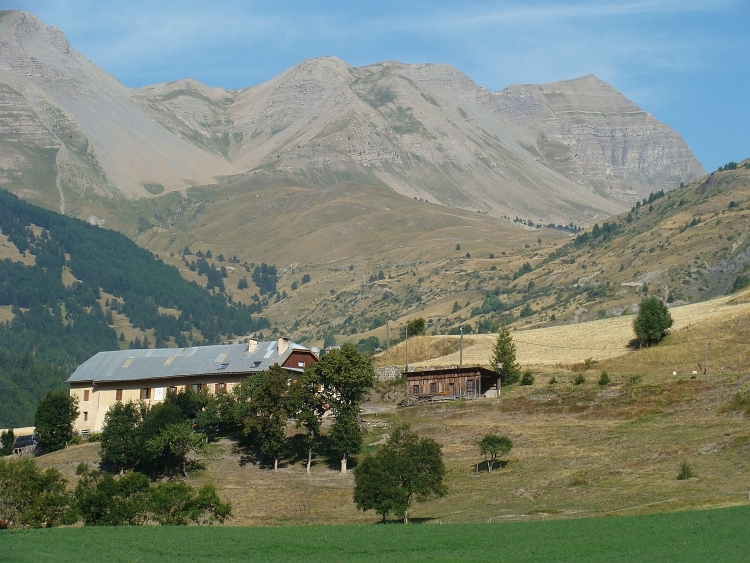 The descent to Barcelonnette is steep and tricky, on a narrow road with blind corners and occasional steep precipices. It is still early in the afternoon as I reach Barcelonnette. Here I find a campsite. There is not much use in continuing today; I will stay here. 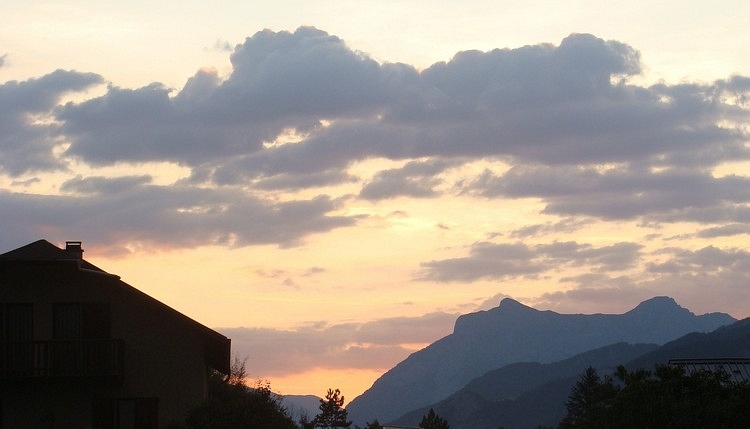 My friends Jeroen and Willem are staying at the campsite of Bourg d'Oisans. We will spend a few days together. The plan is that I will join my buddies today or tomorrow. 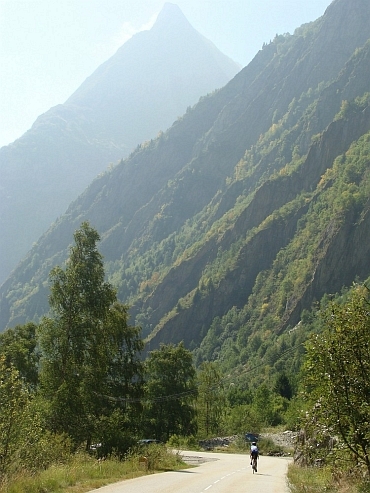 I doubt whether I will do an attempt to cover the distance to Bourg d'Oisans in one or in two days. 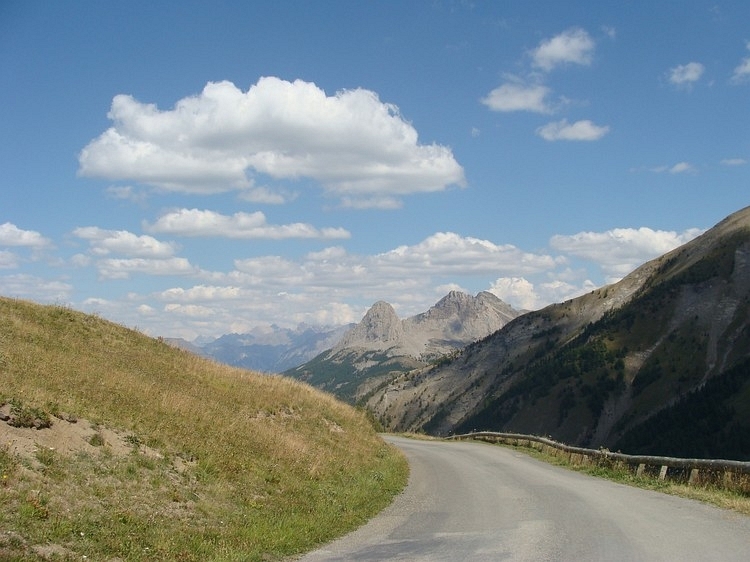 There are two passes between Barcelonnette and Bourg d'Oisans: the Col de Vars and the Col du Lautaret, both are a bit higher than two thousand meters. Besides the altimeters there are also horizontal kilometres to be covered, probably between 150 and 160 kilometres. I will not decide, we will see what happens. After a long flat ride over Jausiers and St Paul I climb to the Col de Vars, a surprisingly beautiful ascent. Not as beautiful as the nearby, extremely challenging and much higher Col du Parpaillon, but very beautiful nonetheless. The climb is surprisingly light. 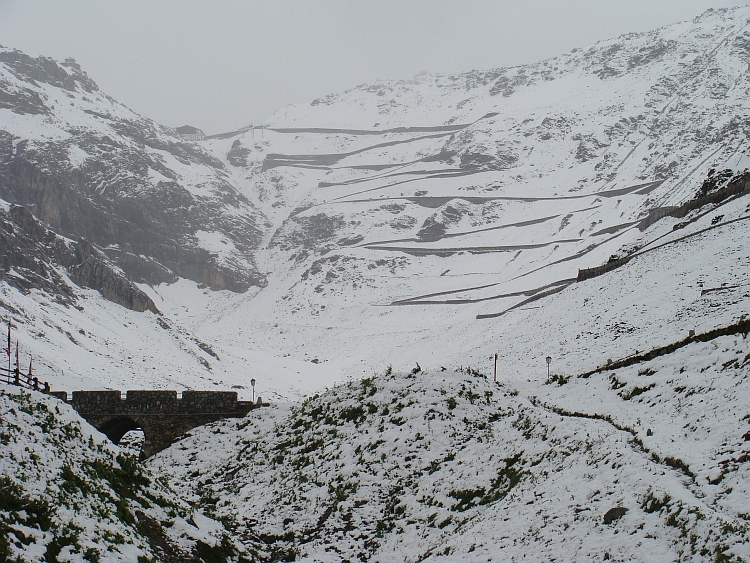 I reach the pass and descend to Guillestre, passing some concrete dominated ski villages. 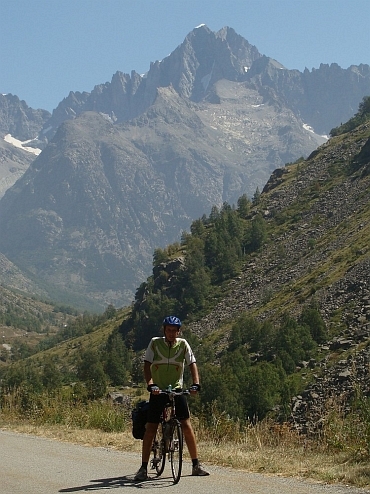 Aesthetically more inspiring are the views over the Ecrins massif with mountains up to four thousand meters altitude. 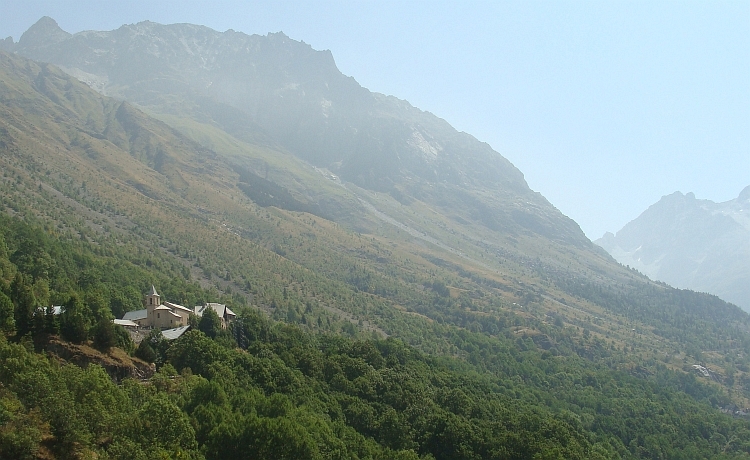 I reach Guillestre and the wide valley of the Durance. 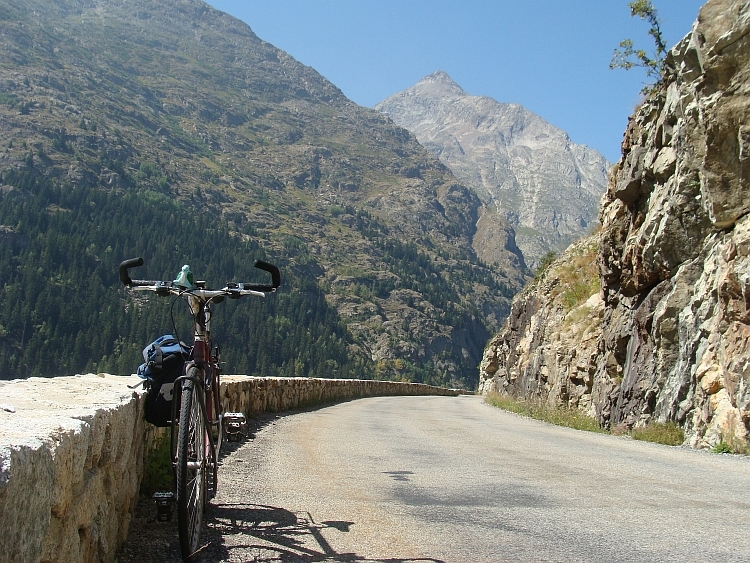 On the provincial road, the N94, I am riding in the direction of Briançon. I do not have any views of the Ecrins massif anymore, the flanks of the valley are blocking the views effectively. The road to Briançon climbs and descends all the time, a small disappointment as I expected a flat road through the valley. But I have am lucky to have a strong tail wind. After Briançon the road bends further and further to the west however and more and more I have to face the strong wind. The last few kilometres to the pass I have straight head wind. After more than one hundred twenty kilometres cycling, I am getting tired. In addition, I suffer from a persistent cough. I experience that cycling long distances with a hard wind enhances the development of the cold. On the descent of the Lautaret, where I am riding sixty kilometres per hour through the head wind, I feel like being completely blown through. It is already half past five and it is starting to get a bit cold. In La Grave, I have wonderful views of the Meije, one of the most spectacular mountains of the Alps with its steep dark cliffs and hanging glaciers. Beyond La Grave the road follows a narrow gorge with huge rock walls to the left and to the right, with long cascades that splunges several hundred meter down below on the rocks. 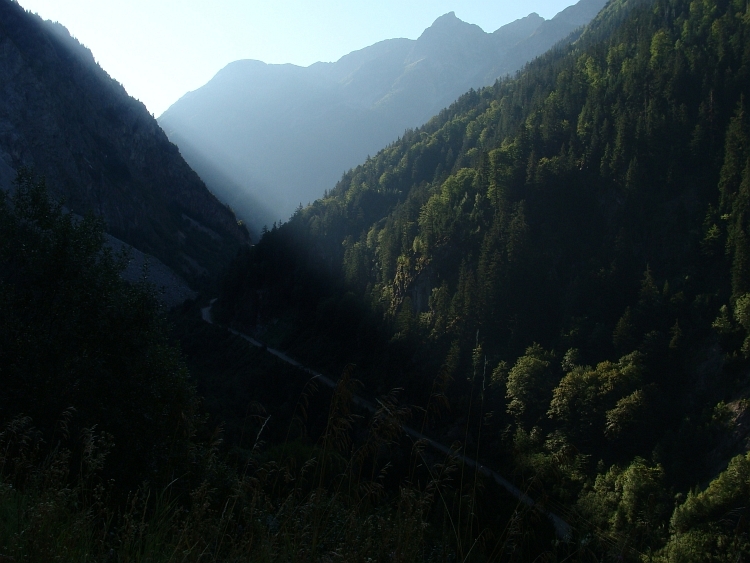 The descent is long and beautiful; suddenly I reach the wide valley of Bourg d'Oisans. A few flat kilometres away, I reach the campsite. Willem and Jeroen have already preparde the meal. The whole night it had rained cats and dogs but when we get up, it is dry. The mountains are still wrapped up in clouds but the prevailing wind clears the clouds efficiently. 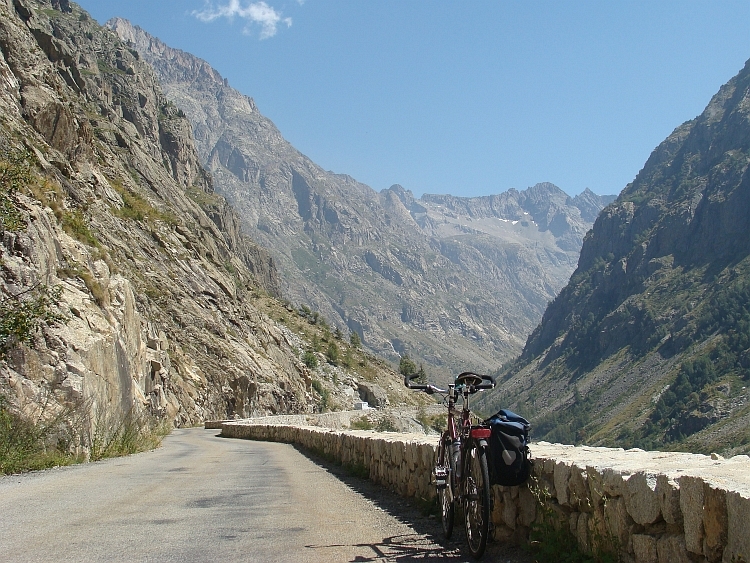 Today we want to cycle to the village of La Bérarde, high in the mountains of the Ecrins massif. Willem and Jeroen have a road bike, I am riding on my heavy trekking bike. I have a bike with panniers so I carry our rain gear. You never know in the high mountains. Within a short time however the clouds are being washed away. The mountains on either side of the valley reach dazzling heights. The views are supreme. There is not a single cloud in the sky as we reach La Bérarde. We take rest for more than an hour to enjoy the beautiful views and we are having lunch in the meantime. Then we cycle back to Bourg d'Oisans. In the descent, I have many problems because of my cold. I have sneeze attacks all the time that will not get away and I feel weak and sick. 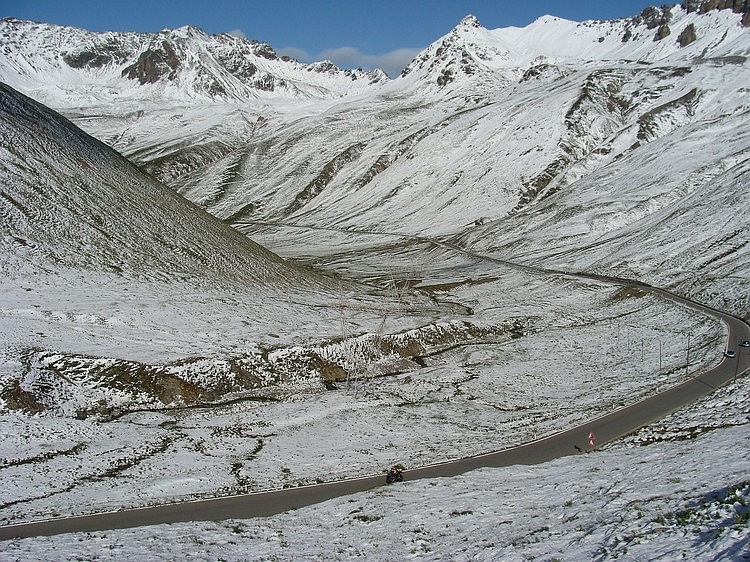 I am a bit worried as we have planned to cycle the Marmotte tomorrow, the famous road cycling circuit with four big alpine cols: the Col du Glandon / Croix de Fer, the Télégraphe, the Galibier and the Alpe d'Huez. If everything goes well. I wake up bathing in sweat. Apparently I have had a mild fever. That seems be over now. I feel better than yesterday anyway, although I have a runny nose constantly and lengthy sneezing attacks. 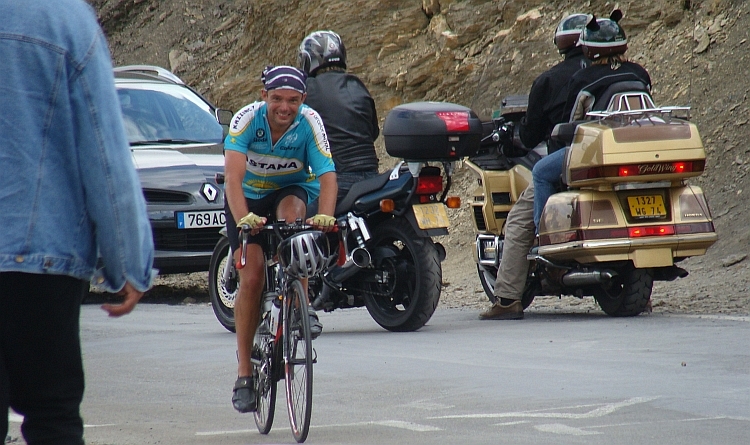 The Marmotte is something of a must-do among sports cyclists, particularly among the climbers in the cycling world. A total of five thousand altitude meters must be overcome. I decide to go along with the men, despite my unstable health. I will after all not every day an opportunity for the Marmotte cycling but I realize that it will be difficult. While cycling around with twenty kilograms less than on a cycling journey day, I have still got a heavy bike with panniers plus wind jackets and a few chocolate bars and so my bicycle will weigh probably ten kilograms heavier than my friends' road bikes. And it is still a question how my cold will develop. On the climb to the Col du Glandon do I am not in a hurry. As we ascend, the day awakes and the sun throws the first rays over the surrounding mountain peaks. If we reach the lake, we are riding in the sunshine for the first time. The water in the lake is ripple-free, the mountains are magically reflected ar the water surface. I take some pictures as Willem and Jeroen are cycling before me. I do not know whether the men will be waiting for me at the top of the Glandon or the Croix de Fer. Since the Glandon is located right above me now, I take a look there first. Nobody there. 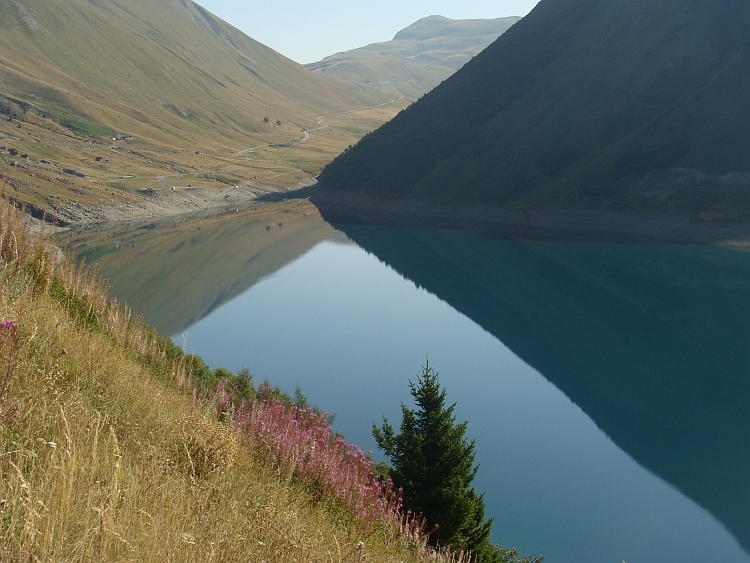 Quickly I terurn to the road and to the Croix de Fer. Not much later I reach the pass and together we descend to Saint Jean de Maurienne. My cold gets another big boost during the long descent with a lot of sneezing again. I have quite a problem on the winding descent with numerous cracks in the road. An uncontrolled sneeze in a corner can be dangerous. I try to avoid sneezing in a switchback but that means that I can only descend with old wives' speed. I also suffer from an ear, where the pressure builds up during ascents as well as during descents. Do I have an ear infection? I have no idea. As fast as I can but still very slow, I go down. And again, the men have to wait a long time for me. 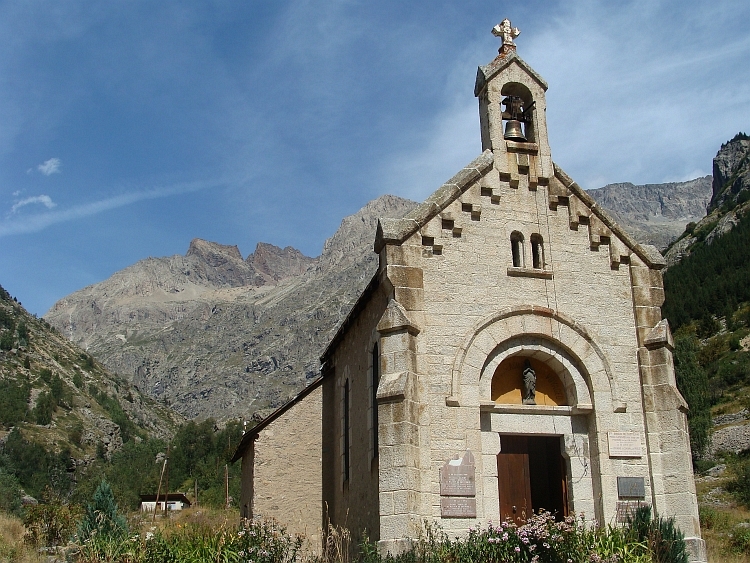 I see that I have to earn some goodwill and on the comparatively flat part to St Michel de Maurienne I am cycling ahead a lot of time. I must pay for that during the climb to the Télégraphe, where the two men immediately take off. During the whole climb I donot have the two men in sight. Moreover, I feel weak and sick. It still goes, but this is taking a high toll. I give everything so that Jeroen and Willem do not have to wait too long. 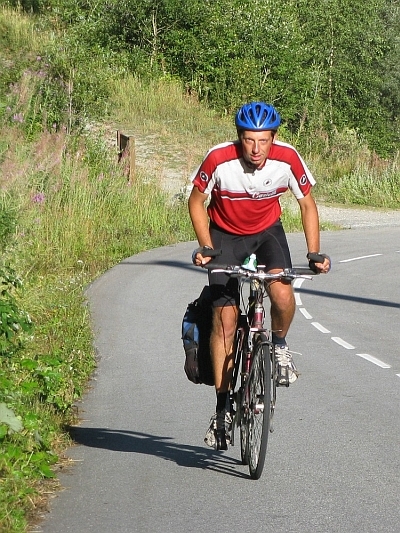 The result is that I am dead tired when I reach the pass, while Willem and Jeroen have had a good rest. To my surprise, the Galibier is going quite well. We reach the top almost at the same time. A long descent brings us back to Bourg d'Oisans. Through an unfortunate incident at a crossing I am one hundred meters behind Willem and Jeroen. Because they are able to sit deep on their road bikes while I am sitting in an upright position, I catch more wind and it proves to be impossible for me to ride back to them with this strong head wind. As they take over and help each other, I have to fight my own struggle thirty kilometres against the wind. Then finally my chance comes. On a small climb in the downhill, I take a sprint and right at the top I am able to catch up. But the damage is already done. I have made a major effort during the descent while not a hundred per cent healthy. The first meters of the climb to the Alpe d'Huez are brutal. What I have never experienced, is happening right now. My legs do not obey and I am practically without speed. My legs are completely acidiced. Howeber slow I am, it takes alot of effort to just go on. I sweat like an otter, although it is not that hot anymore. Again Willem and Jeroen have left me on the first meters of the climb. To make matters worse, I have lost my water supplies because the water bottle was not closed properly. One liter of water splunged useless against the asphalt. I have less than half a liter of water to reach the Alpe d'Huez. And I am already thirsty and moreover I am not particularly free of sweat. Now I cycle up as slowly as possible to prevent excessive sweating. And of course, because I am too tired. But as things really look bad, luck is on my side. The sun disappears behind the mountains. My sweat stops and amazingly the thirst is released a bit. And, strange enough, the acidification of my legs seems to be released a bit. I am going quite well now. It is not so far anymore. I see that Jeroen is not so much in advance. Then, finally, I reach the Alpe. Willem and Jeroen are waiting for me. It is cold now. I take our coats out of my panniers. So in the end I did not carry my panniers for nothing! We drop down to Bourg d'Oisans. Mission accomplished. About the way that I suceeded, I have some question marks. But still I am glad that I have achieved it, despite the difficult circumstances. After a rest day I will travel back again to the Netherlands today. Willem and Jeroen accompany me on the first kilometres. 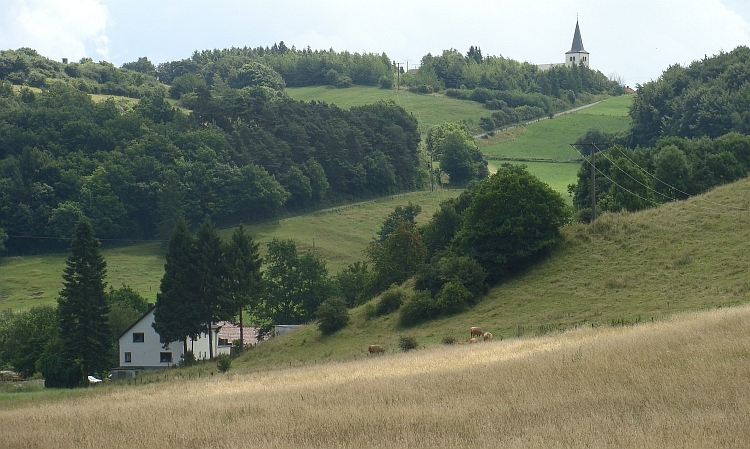 Through the valley of the Romanche we descend to the village Séchilienne. Here we say goodbye. 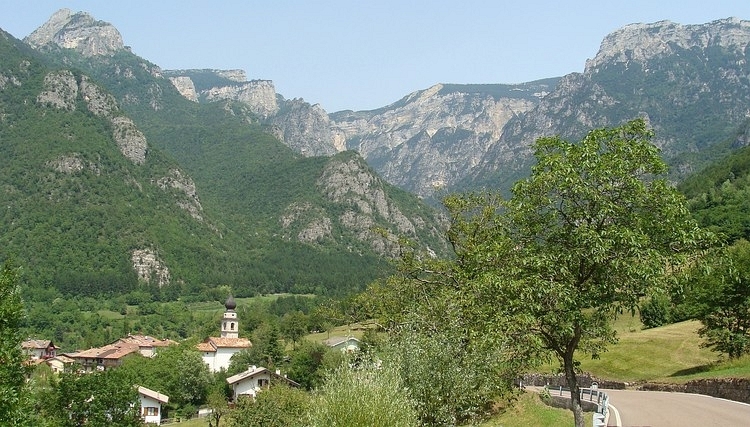 Willem and Jeroen will make a circle and return to Bourg d'Oisans, I will cycle to Grenoble and subsequently enter the mountain massif of the Chartreuse. 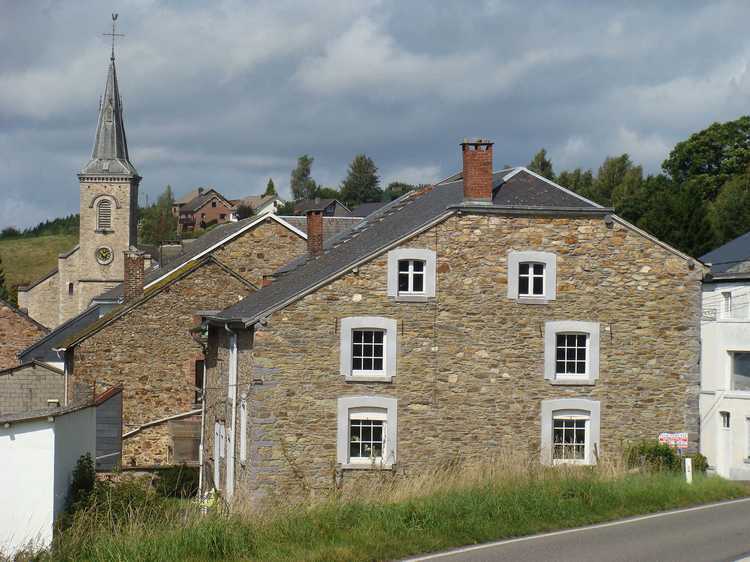 The road through the Valley of the Romanche is too crowded for me and I leave the main road in Vizille. After a small climb I descend into the city of Grenoble. Bad weather is coming in from the west. 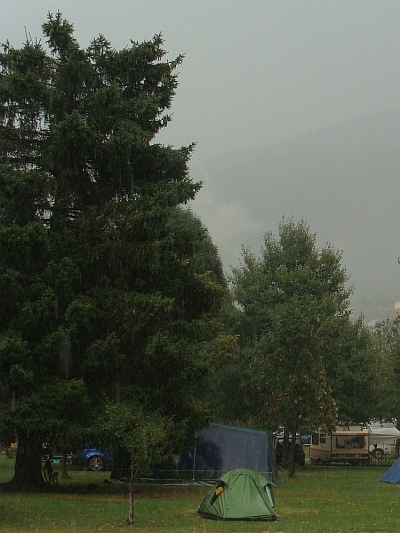 It is raining already in the mountains of the Chartreuse and Vercors, on the other side of the broad valley. The Chartreuse is a small area. 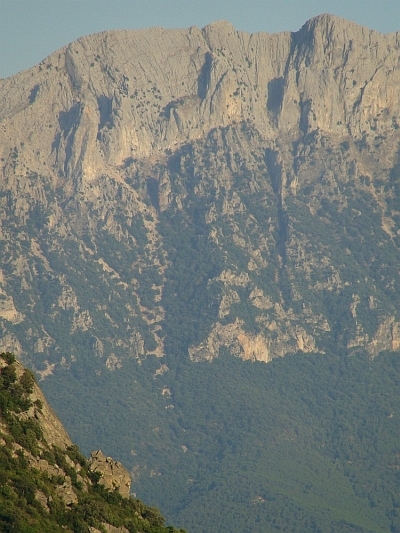 The mountains are not nearly as high as for example the mountains of the Ecrins. The highest mountains are slightly higher than two thousand meters. However, the area with its impressive limestone cliffs has a very nice atmosphere, even as the weather is bad now. All night it had been raining heavily but the showers have just passed away. Mist clouds are clinging to the mountains. It is beautiful how the gray limestone cliffs risw above the mist clouds. 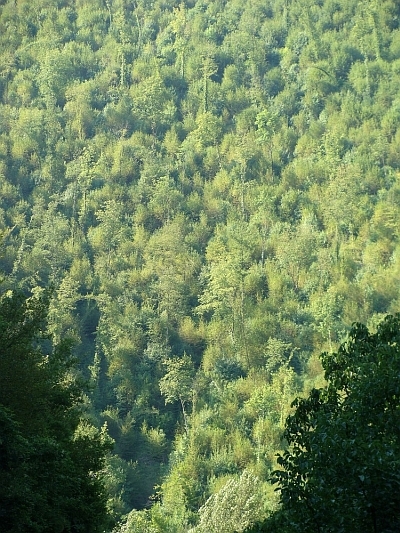 The forests on the flanks are lush and green, obviously it is raining frequently in these areas. I am traveling northward across the Col du Cucheron and the Col du Granier. 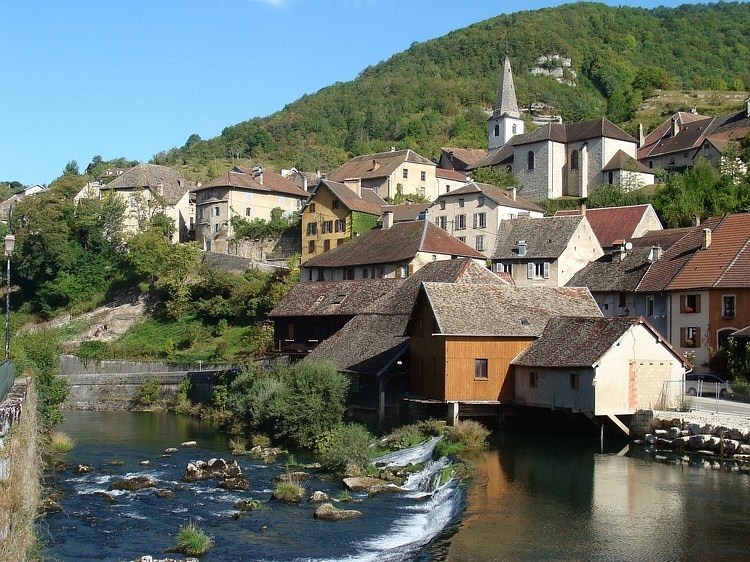 St Pierre d'Entremont is the nicest village that I am experiencing in the Chartreuse region but in fact all the villages are nice. After the Col du Granier begins the descent out of the area. I descend almost a thousand meters and I arrive in Chambéry. I have left the mountains for good now. Chambéry is a surprisingly nice town with a beautiful old center. From Chambéry to Aix-les-Bains I am riding raods that are too busy, too wide. I cannot find a nice route. After Aix-les-Bains I am traveling on a quiet road along the Lac du Bourget, a thirty kilometres long, between the foothills of the Alps. A striking sight are the cozy autumn colors that can be seen on the flanks of the mountains. It is late August, a bit early for autumn leaves, probably the drought of the last two months has caused this phenomenon. For the nature it is good that so much rain has fallen yesterday. I travel on through flat and hilly terrains. In Seyssel I cross the Rhône river and climb to a river terrace. 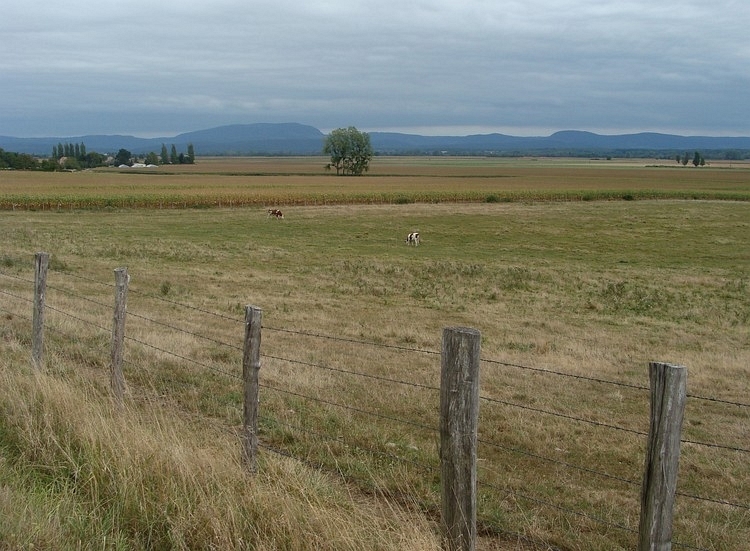 I cycle over the flat terrace towards the Jura. In the village of Billiat I meet a veteran cyclist who accompanies me. It is already late but it is beautiful now with the evening sun. Together we climb the first ascent in the Jura. My buddy leaves me in the camping of Chézéry-Forens. It is already after 8 o'clock. 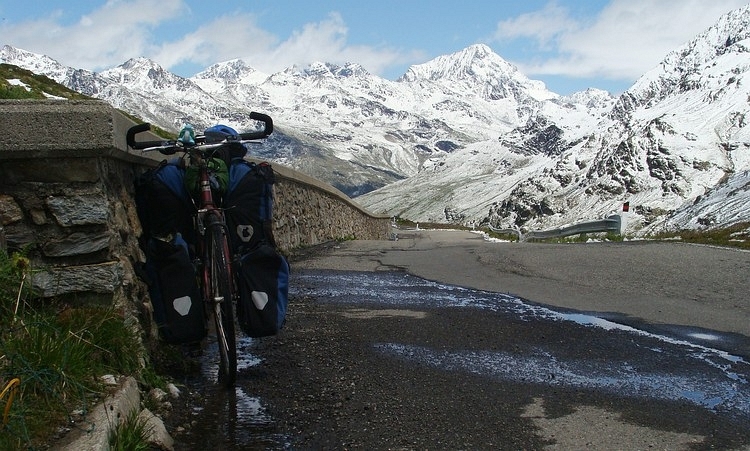 My cycling mate will return to his home in the Rhône valley, while I am putting my tent. I am nearly alone at the camping. It is clear now that the season really is over. After next weekend, the first camps will already close. Beacuse I expect closure of campings and facilities soon, I prefer to bike long distances to avoid being stuck. It will be ever lonelier from now on, whatsoever, now that the holiday season is over. Another reason to ride long distances is to take advantage of the good weather, autumn can arrive any time now. I intend to make a few detours in the Jura, especially if the weather remains as good as it is now. I am on my way early. I am riding to the north and slowly the nature is awakening. It is a lovely morning. The plants are covered with dew and the sun casts a brilliant light on the mysterious nature. It is very quiet on the mountain roads. I am all alone. There are no more tourists in this part of France. After a long but easy ascent, I reach the plateau landscape of Haut-Jura. Vast plains are occasionally interrupted by long, sloping ridges. Beyond Les Rousses I want to take a back road across one of the ridges. I choose the tiniest road possible. There is no traffic and after a short, steep ascent I end up in a maze of lanes in a dense forest. At random I cycle through the forest, hoping that I will get out. After an hour I am relieved as I find out that I have cycled in the right direction. 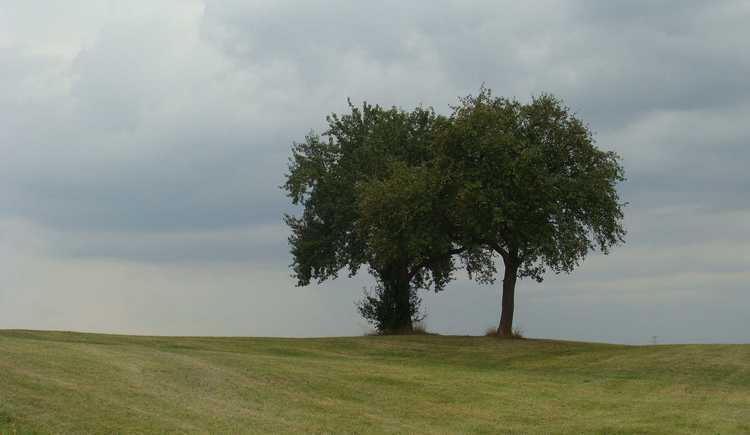 I leave the forest and I am in a big open grassy plain near Chapelle des Bois. I cross another ridge and again I choose the smallest path possible. 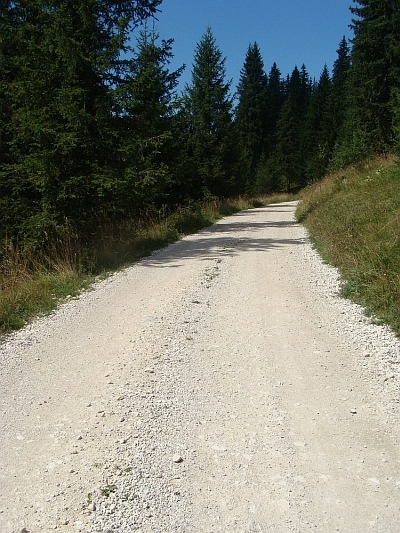 This time the road becomes unpaved after a few kilometres. The dirt road begins to fork in the middle of the woods and the branch that I choose, forks again. There are no directions indicated. I wished that I had chosen a normal route. After another fork a few kilometre further I finally see a sign. It tells me that I am on the wrong path now. I have to turn back and now things turn out well. I arrive in Foncine le Bas, as planned. I cycle through a landscape that is a little boring. 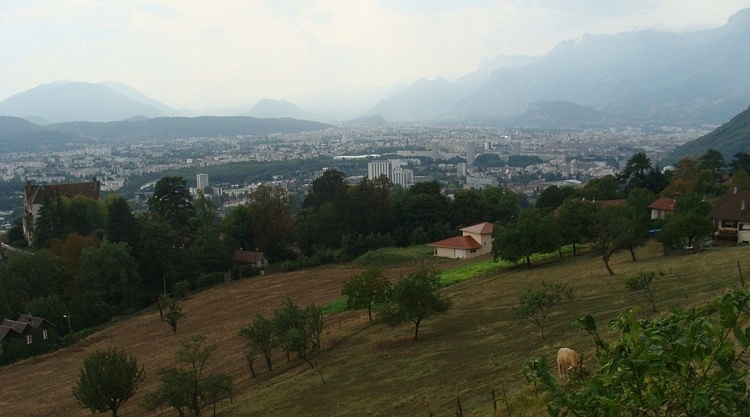 I am going towards the Pic de l'Aigle and the Cascades du Hérisson. 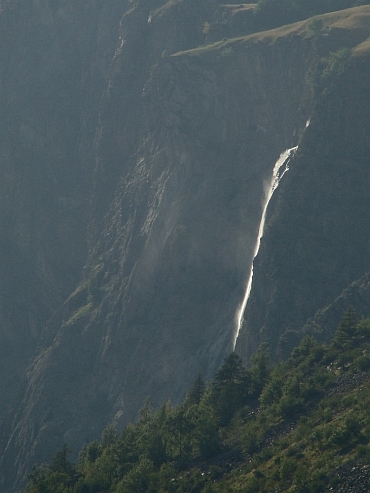 Despite it is not the right direction (not to the north, towards the Netherlands), something tells me that this mountain and these waterfalls will be very beautiful. I have messed up the route a few times today by choosing obscure roads nad it almost went wrong a couple of times. But I am a stubborn man sometimes. Once again I choose an uncertain route. 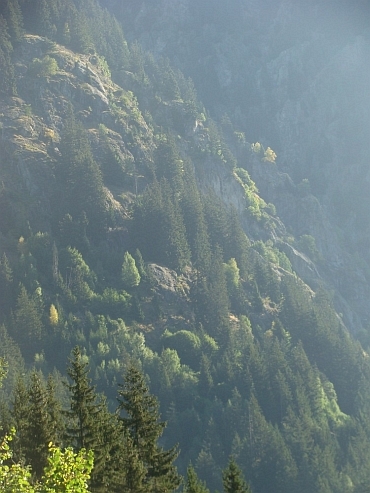 I want to reach the Pic de l'Aigle by following another trail through the woods. The road is worsening every kilomter. After a few kilometres, the road is unpaved road and after a few more kilometres the road is really very bad, after a few kilometres more the road forks in four branches and after a few kilometres after the first fork there is a second fork. After a few kilometres the way is half way overgrown by bushes and after a few more kilometres, I am standing before a forbidden access sign. I have to cycle back to the last fork. Here I try a new branch, but again I get stuck. I decide to take one last chance. If I fail again, I willhave to accept the return journey. Against all expectations, I manage to find a way out. I reach a paved road and I am back in the civilized world. A few kilometre further is the Pic de l'Aigle. To be honest, the Pic de l'Aigle experience is not too special. My intuition was mistaken for once. Then the waterfalls. I leave my bike in a large tourist center and I descend in fifteen minutes till one of the waterfalls. It shows a thin, trickling stream that falls down ten meters. This is certainly not a once in a lifetime experience. The next series of waterfalls is half an hour walking, tells the sign. I have had a bit too much trouble today for not the Pic de l'Aigle and for the first cascade. I will not try the second, third and fourth cascade no more. 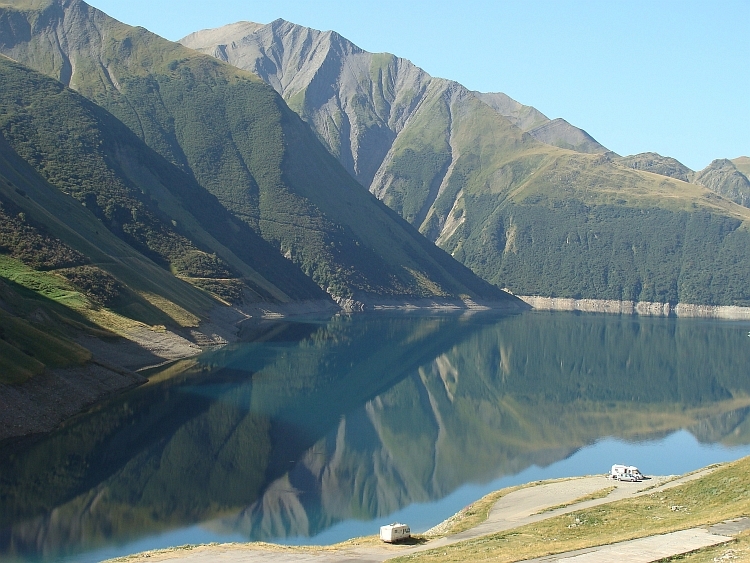 I climb back to my bike and descend to the Lac de Chalain, where I find a campsite. 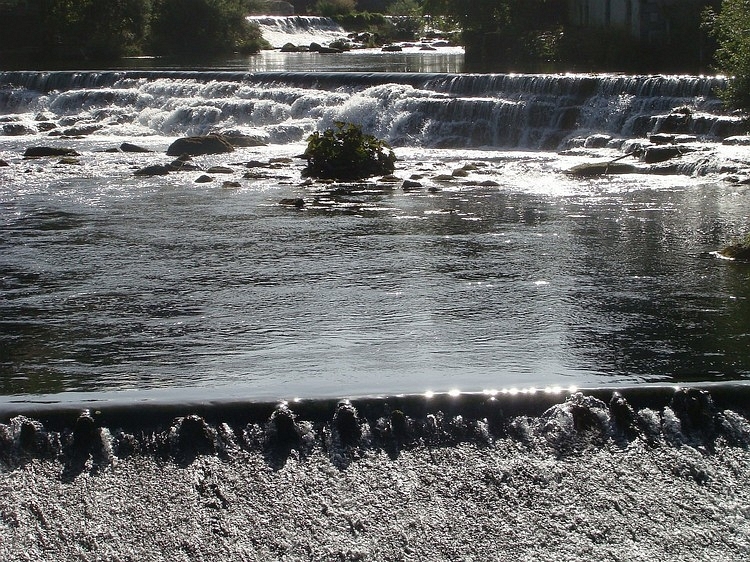 On the internet I see that the Cascades du Hérisson certainly owe some beautiful waterfalls. I apparently took a chance on the wrong waterfall. Today my male intuition must have had a complete blackout. It is a gray day. It does not rain and probably it will not rain the whole day, or maybe a drizzle. I decide on a cultural programme today. 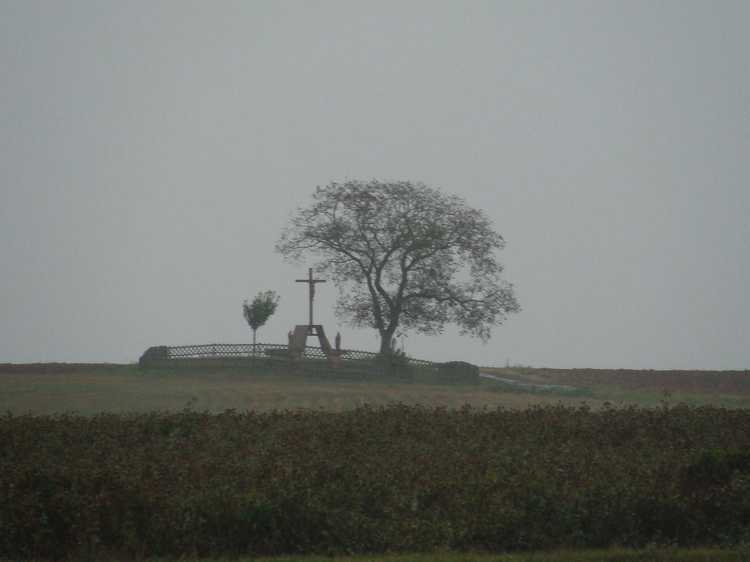 I am riding over relatively flat terrain to the small toen of Arbois. A few kilometre before the town there I am standing on the cliff of the Cirque du Fer de Cheval, with beautiful views over the valley below. I descend into the valley and reach the pretty town of Arbois. After some sightseeing I am riding on to the west. 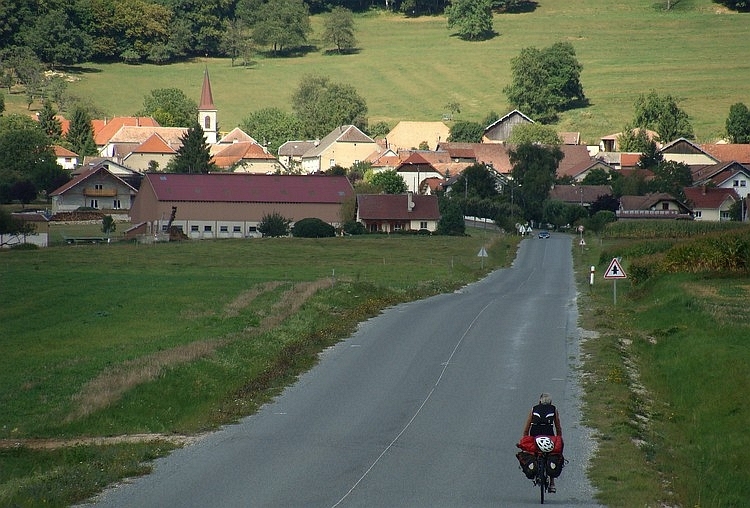 I have left the Jura behind me now and I am cycling through nearly flat areas to Dôle, which is surely one of the most beautiful little towns of France. 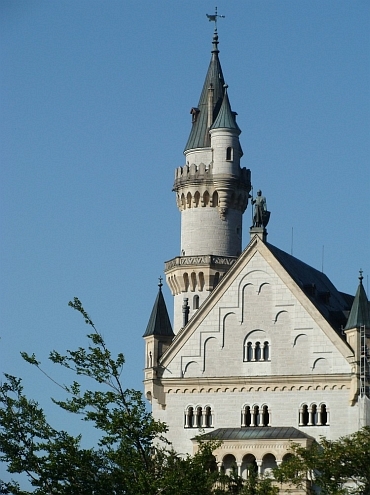 The location along the Doubs is fantastic, the major houses of gray stone are scenic and wonderful and the massive cathedral is of tremendous beauty, especially the extraordinary stained glass windows. 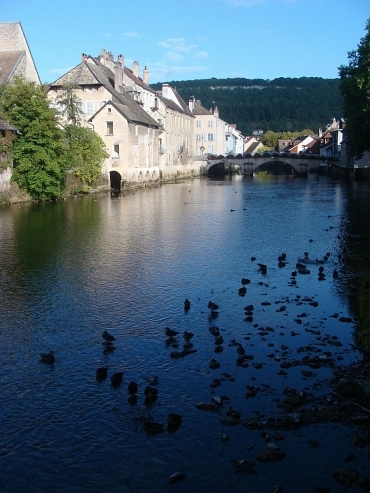 I stay in Dôle for two hours before I return to ride eastwards, back to the hills of the Jura. The first thirty to forty kilometres are still flat. I see the Jura looming in the distance like a mountain ridge. Then I reach the hills and there is a little climbing involved. It is almost 7 o'clock as I reach the camping of Ornans. Ornans is a very pretty little town too, but I will save that for tomorrow. 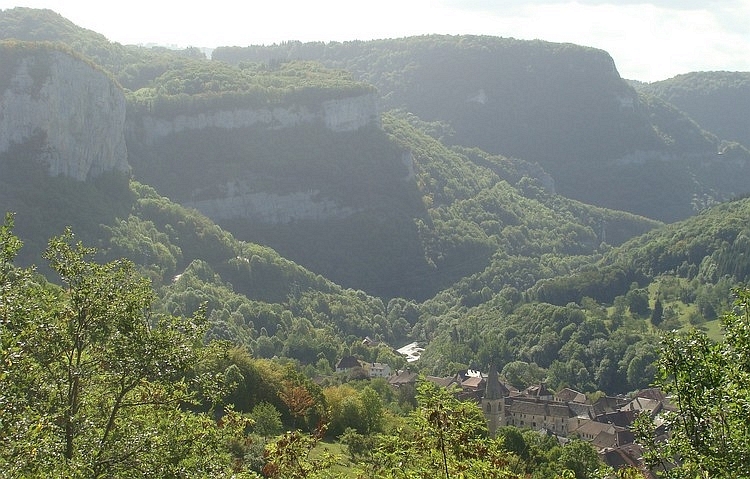 The Valley of the Loue is one of the most beautiful parts of the Jura and perhaps one of the most beautiful parts of the whole of France. 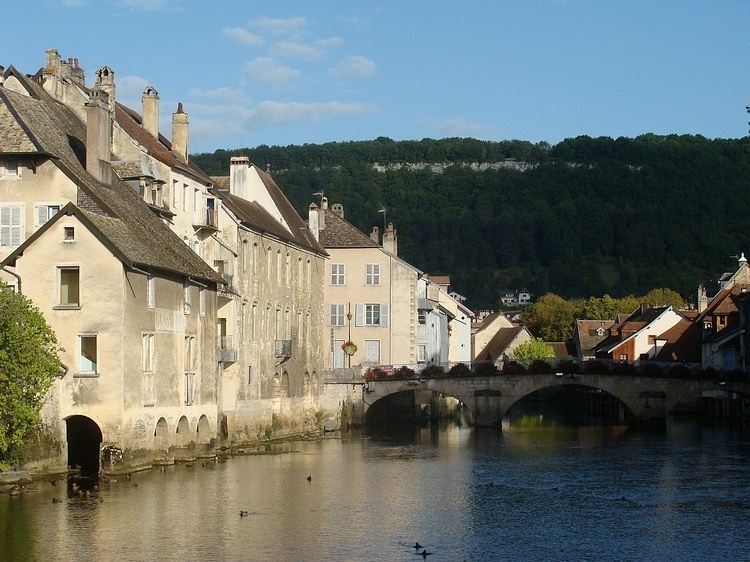 The Loue rises in the midst of steep limestone cliffs and passes the magnificent little town of Ornans and the very attractive villages Montgesoye, Lods and Mouthier-Hautepierre, which can match the most beautiful villages of France. 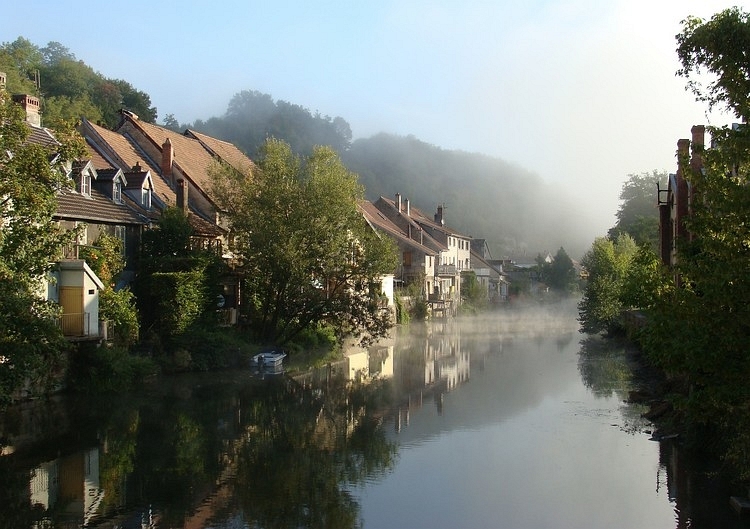 From Ornans I cycle through these villages to Mouthier-Hautepierre. From there I climb to the plateau on a tiny, steep road. 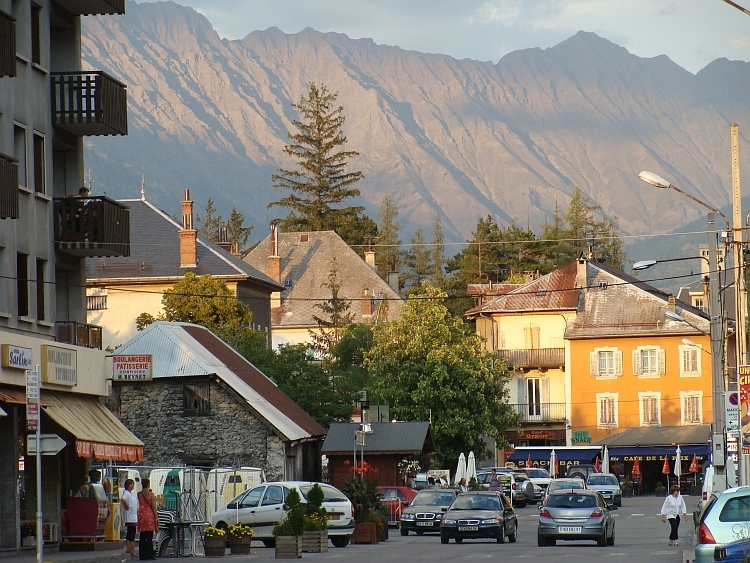 After an hour I am on the plateau and reach the village of Haute Pierre le Châtelet. 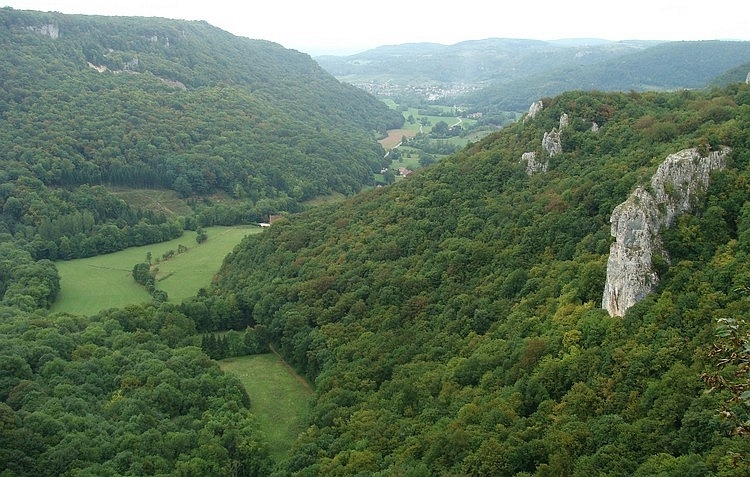 There is a viewpoint with stunning views through the valley of the Loue. 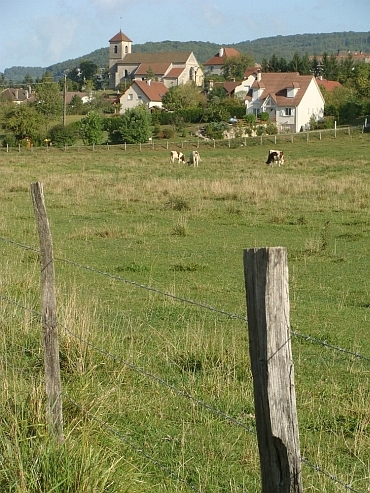 I am riding over the undulating plateau with the typical pastures of the Jura. There are beautiful cloudy skies above me. In the lush green patures dozens of cows are grazing. I reach Pierre Fontaine-les-Varans, where I acrap my lunch together in the local boulangerie. I am having lunch in front of the Church. There is sitting someone, who is having lunch too. It proves to be Luc, a Belgian cyclist, who is riding the Hundred Cols Tour. He has done most of the cols now, only a few cols in the Jura and the Vosges areleft. 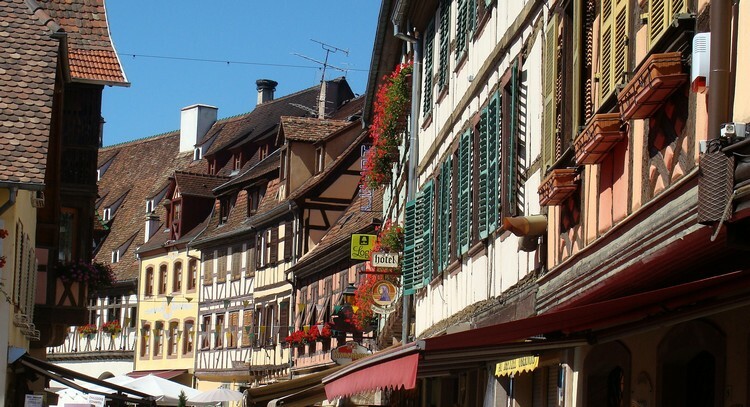 The Hundred Cols Tour takes in all well-known cols from the French Alps, the Pyrenees and the Massif Central and a few cols in the Jura and the Vosges. 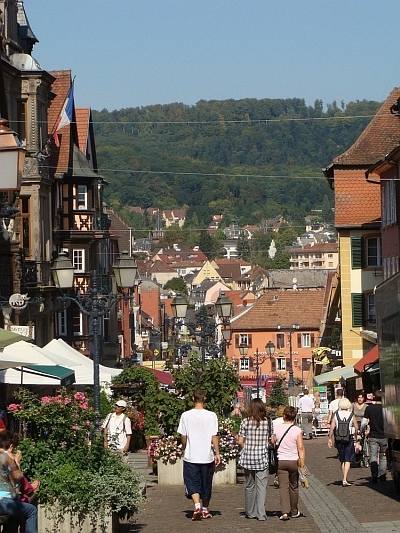 The tour ends in the Northern Vosges, in Saverne, in the Alsace. Together we cycle further north. The first fifty kilometres we will be following the same direction. 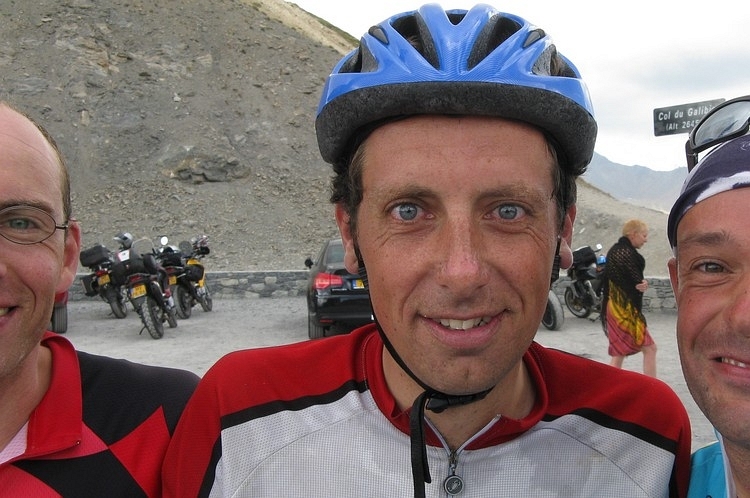 Luc appears to be an experienced cyclist and his bicycle tours have brought him in South Africa and in Southeast Asia. He is an excellent cyclist to be. He is more than 15 years older than me, but I do not need to adjust my velocity, even on the short climb to the Col de Ferrière. On the descent of the col, a piece of my bike saddle breaks. With a clatter the piece of aluminium bounces to the ground. There is no remedy here. With caution I continue the descent. One kilometre later my pedalstart to make awful, creaking sounds. I have the feeling that my bicycle starts falling apart. My bike is not a shiny new bicycle. My bicycle has lived a 110,000 kilometres of faithful service, and sometimes had to perform under the most difficult conditions. 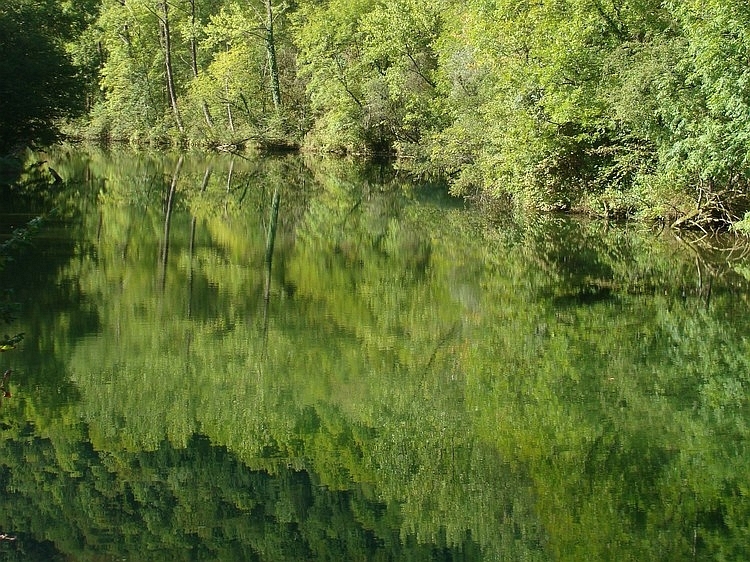 Luc and I arrive at the camping of L'Isle sur le Doubs. I ride into the small town, looking for a bicycle shop. It is Saturday afternoon and it is quite late. After some searching and with excellent help of the local residents and the receptionist I manage to find a dealer in used bike parts. But there is neither a fitting saddle nor a pedal. It is too late to continue to a bigger town and tomorrow the stores will be closed. This is a clear case of wrong timing. But I decide that the risks are not too big. The worst thing that can happen to the pedal is that it breaks. Then I have to walk. And the worst thing that can happen to the saddle is that it breaks and that I am lying on the ground. That is certainly bad enough to avoid but the chance is small. Moreover, I let the weak part of the saddle rest upon the luggage. I guess that this solution will do for one day. The weather is still excellent as I exit from L'Isle sur le Doubs. I am on my own again. I am traveling through the rolling countryside between the Jura and the Vosges. The last few weeks I have cycled through mountainous areas nearly all the time. Now I hardly have to climb and I feel like flying through the landscape. I am reaching Lure sooner than I expected. I have done the first fifty kilometres before I start the first real climb. From Lure I am riding up towards the Vosges. Soon the hills around me grow higher and higher. Only after twenty kilometres the real climb begins. In the meantime, I have apparently won altitude, as I have reached the top of the Col des Croix. 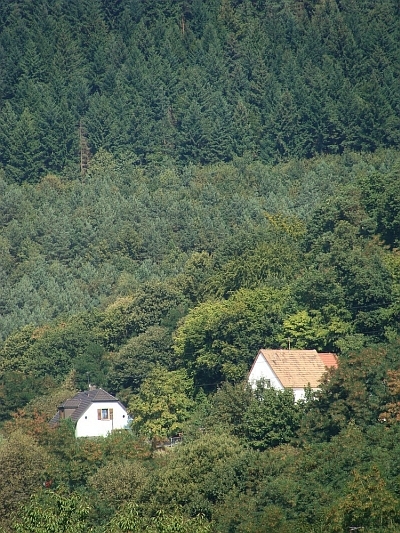 Here I have the first views of the green landscape of the Vosges. A short descent brings me on the foot of a new climb, the Col du Ménil. The climb can be credited as the easiest climb that I know and which is still appointed as a col apparently. The climb to the Col de l'Odéren is a real climb but the highlight is the ascent of the Markstein. The climb almost overcomes 800 meter altitude difference. The first kilometres are surprisingly steep. My pedal creaks horribly. Fortunately, the climb is much flatter after the first kilometres. On the top of the Markstein I reach the Route des Crêtes. The heather is already in bloom. There are beautiful views over the bare, rounded mountains. 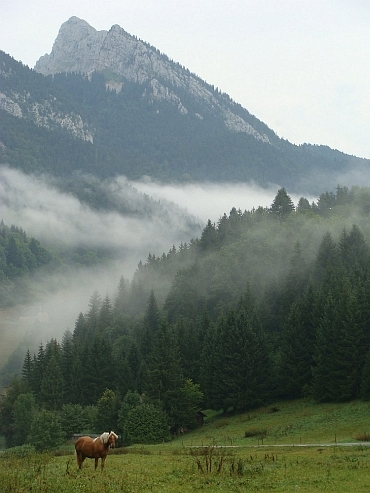 No trees do grow on the highest peaks of the Vosges. The view to West is extraordinary. The valley of the Rhine is more than one thousand meters below. 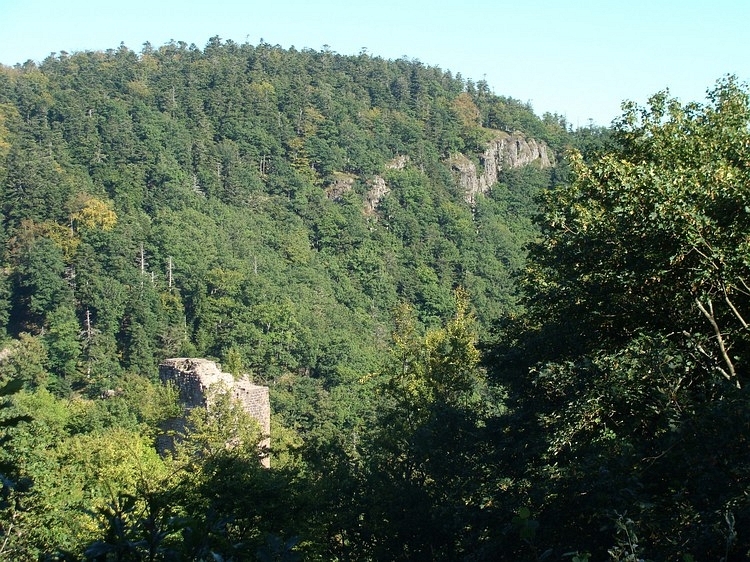 On the other side of the broad Rhine valley lies the Black Forest. The view to the south the most special. It is a very clear day and I can see the snowy peaks of the Alps. A moment of bliss. It is been six o'clock in the evening now and I still have a bit of cycling ahead before I will reach a camping. I follow the Route des Crêtes to the north. 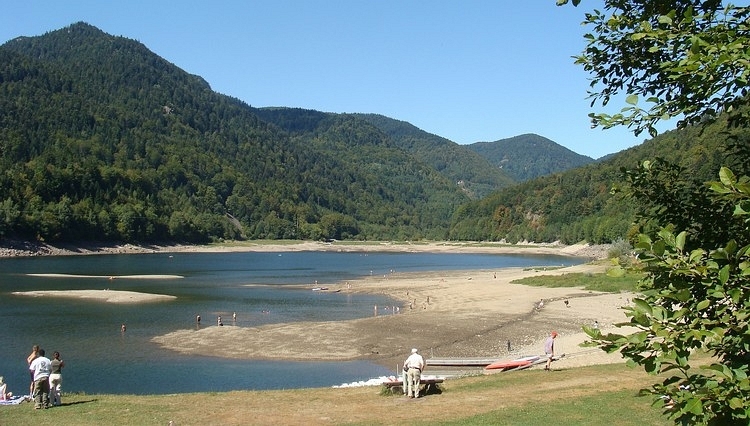 The Route des Crêtes was constructed by the army and leads along the highest peaks of the long mountain chain of the Vosges. The road is just above the tree line so that there are great views all the time. For me the route is not surprising, because it is the third time that I am cyling this way. From the Col de la Schlucht I go down towards the Alsace, where I have never cycled before. The sun is already behind the hills and it is pretty cold now. After the descent I reach Munster, where I find a campsite. Although Munster is very touristy, the camping is almost empty. The tourist season is over. That promises something for the next few days as I will not be in tourist places all the time. From Munster I go down towards the Rhine Valley. The plan is to have aquiett, relaxed, touristy day. 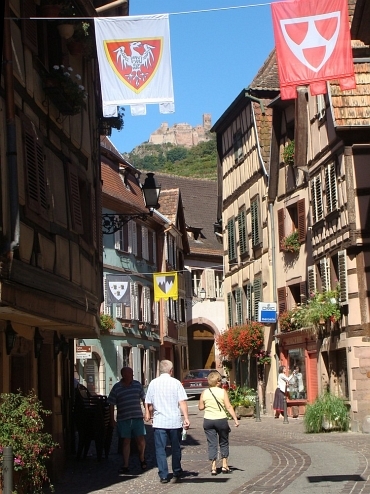 I want to travel northward through the Alsace. I will see where I end up today. Or where my bike will strand. The pedal is cracking louder and louder. Iam searching for a bicyle shop in Kaysersberg. When I finally find a shop, I find it closed. 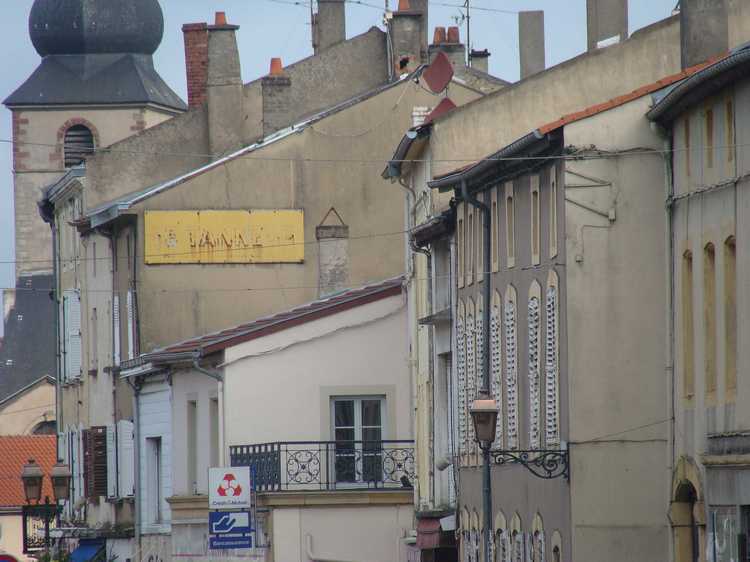 In Ribeauvillé there are even two repair shops. In the Syndicat d'Initiative I get the addresses. The first I cannot find and eventually it appears that the bicycle shop does not exist. The next bicycle shop is located just outside the village, but it is closed today. 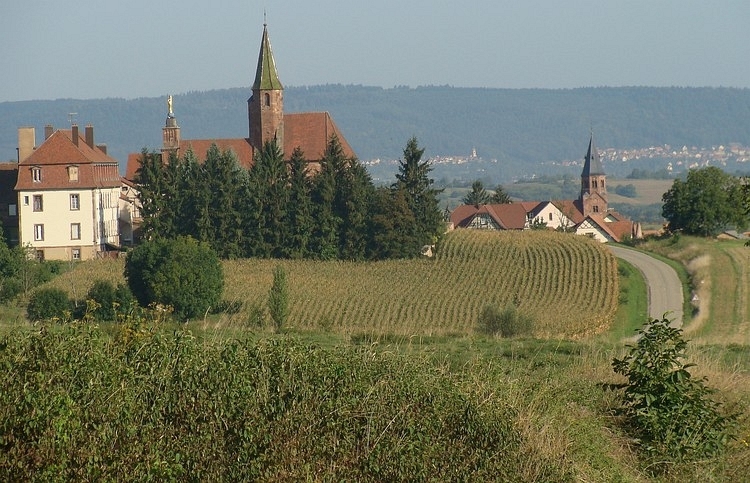 The Alsace is a beautiful area for cycling. 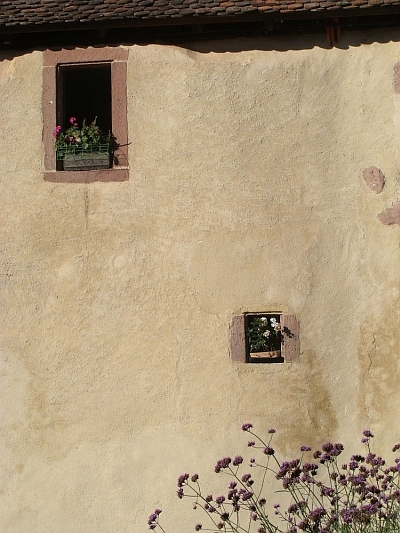 Everywhere are magnificent views of the hills of the Vosges. Sometimes there is a huge castle on a high hill. 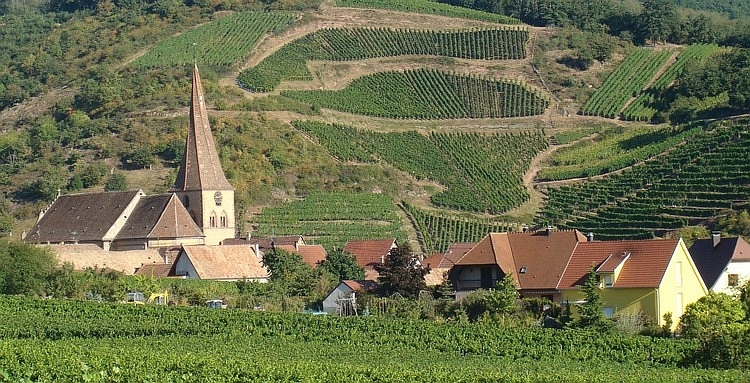 On the lower slopes are the vineyards. Small bike paths are winding through the landscape. And then there are the numerous villages and towns: Turckheim, Niedermorschwihr, Kaysersberg, Kientzheim, Riquewihr, Ribeauvillé, Barr, Obernai. These are the nicest places of today. But there will certainly be other beautiful places as well, which I have missed today. The atmosphere in the Alasce is more German than German, probably because the area is French now and not German. Like the Italian South Tirol is more Auatrian than Austria and Gibraltar more English than England. 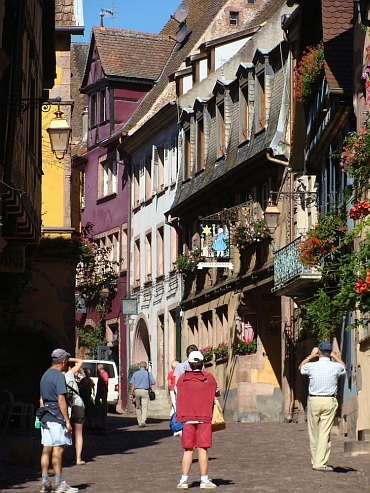 Alsace: that is half-timbered houses and lots of flowers. 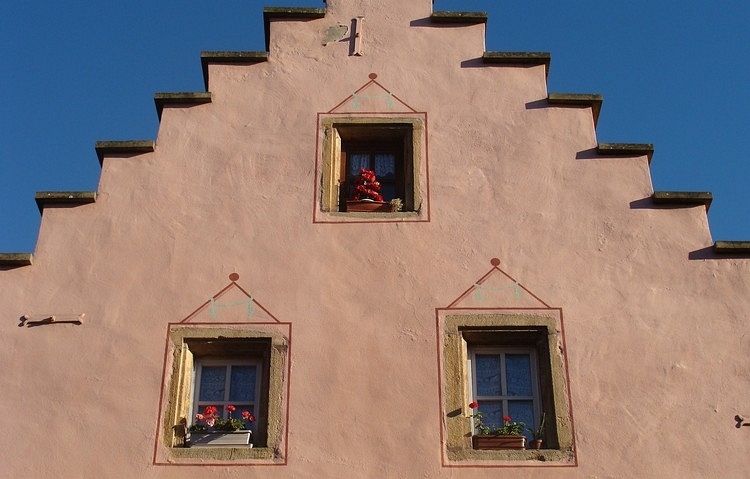 The houses are all equally beautiful, albeit not always on the safe side of kitsch. It does not bother me. The only thing that bothers me, is the squeaking and creaking pedal. In Obernai I try to find a bicycle shop again. One is apparently closed for good. After a lot of searching I find the other bicycle shop of Obernai. But today is Monday and Monday all repair shops seem to be closed. After Obernai I decide to ride into the mountains for a change, although it is already 4 o'clock. In the Syndicat d'Initiative of Oberhaslach I get a list of repair shops in the surroundingd. There are certainly repair shops that are open today, but not within cycling distance. There is no choice but to go on. From Oberhaslach it is upward to the Nideck. A road carries up through a dense forest with a lovely atmosphere. The road ends up to the old Nideck ruins. Just before the summit, the pedal shifts into a new phase. Where the pedal until now uttered a sort of free-jazz improvisations of beep-and cracking sounds, now it releases grim sounds that are even louder than before, but it is the nature of the sound that is truly horrifying. The pedal sounds more plaintive, desperate, like a long scream. Occasionally the moaning sounds are interrupted by a dead silence. But these silences do not last long; it is like breathing for air before the howlings return, more desperate than ever. I am feeling downright uncomfortable. I try to cycle as gentle as possible, but the pedal keeps on crying, wailing and screaming. The sparse, sharp silences feel like a reproach. Why so you do this to me? After all these years of service? Tomorrow, in Wasselonne, I bring you to the bicycle shop and there I will perform surgery, I whisper back. My soothing words are answered by a creaking howl. The camping of Wasselonne is nearly extinct. I am drinking coffee with one family that is still having holiday, but also this family will go back home today. The season is really over, despite the beautiful weather. After the coffee I am searchin for nike shops again. The first bike shop is closed. But I have another chance, just outside the city. I am riding on the busy national road to the bicycle shop. Closed again, this time because of holidays. I am desperate. 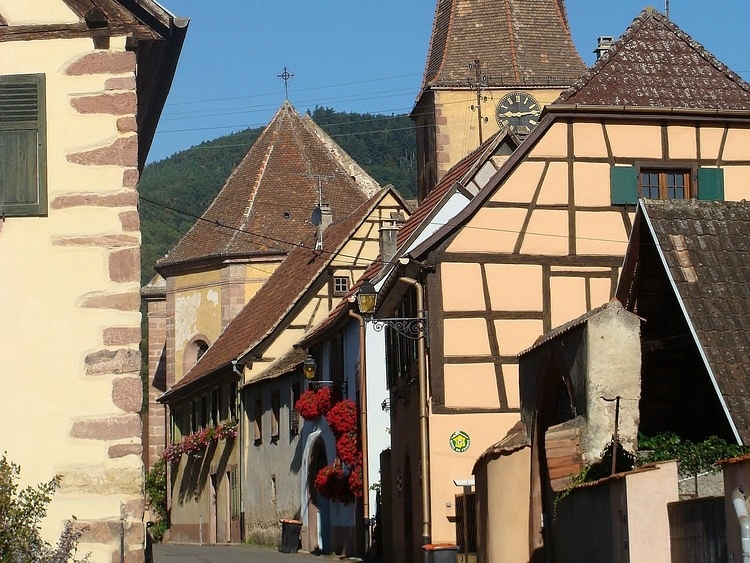 There is only one place with bike shops left in Alsace in the direction home and that is Saverne. After Saverne there will not be any possibilities to change the pedal and the saddle for a long time. The N4, the national road from Strasbourg to Saverne, is too busy for me, so I leave the road for a tiny pathway through the hills northeast of the road. 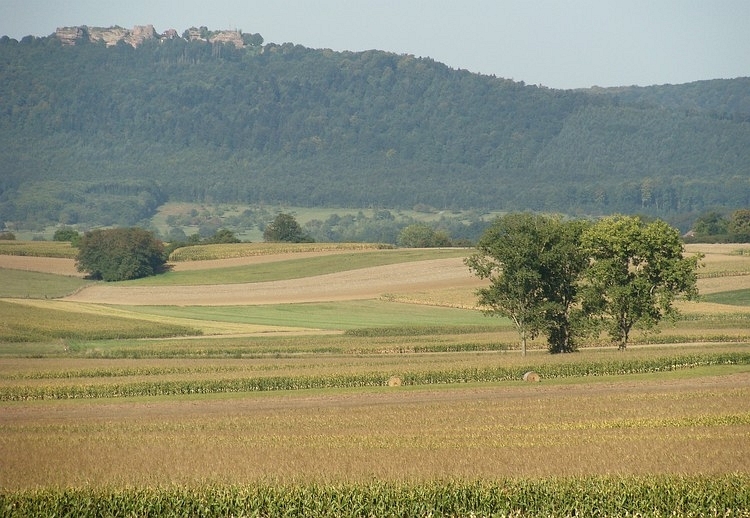 The beautifully dark hills of the Vosges are making a striking contrast with the sweet corn fields. The serenity of the countryside is only shattered by the constant wails and whines of the pedal of my bike. This problem must really be solved. I am glad to reach Saverne without problems. Luc was planning to reach Saverne too today or tomorrow. Maybe I will meet him later on when I am crossing the Vosges. It is eleven o'clock now, so I must hurry to find a bicycle shop. If I am too late, the shop may be closed untill 4 o'clock and then I will not cross the Vosges today. I just cannot find the bicycle shop of my list but then I coincidentally find another one. And fortunately they have the right components. Twenty minutes later I am outside gain, with new pedals and a new saddle. And I am able to continue, from now on in a normal way. A serene silence. I am climbing up the hills of the Vosges for the last time. The Vosges in the north are not nearly as high as in the south but the landscape is not less special. 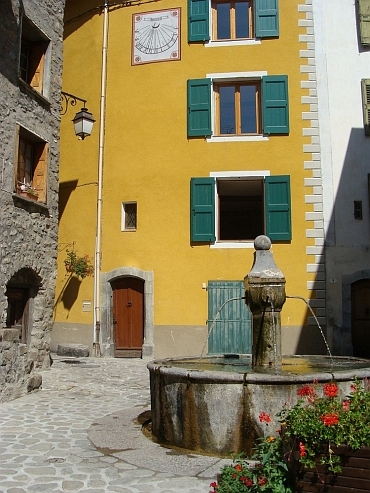 On top of the pass lies the old town of La Petite Pierre. There could have been a nice view, but in a very short time thick clouds have been collected in the west. It is serious business up there and suddenly a violent storm is developing. Unfortunately I need to go in the direction of the clouds and I will have to face serious head wind. It is seventy kilometres from here to St Avold, where a camping and hotels can be found. I descend immediately, the circumstances will not improve. 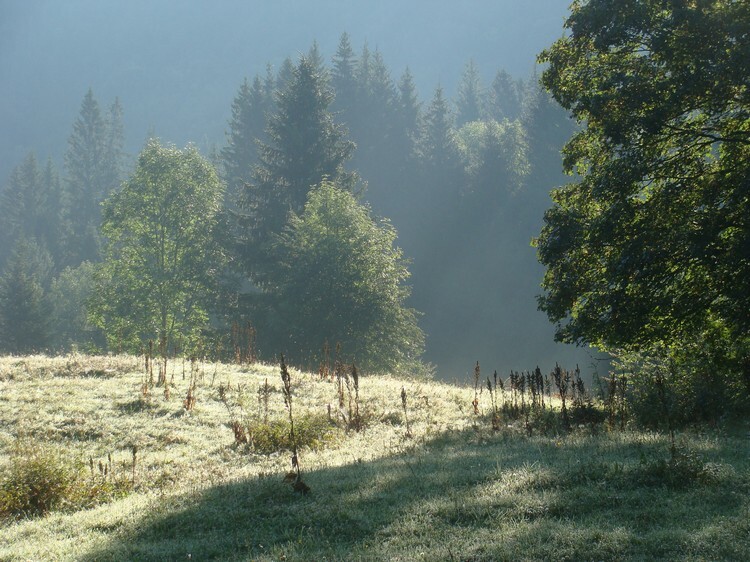 I have left the forests of the Vosges now and I am in the meadows of Lorraine. Every kilometre is more difficult than the one before with the rising storm. I reach Sarre Union. It has not rained yet, but the clouds in the West are much darker than in the East. I decide to continue whatsoever. At least it is still dry now. Forty kilometre to go now. It begins to drip. Thirty five kilometre to go. Ahead lies a very heavy rain shower but that one will rush along. From the West even darker clouds are coming, but it has been like that all the time and still there has not been any real heavy weather yet. Thirty kilometres now. The howling wind rages across the landscape. A second heavy shower also misses target, this time the storm is sailing along on the southern side. Still twenty-five kilometres. With a frenzied effort I am able to get along. Only five kilometres and then the road will turn, then I will face the wind from aside. In the West is an unearthly dark sky. Twenty kilometre yet. The curve. Now I am cycling to the north. No head winds any more. The black sky is almost above me now, this time I will not be lucky again. Yet seventeen kilometres. Sometimes I am almost blown off my bike at extreme blasts. But still no rain. Fifteen kilometres. Then the rain finally begins. Immediately I get the full treatment. Giant drops fall down in massive overload. Within one second I am completely soaked. It is a great hedge of rain, I cannot see further than a few tens of meters. This is crazy, on this busy road. I hide under a cover, but it is raining so hard that it does not offer a solution. I decide to continue. The wind has strangely disapperead and the ridiculous rain intensity is screwed down to a strong but normal rainfall intensity. The road has almost become a river. My brakes do not perform too well in these ultrawet conditions. But the wind has stopped now and I make a lot more progress. I reach St Avold and climb to the camping, which is also a youth hostel. In this case I do not mind to avoid the camping in favour of a real dry place. When I wake up, it is dry but cloudy. There is a strong wind but no storm like yesterday. The wind has turned from west to southwest. A favourable development for after fifty to sixty kilometres to the west, I will ride to the north from the Luxembourg border. And so I will probably have back wind from theLuxembourg border. It strikes me that Lorraine is such a peripheral region. I have crossed this area a number of times, but always from north to south. In those cases, it is pleasant to be here. It is France and it has a southern feel if coming from the north. Now I feel the opposite. From Nice to the Vosges I have cycled through beautiful landscapes. Lorraine is also interesting in a way but introverted, gloomy. And then the dark, autumnal weather does not help to brighten things up. There is a special atmosphere this area. I am not sure whether I like it or not. For a moment the inward atmosphere is suspended. 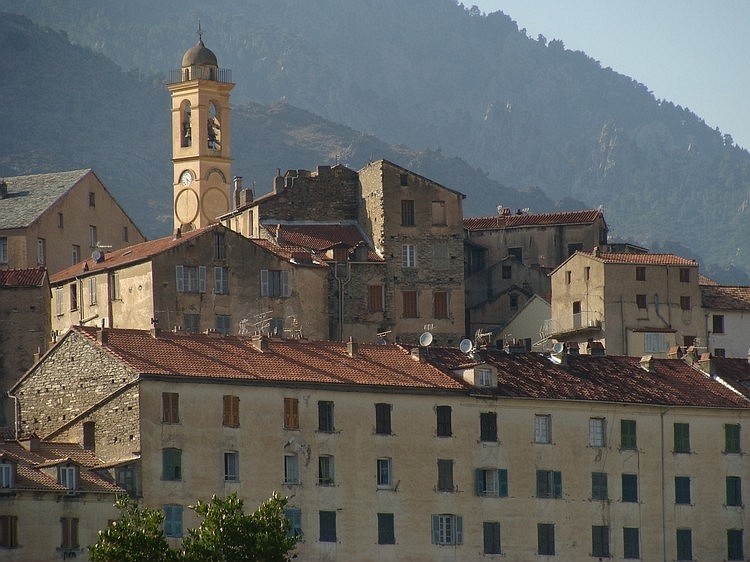 Bouzonville is a pleasant town with aa liveliness that is missing in the surrounding villages. Then again, the atmosphere is just as introverted as before. I am pedalling away the last French kilometres now. After almost nine weeks the journey is almost over. Just a few days and I will be home. It would have been nice to get back home in a festive mood with nice weather. But that will be highly unlikely. 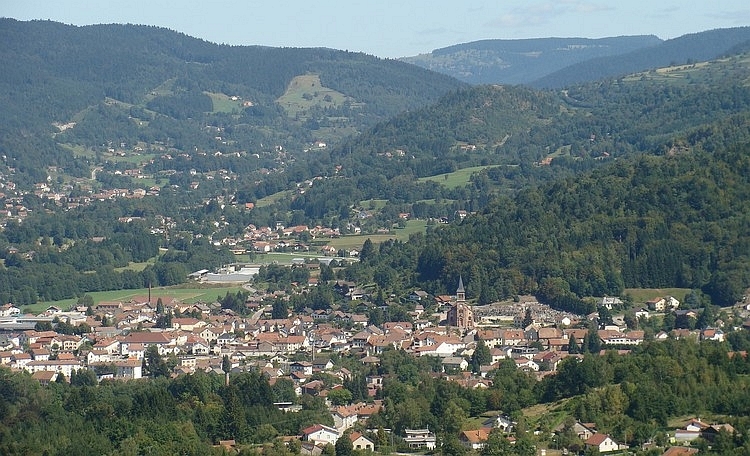 I descend to Sierck les Bains, to the valley of the Moselle. From now on I have the wind in my back. I am riding along the Moselle to the north and I cross the Luxembourg border at Schengen. Luxembourg looks reaaly tidy and prosperous, especially if you are coming from the south and certainly if you have traveled intensively in countries outside Europe. For me, the atmosphere is not attractibe, although the scenery is beautiful along the Moselle. It strikes me in retrospect that the peripherous atmosphere in Lorraine is more special for me than here. What is that atmosphere? If you are not feeling in tune at a certain place at a certain time, is that due to yourself? Or to the environment? Or is it a combination? I am convinced, that this is an interplay. The combination is not optimal here. But I have the wind in my back and I am flying over the roads without much effort. From Echternach the landscape is more scenic. 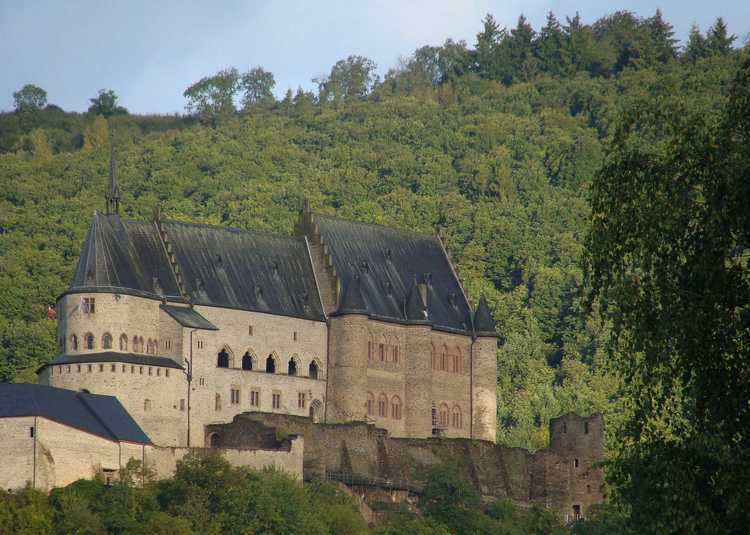 Vianden is a beautiful town. Here I go camping. I set the tent on the camping that is virtually without guests. A long and heavy shower begins and it will not be dry any more. It has poured all night but as I wake up, it is dry. The few camping guests will all leave today. The weather will be miserable the coming days: stormy weather with heavy showers so there is no reason to stay. For me it is clear that there will be no nice strolls in the Ardennes: I will go a straight and fast as possible. The campsites will be deserted. It will rain and storm. It will not be too much fun, I am afraid. So I will try to get back home as quick as possible. But I want to bike home for sure. To make the circle complete. I do not want to give up so close to the end. Through the valley of the Our I am riding north. After ten kilometres it starts to pour. In Obereisenbach I leave the valley of the Our to climb to the plateau. Halfway through the climb, the rain suddenly stops. For a short time I follow the busy N7 on the plateau from Hosingen to the exit road to Clervaux. On the plateau the wind has free play. The wind is coming from the west so at the moment the wind comes from aside. The heavy wind blasts nearly knock me off my bicycle. I take the exit road to Clervaux and I head against the wind but soon the descent leads through a forest, so I do not have toom much trouble with the wind any more. I reach a viewpoint with sights over the beautiful little town of Clervaux. The sun breaks through for a few seconds just as I arrive. I take a coffee break to collect courage, then I travel on again. I climb to a new plateau. For the first time I am riding with full head wind on the plateau, I am gaining only very little progress at the expense of big efforts. 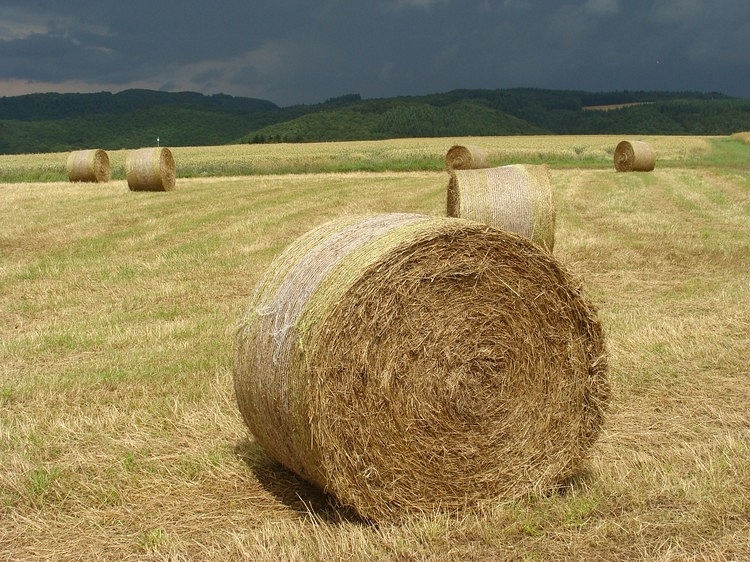 The Ardennes: that means endless vistas and gray clouds that are hurrying over the countryside. Occasionally a shower is visible on the horizon. Barely fifteen minutes does it take before the shower is above me and another fifteen minutes later, the shower has already gone. But in the meantime I am completely soaked. Luckily the same wind is drying my clothes quickly too. I cross the Belgian border and descend into the valley of the Ourthe. A new climb brings me at the broad N68 to Malmédy. On the descent to the Amblève another ruthless rain shower comes down on me. All splash and I can hardly see anything. In a hidden chips stand I take the opportunity to have shelter. After a lunch break I continue, the shower is nearly over. 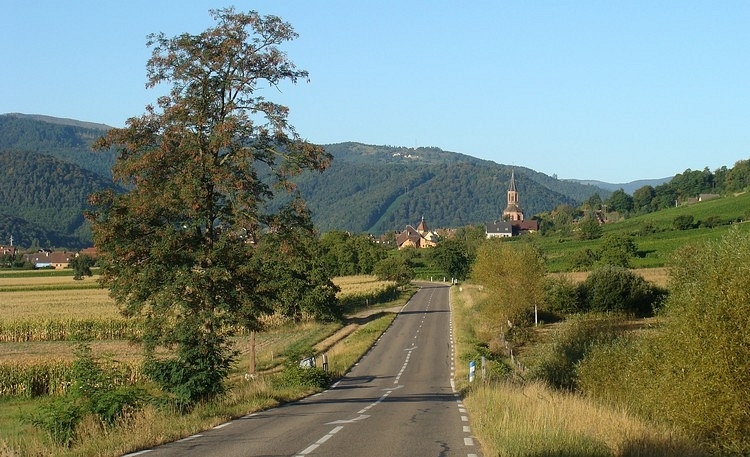 The N68 is too busy, way too broad, but the road leads through the valley of the Amblève and is quite flat. And very important: there is not so much wind. And the path leads straight north, exactly the right direction. I cycle through Vielsalm to Trois-Ponts. I continue to follow the Amblève to Stoumont. Following the road along the river any further does not make much sense. It means a detour and extra headwind to overcome. It is better to climb the Stoumont. There is no shower to be seen now, which is beneficial for the descent. I prefer to desecnd on dry roads. The roads in the Ardennes can be quite steep and descents on very wet, ateep roads is difficult and unpleasant. If I am on top, I see that a new shower is coming in my direction. I am just down and the shower breaks loose. I reach Spa and I cycle through Theux to Verviers. The places look bleak and gray, especially if you are used to Mediterranean atmospheres. I get lost in Verviers. So there proves to be one similarity between Italy and Wallonia at least. The wind is only increasing now. Where does this end? It has been one of the most extreme cycling days so far and I hope that it does not get even worse. In Hervé the road is closed and I have to makke a detour over the busy N3, an altogether very unfavourable direction. Now I am riding with the storm in the back to the east. I hardly need to pedal and sometimes I even have to use my brakes to avoid uncontrolled velocities. I am flying over the road, unfortunately still in the wrong direction. I had the idea of cycling to Maastricht to take a small hotel there, but now I am blown almost ten kilometres aside to the east. 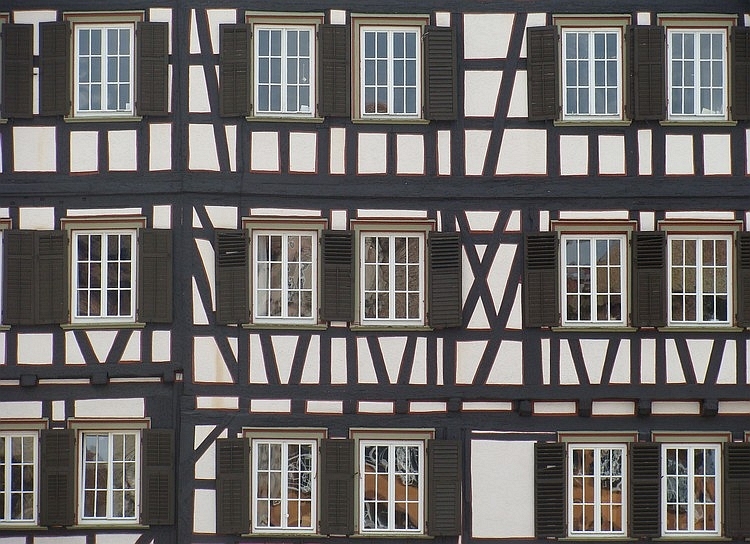 I decide to stay in one of the villages of southern Limburg. I reach the Dutch border at Slenaken. I cannot find a cheap hotel and cycle further to Gulpen where every hotel appears to be full. In Stokhem I find a camping. The bad weather seems to be over and there are suddenly big blue pieces of sky. The wind has not really decreased but the camping is exactly on the wind free side of the hills, so this place is not affected by the stormy winds. I am as good as alone at the campsite, the only tent is mine. But I am glad that I have found a campsite. It is beginning to get dark. I take a quick shower and in the dark I cook my meal. After dinner I soon go to bed: it is far too cool to be out. I get up by first light. I want to cycle to my house in Bunnik in one day. That is certainly 200 kilometres, so I will need every minute of the day. It is still stormy weather but it is dry. While it is overcast, it does not look like heavy rains will enter soon. 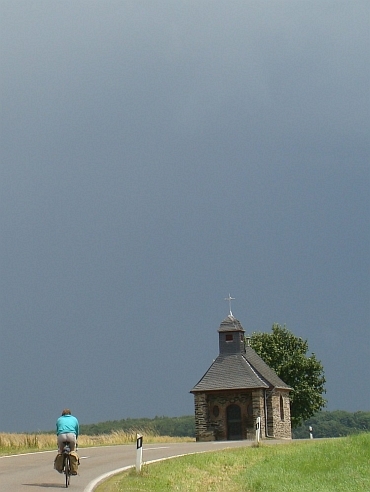 I am riding out of the Limburg hills, and along the Meuse I cycle to the north. Occasionally I pass pretty villages or a tiny church. The wind is more back wind than head wind and I make good progress. From Maaseik I temporarily follow the Belgian side of the Meuse. 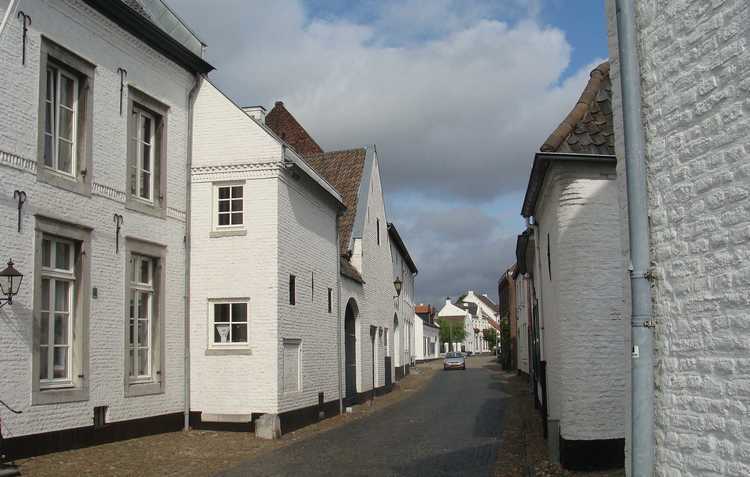 I cross the Dutch border again at the white village of Thorn. The wind slowly turns from west to northwest and that changes everything. Now I have the head winds virtually all the time. I try to plan passages to the west in forests. This works pretty well untill the village of Mierlo. I had planned to cycle through Nuenen in order to circumvent Eindhoven. But the road is closed and so I still find myself searching a way through the city of Eindhoven. Through Best, Boxtel and Vught I travel on to 's Hertogenbosch. The wind suddenly begins to swell to a storm. Again. In extreme blasts I am almost ripped of my bike. All the time I need to be concentrated. Dark clouds are flying in from the northwest. This is all wrong. It is still fifty kilometres to my home. I would like to be home now, I would like everything to be over, no worries anymore. The first shower has missed. Still forty-five kilometres. Full wind. Sometimes I am coming to a screeching halt. It takes a madman effort to continue. Zaltbommel. Still forty kilometres, the wind is gathering and the first rain starts falling. Geldermalsen. Thirty kilometres to go. A few drops. Dusk. Still twenty-five kilometres. A huge downpour. Alone in the flatlands. I can barely match up against the wind. Culemborg. Twenty kilometres. The ferry over the river Lek is already there. It is almost dark. The ferry is on the other side. 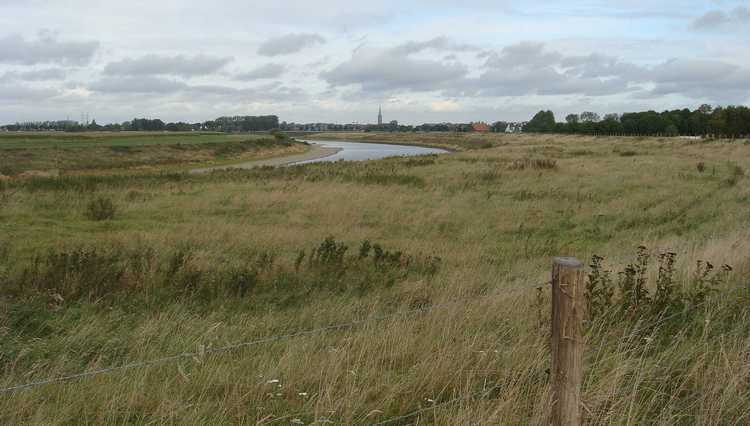 I cycle through the flat polder to Schalkwijk. I am cycling through the heavy rain torments in the blackness of the night, fighting my way through the rain gusts. Fifteen kilometres. 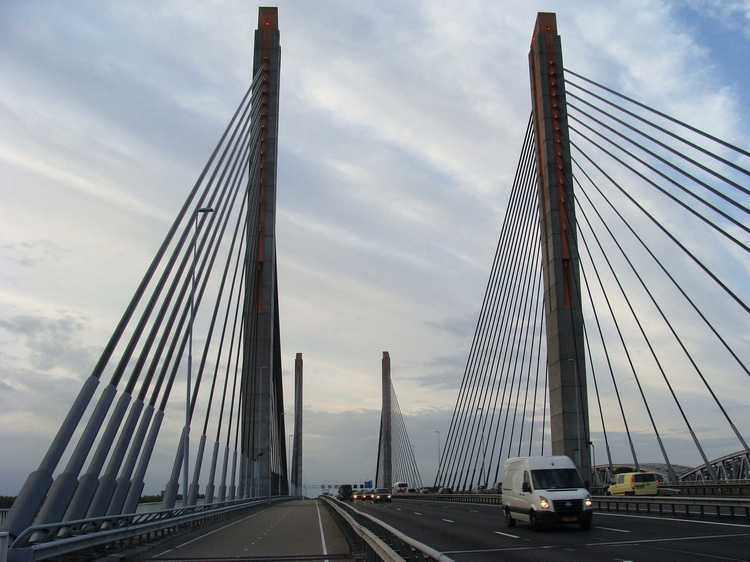 The bridge over the Amsterdam-Rhine canal. Houten. Only ten kilometres. The extreme wind has stopped now but the rain will not stop. It's raining very hard now but it is not a cloud rupture anymore. The last five kilometres. Nearly there. It is a strange way to finish such a journey. No opportunities to celebrate the accomplishment. The last kilometre. I reach Bunnik. The last four days were very extreme with these stormy circumstances. Never have I felt so rushed during my travels. And that on the last days of the trip. Until the last minute. But it is over now. I see my house. I have made it.